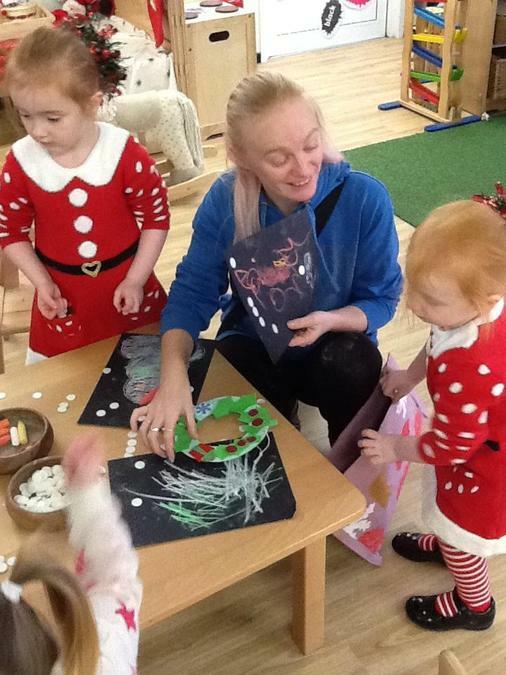 Today we have focused some activities to encourage the children's coordination and fine manipulative skills, we based the activities around the Christmas theme to engage the children's interest. 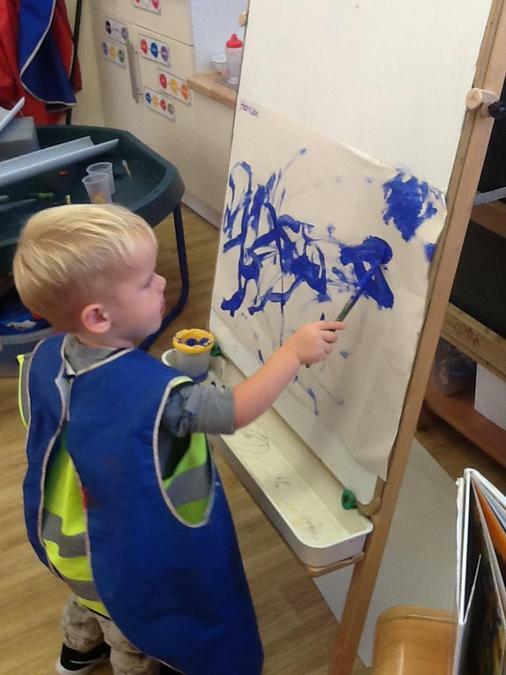 All children were very focused, they showed good skills as they used their hands and tripod/pincer grip to carry out activities. 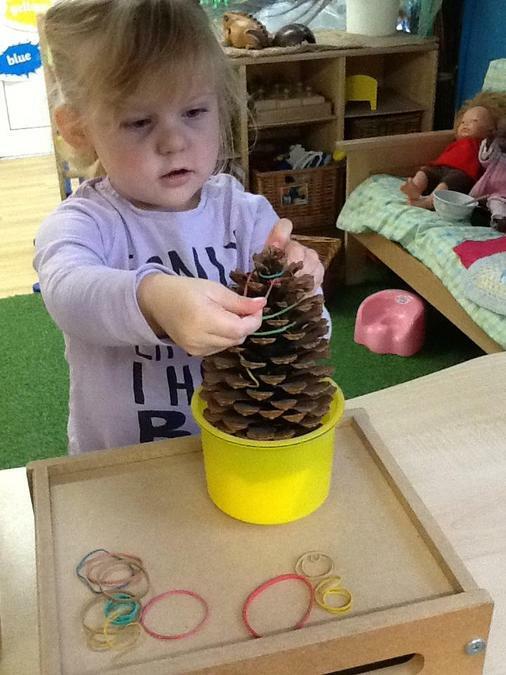 We used a pine cone set up as a Christmas tree and used elastic bands that the children had to stretch using a pincer grip to decorate the cone. 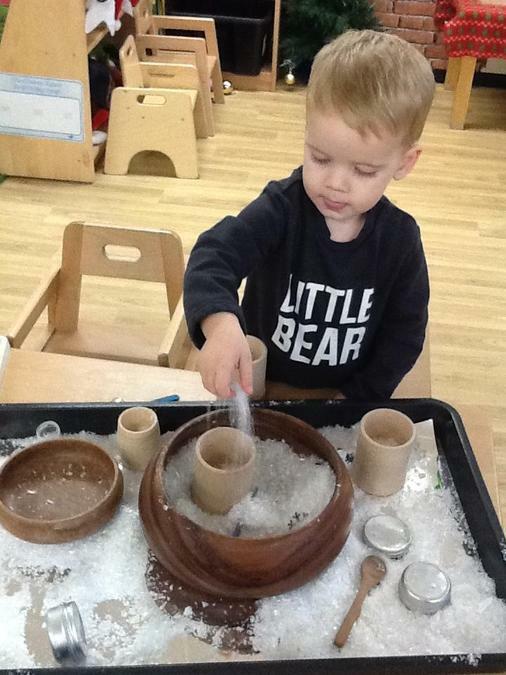 A sensory activity where the children used their hands and fingers to scoop up the snow and sprinkle into pots to fill and empty. 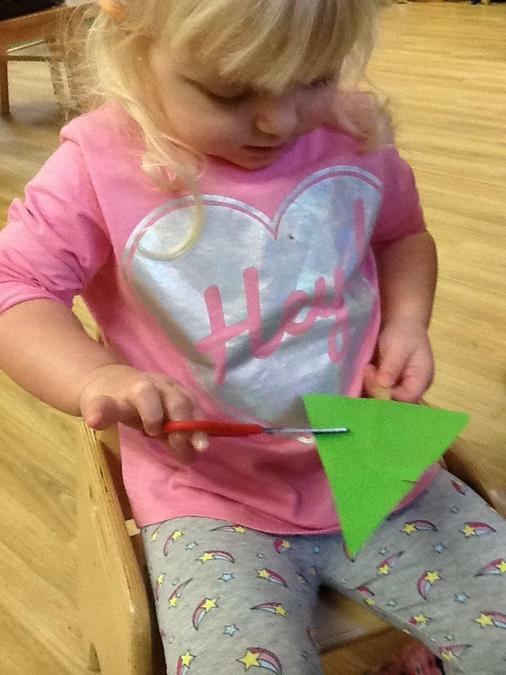 The children then used scissors to make snips into a Christmas tree shape to create the effect of the leaves, we used a lollipop stick that was stuck to the tree to aid the children to keep their fingers away from the scissors whilst they cut, this helped with the children's coordination. 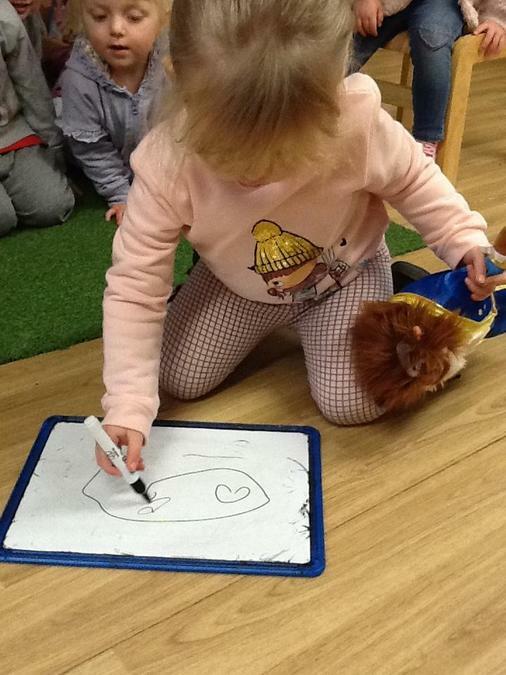 All these activities are simple but so effective as it helps them to develop the coordination skills and tripod/ pincer grip needed to develop writing skills as they get older. 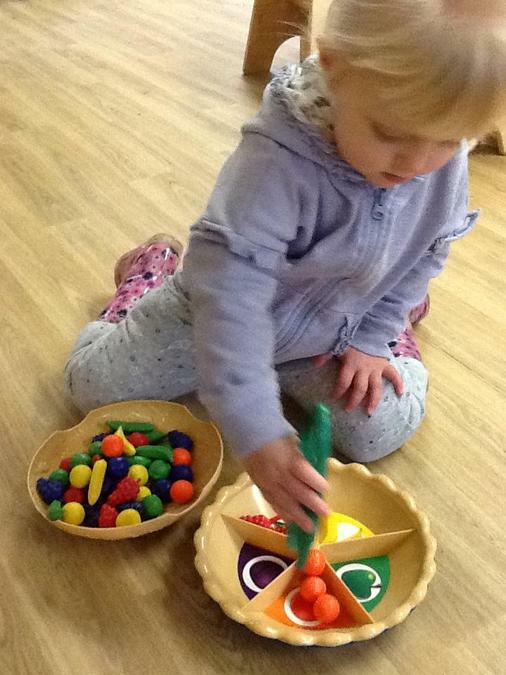 Why not try some activities at home as well as developing coordination and fine manipulative skills, these simple play activities can help improve concentration and focus. 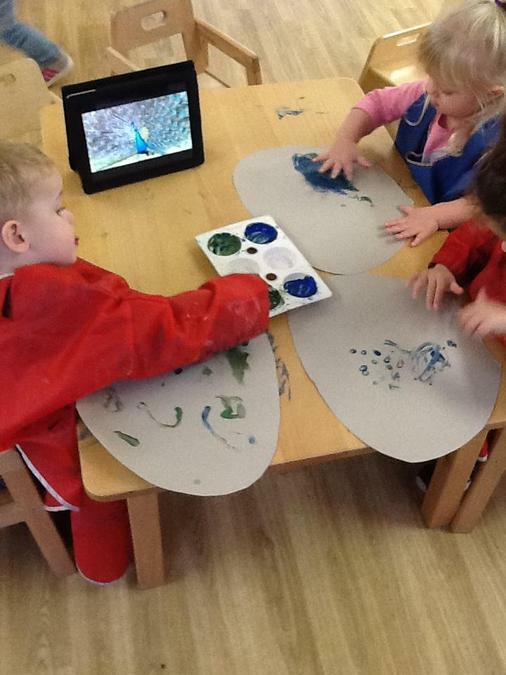 The children showed interest in a picture of a peacock, we looked at the different colours on the bird and one child even said, "That look like eyes on them feathers that go up." 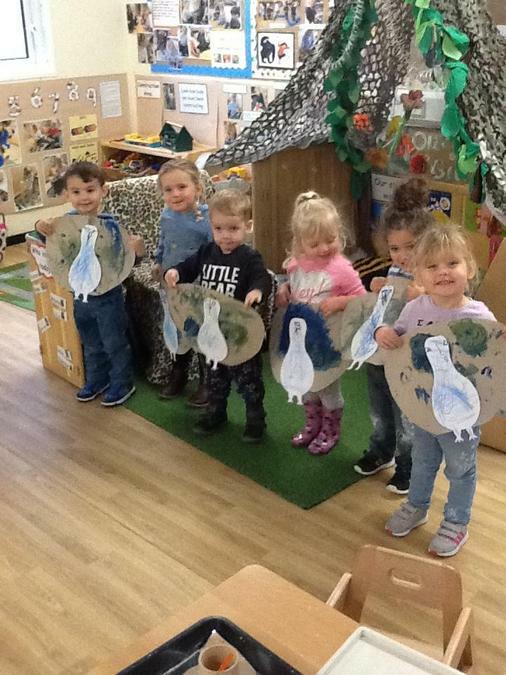 We spoke about how the peacock will put their feathers up if they feel scared and shake them, the children all pretended they had feathers by putting their arms in the air and shaking them like a peacock. 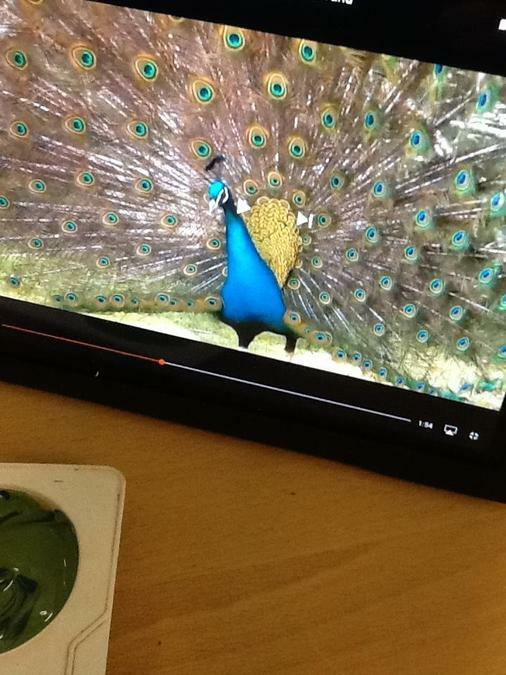 For the children to really experience how the peacock looks and moves we watched a video clip, the children were fascinated by the sounds the peacock made before rising its feathers. 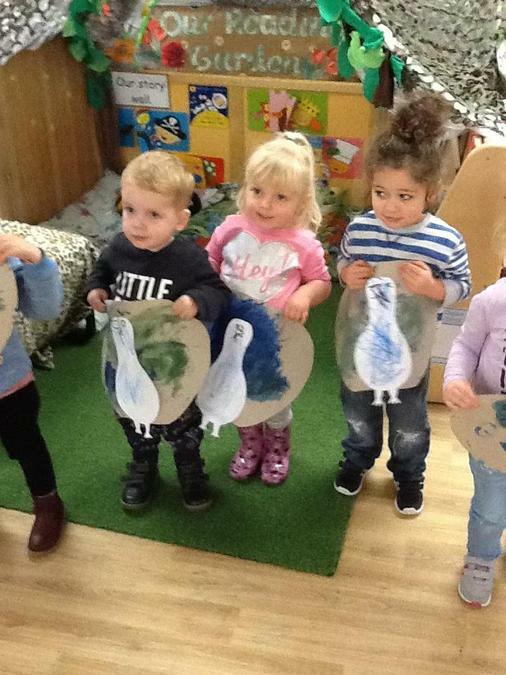 It was suggested by another child that we paint a peacock so that's exactly what we did. 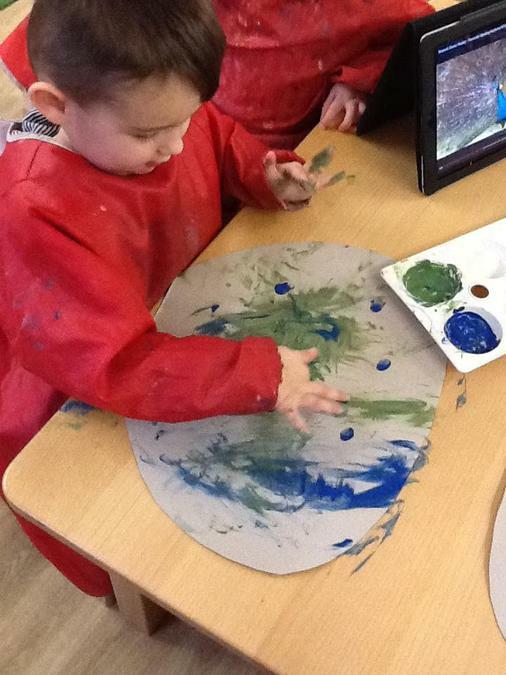 The children were encouraged to use their fingers in the paint to create circles to represent the eye shapes on the feathers, the children named the colours green and blue and they explored the texture of the paint and what happens when colours are mixed. 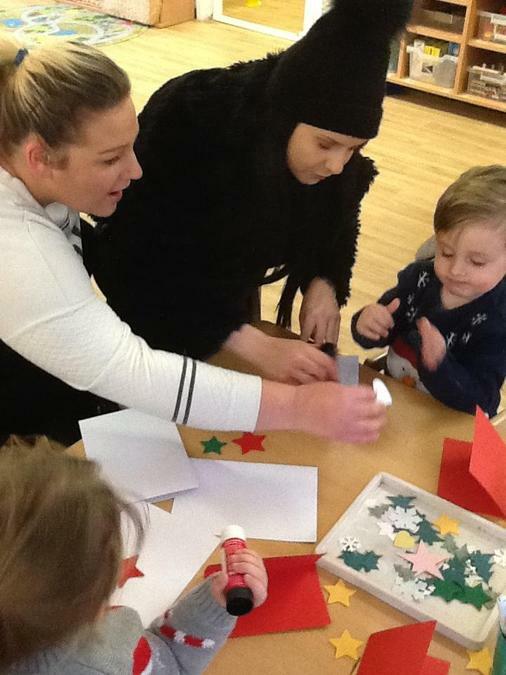 Thank you to all of you that joined your children today, it was lovely to see you all so involved with your children making some Christmas crafts, we hope you enjoyed our Christmas songs. 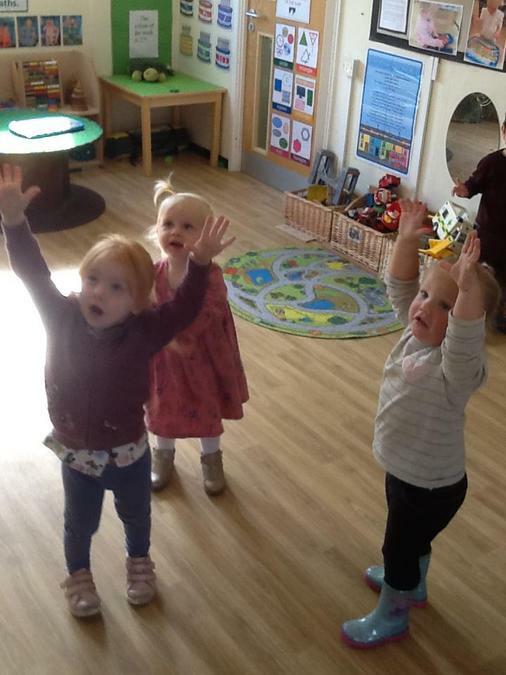 May we take this chance to thank you all for your continued support within Nursery, it's been our absolute pleasure looking after your children and watching them develop. 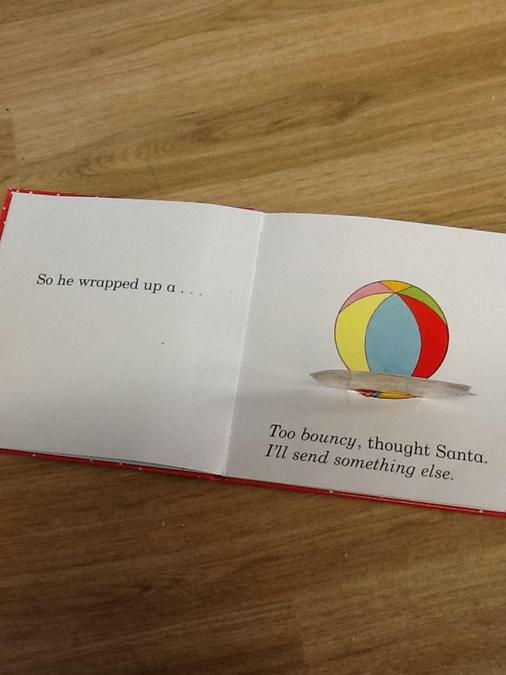 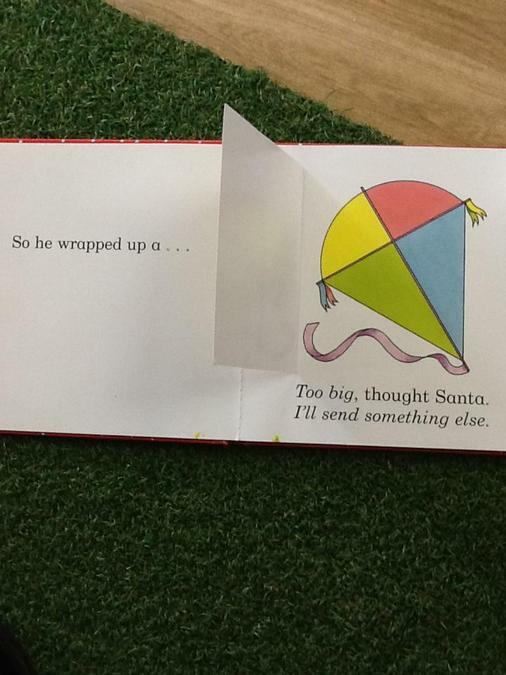 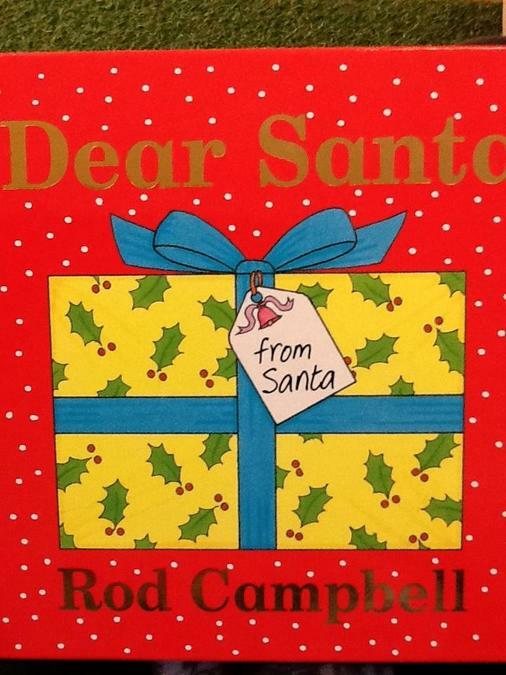 This week the children have been exploring the story of Dear Santa. 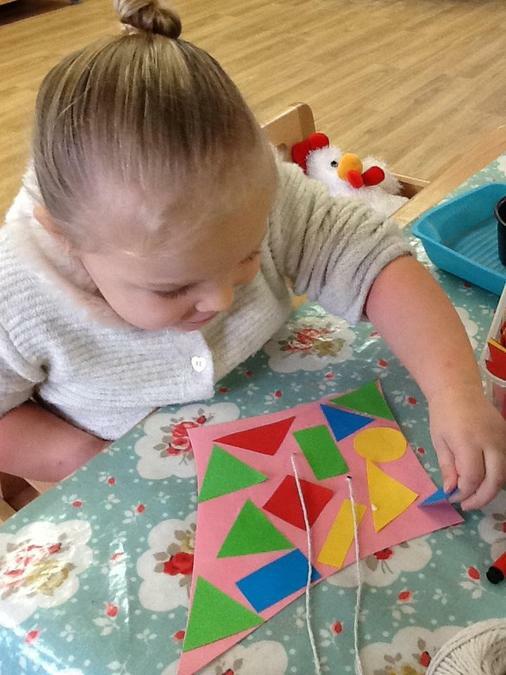 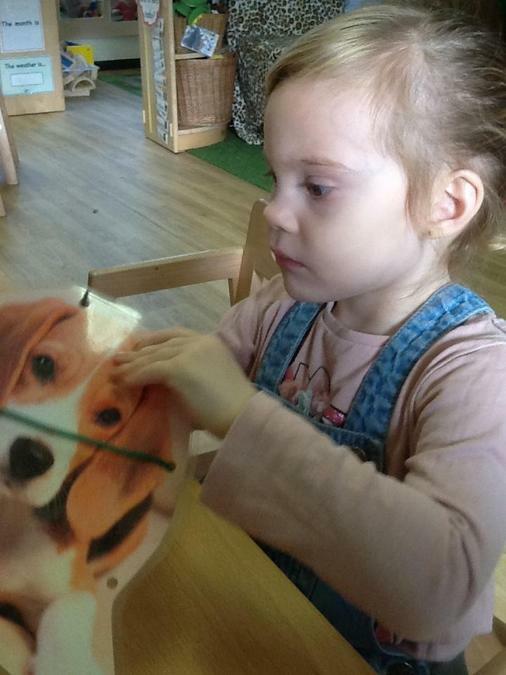 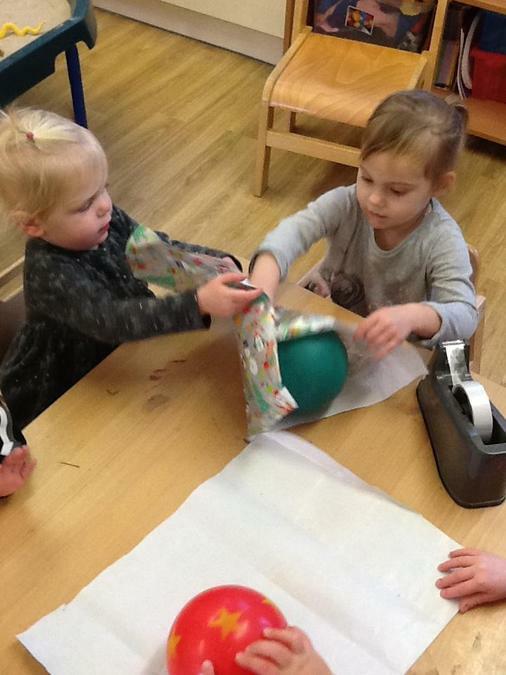 We have read the story together many times and have done lots of fun activities which are linked to the story such as kite making, mixing paint with their fingers and wrapping 3D shapes and objects. 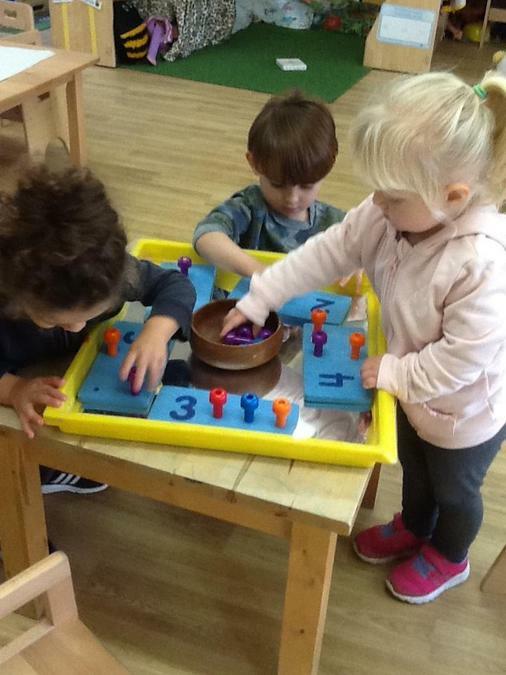 The children worked together well and the amount of language that was used was really impressive. 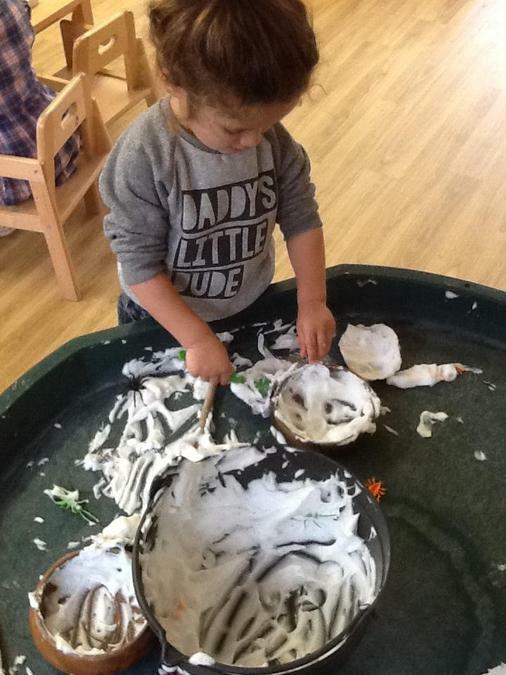 All children were engaged and focuses throughout all these activities and they also repeated them independently in their play later on in their session. 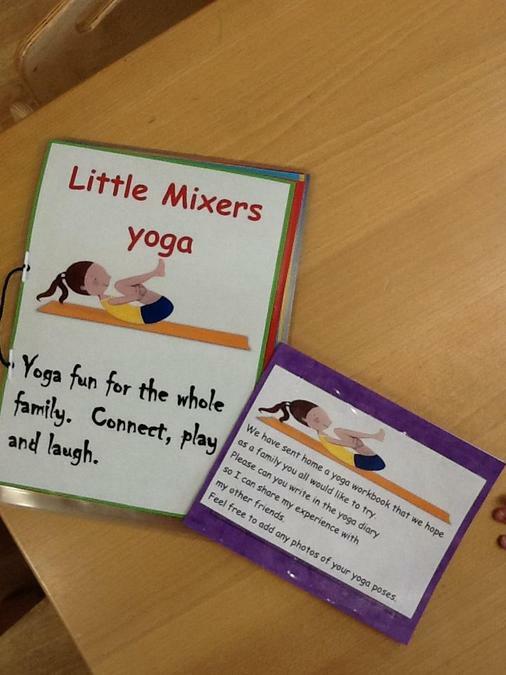 Our Littlemixers Yoga book is now coming home with your children, this a wonderful chance for the family to come together and have a bit of fun. 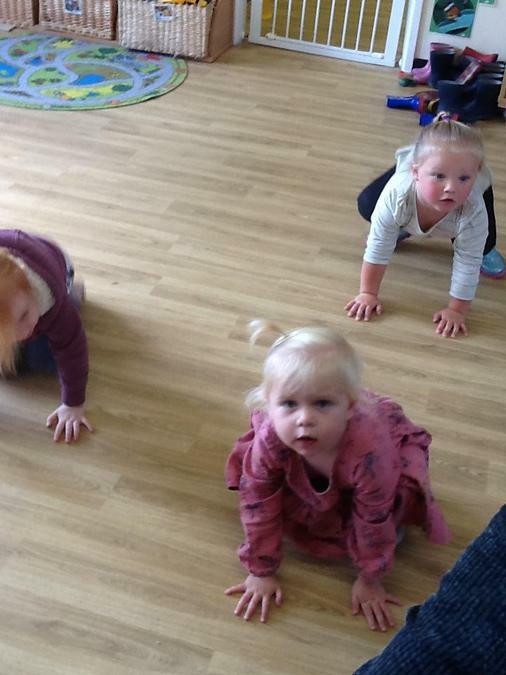 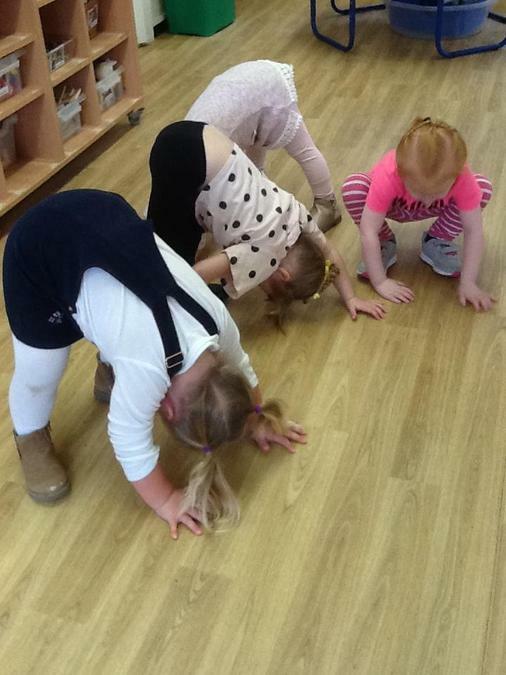 The children have been doing these yoga moves at Nursery with all their friends, it's great to see them moving their bodies in different ways and trying to hold their stretches whilst trying to balance. 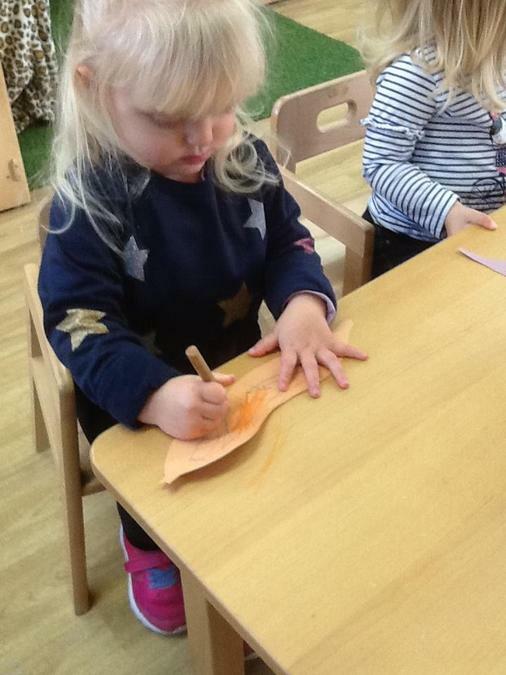 We do have a yoga feedback book that also comes home so we look forward to hearing about the fun you have, if you wish to share any photos then please add them to the book. 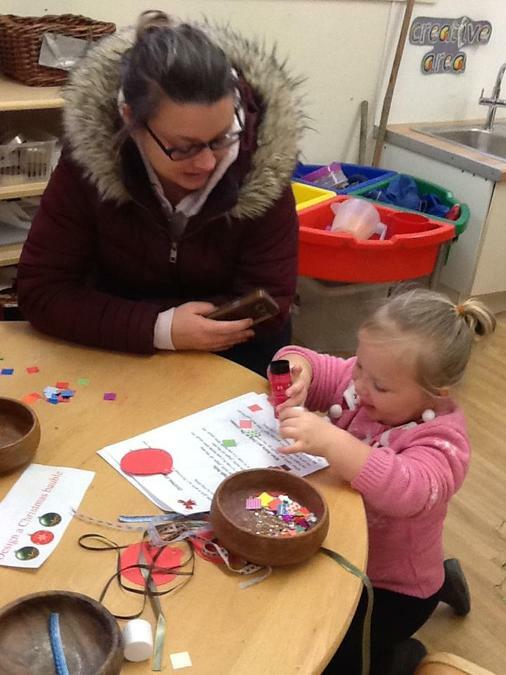 Can we take this chance to say thank you to the families that have already taken part. 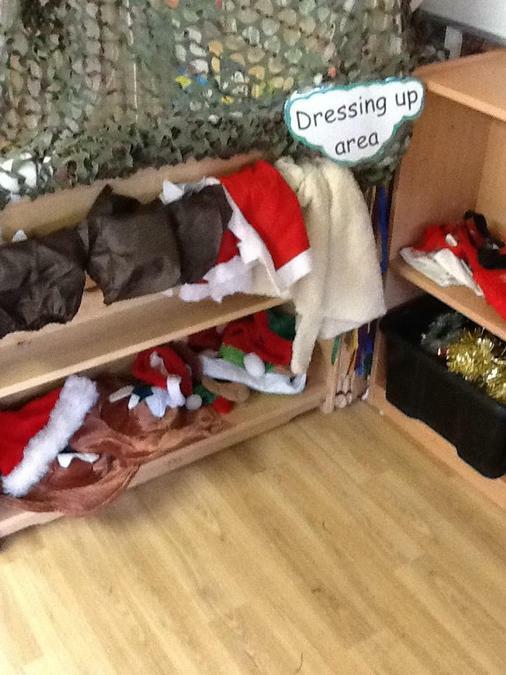 So this week we have all got a little excited about the fact Christmas will soon be here, needless to say this excitement led to us changing our role play area into a Christmas theme and putting up some decorations. 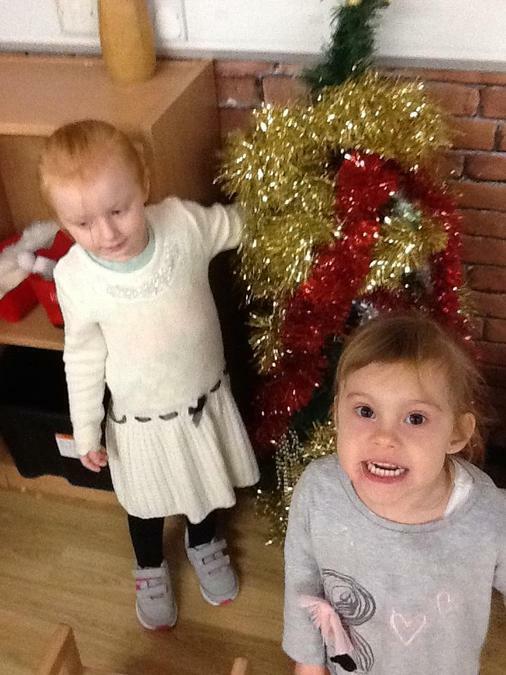 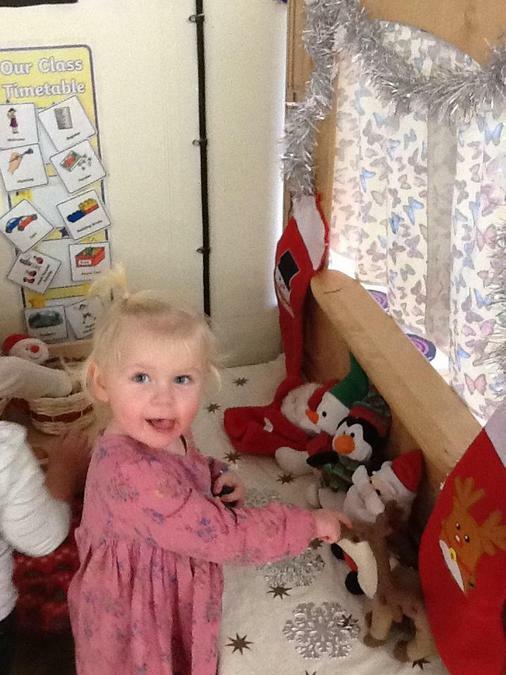 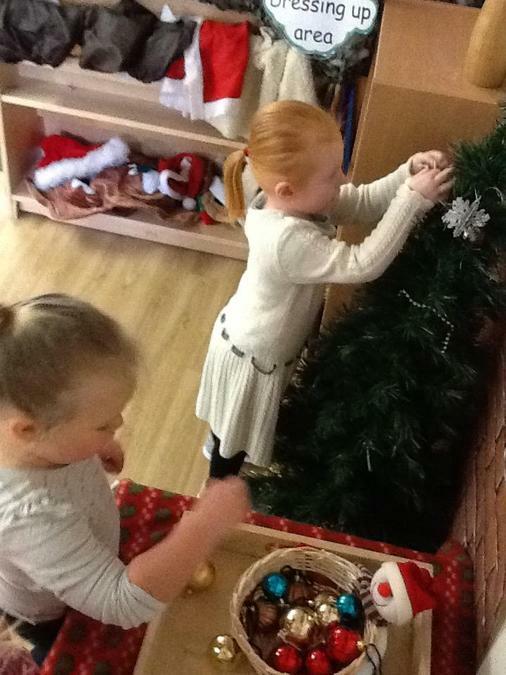 The children have loved having the chance to decorate the tree and dress up as Santa, a Christmas pudding or an elf. 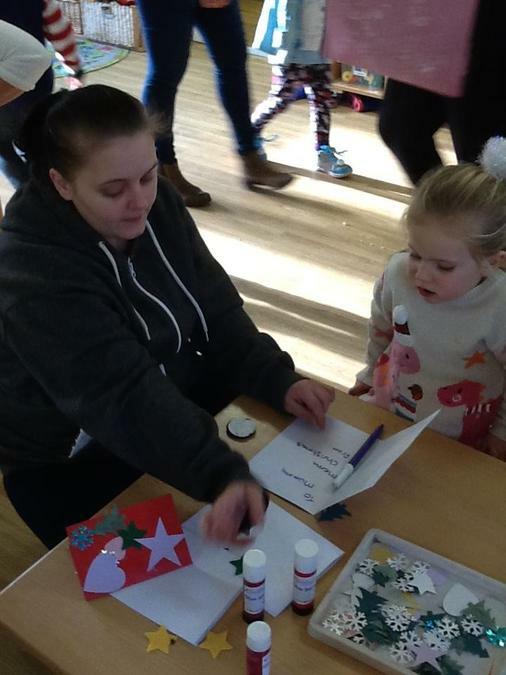 Over the weeks leading up to Christmas we will be doing plenty of Christmas activities involving no doubt lots of sparkly glitter and paint, so make sure you leave some space at home to display your children's wonderful creation. 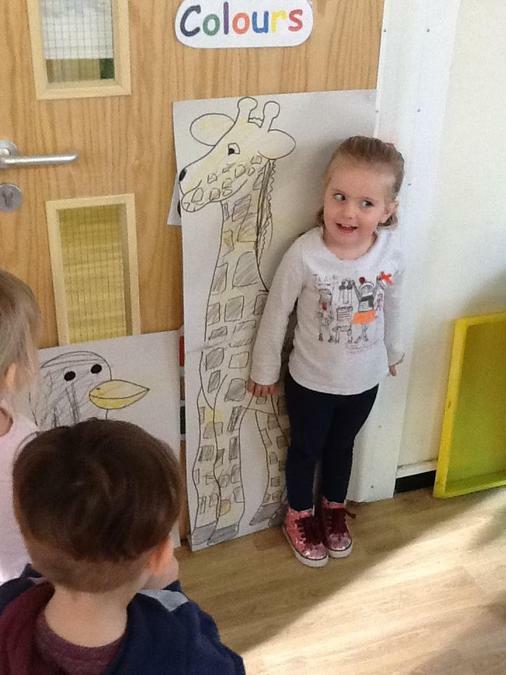 We have introduced the children to the concept of Tall and Short, we looked at the differences between our heights and talked about who was tall or short. 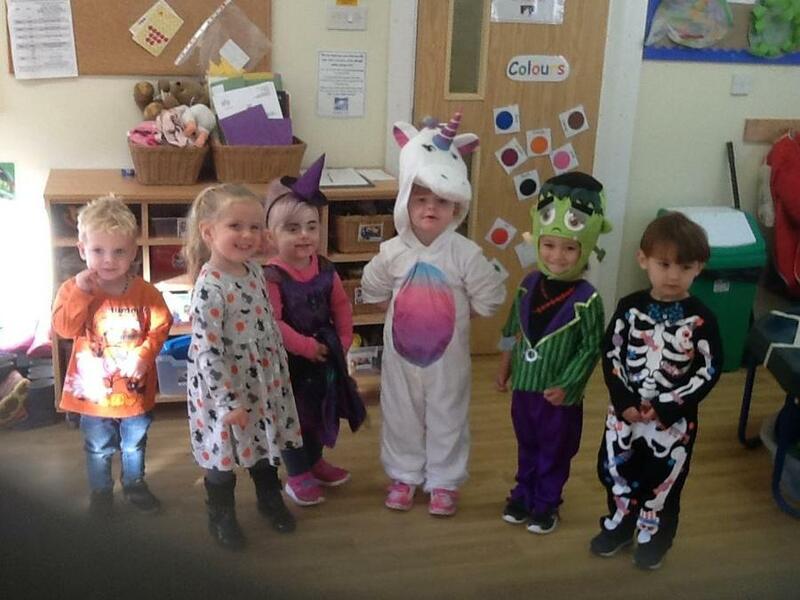 The children quickly realised the adults were taller and that they were shorter. 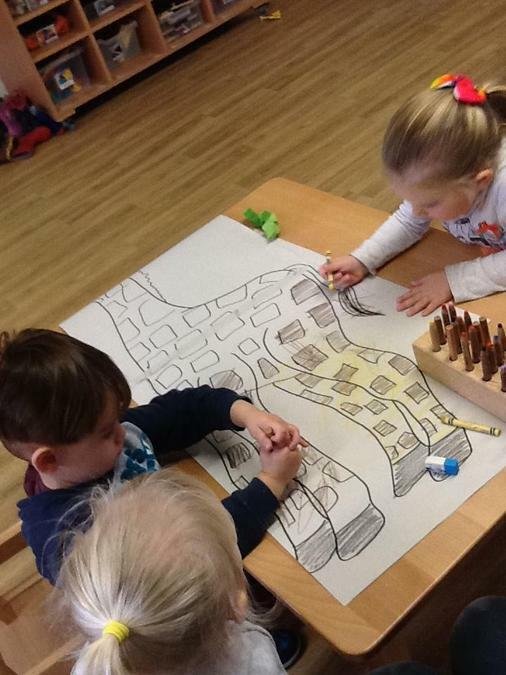 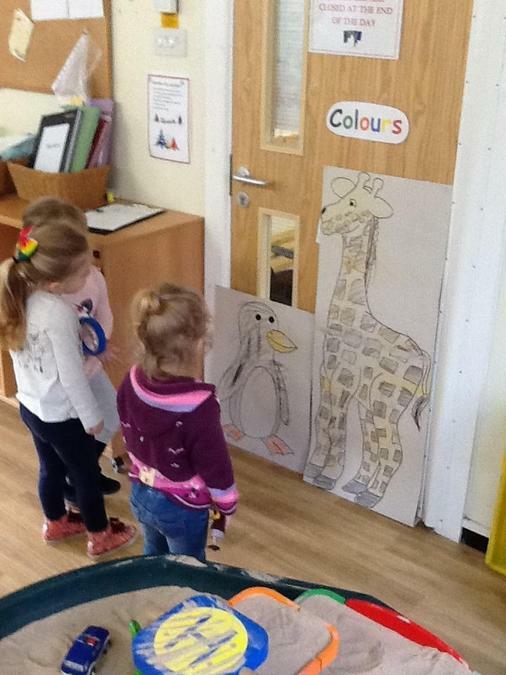 Working together we drew a tall giraffe and a short penguin so the children had a visual to put on the wall to compare sizes, they were asked the questions of, "Who is taller? 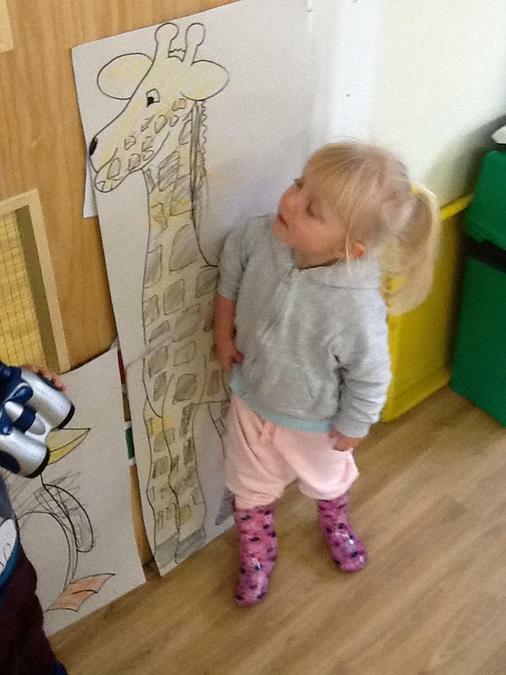 "Who is shorter?" 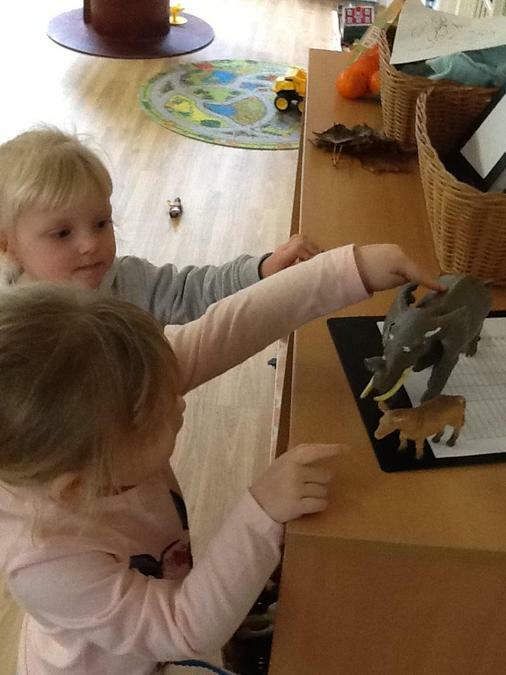 This introduced the children to understanding and answering questions whilst looking at different size. 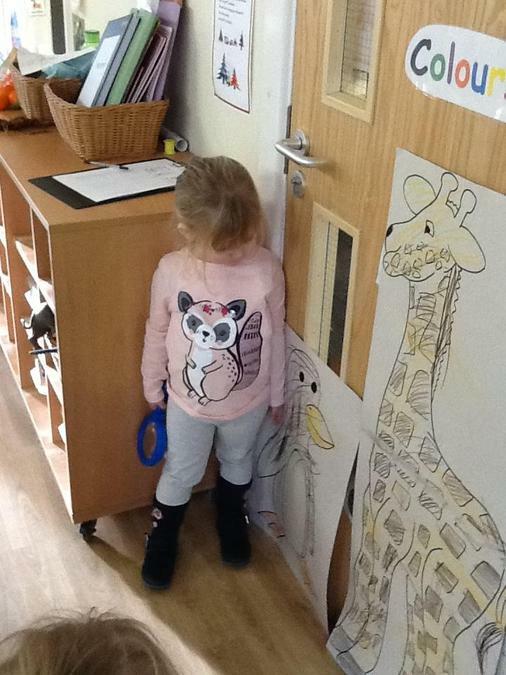 After the activity some children found animals or play people that were tall and short, standing them next to each other they would say which size they were. 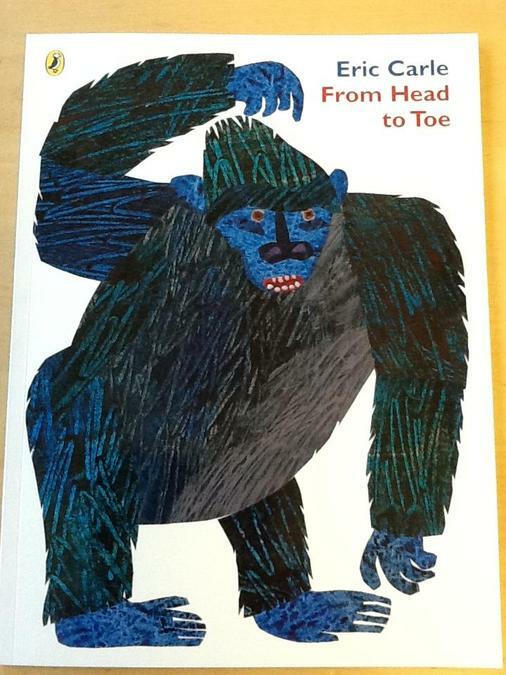 Our focus story this week is Eric Carle's 'From Head to Toe', this story focuses on what movements the animals can do and then the animals asking if the different children in the story can do it. 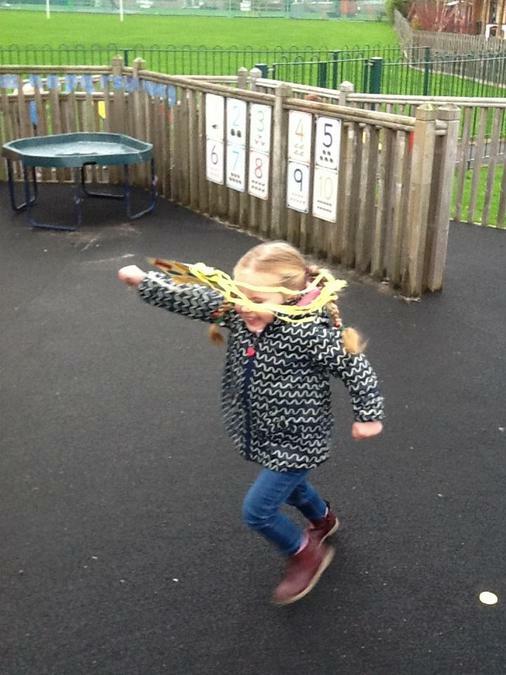 The children respond with "I can do it." 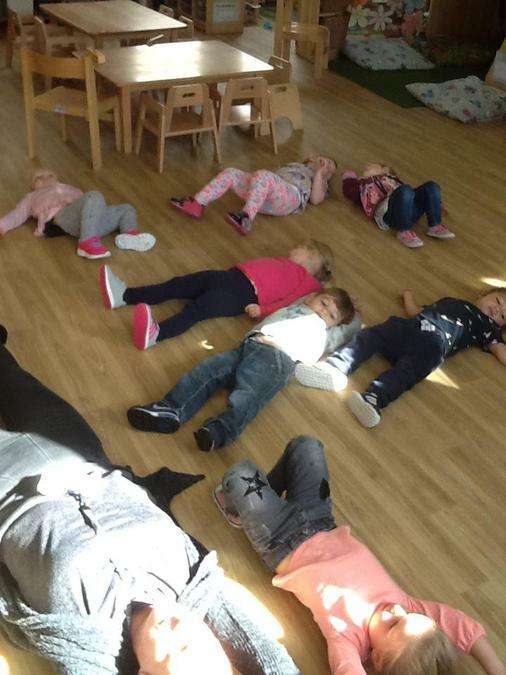 Throughout the story we encouraged the children to join in with the movements asking them, "Can you do it?" 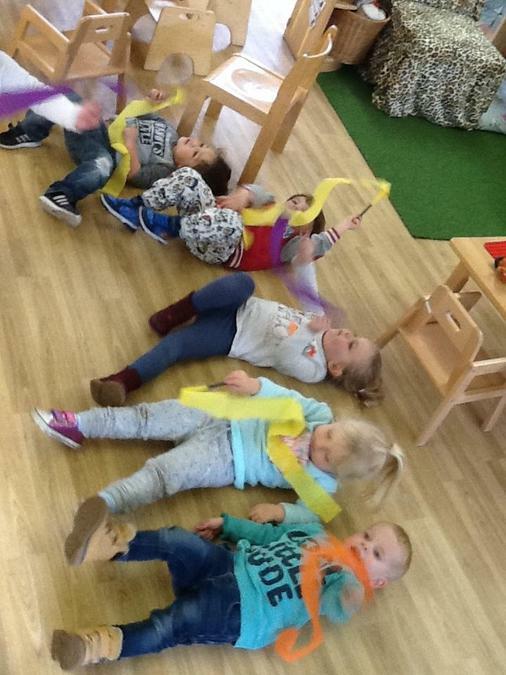 All the children tried the movements and were very pleased with themselves when they in fact could move like the animals, with encouragement they all said, "I can do it." 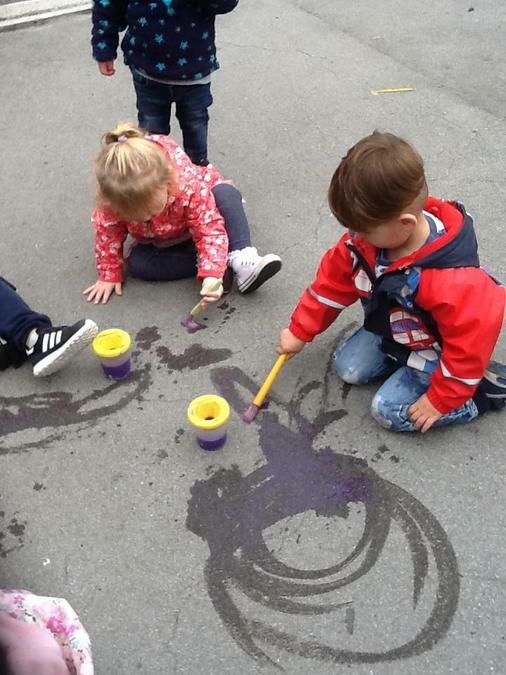 We spoke to the children about how we can all do different things when we are playing and learning. 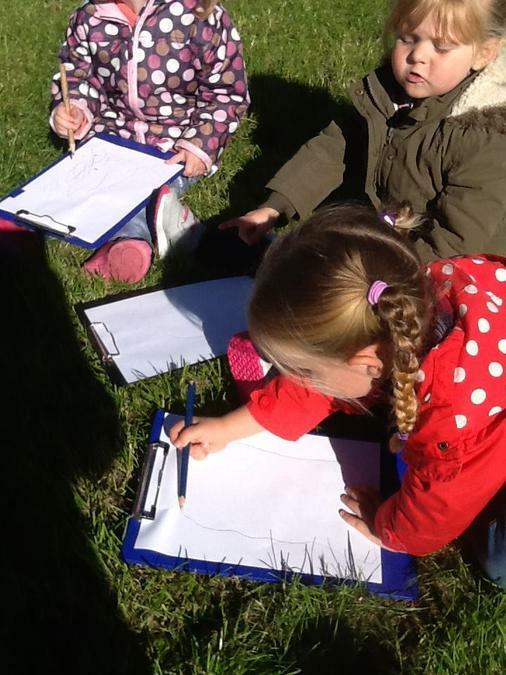 We then went to explore our environment. 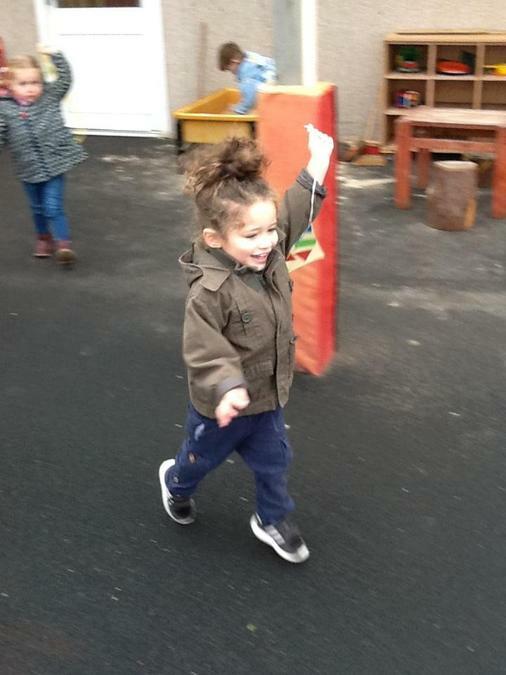 As the children were doing different activities they began celebrating themselves by recognising they were achieving, some would call out to peers to show what they were doing, some clapped hands and smiled, some said, "I did it," or "I can do it." 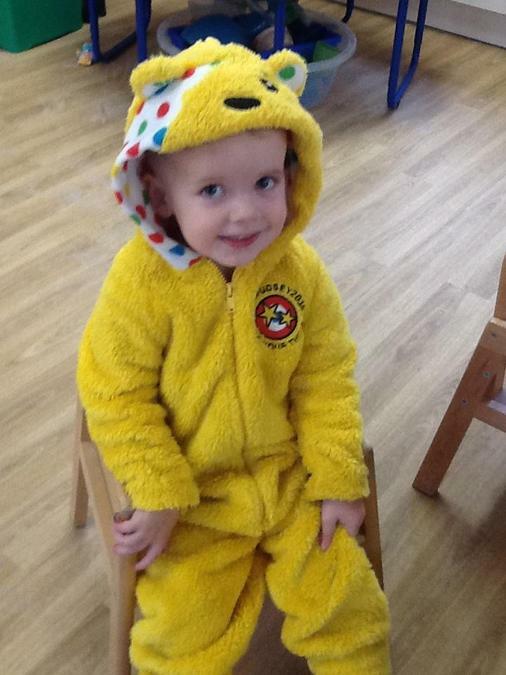 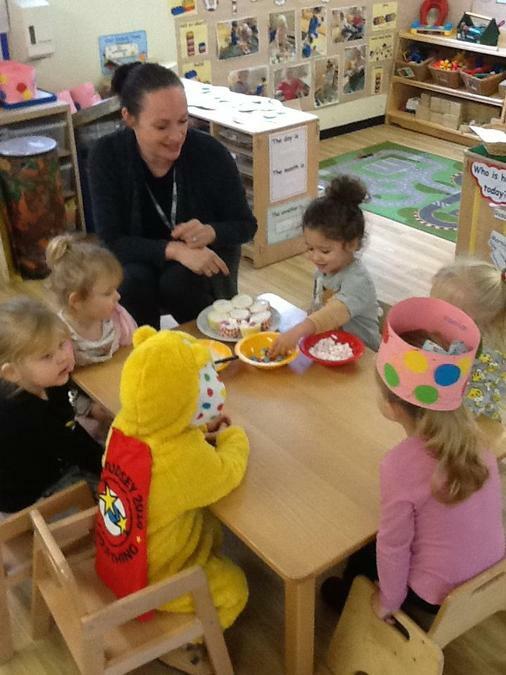 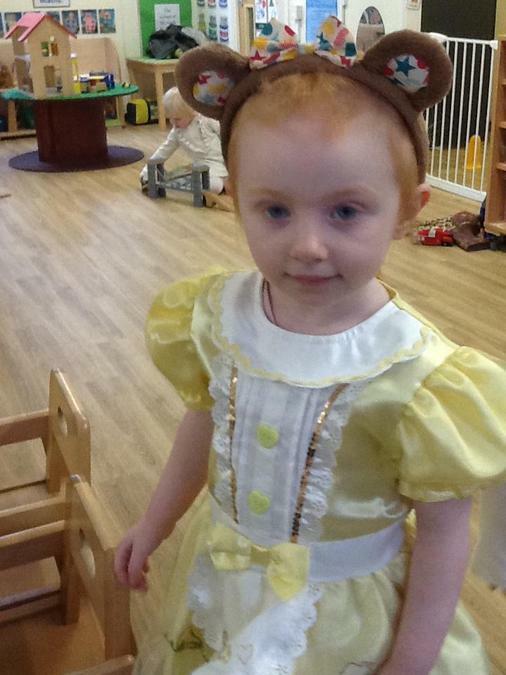 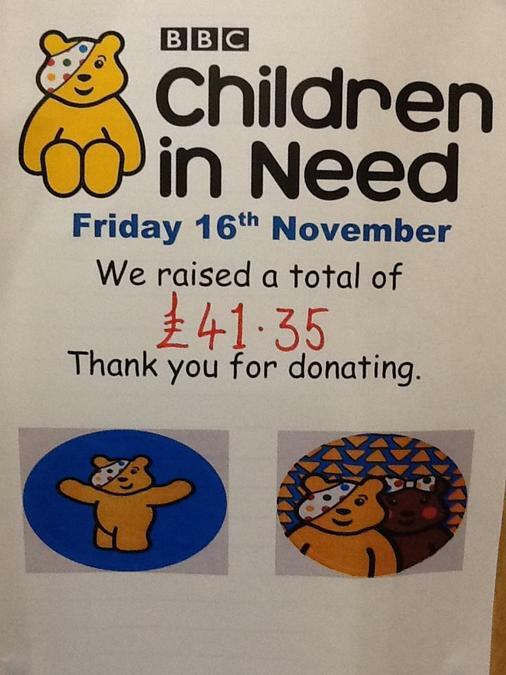 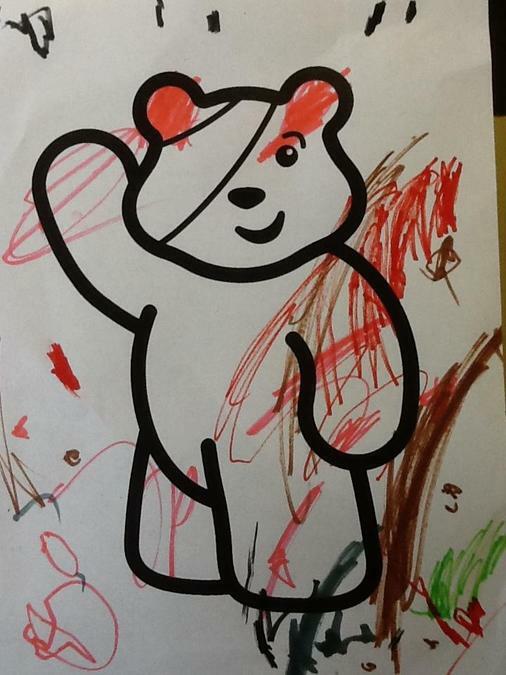 We would like to thank all our families that helped us to raise £41.35 for Children in need. 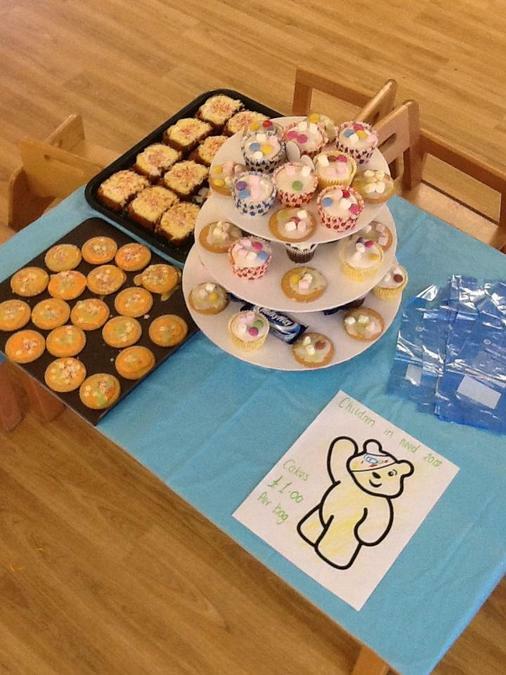 Our cake sale was amazing and the children loved working together and getting involved. 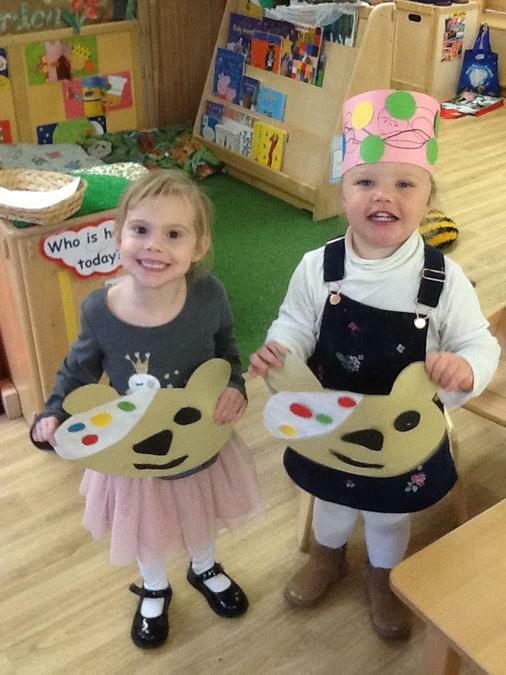 Today the children have enjoyed raising money for this wonderful charity, we have dressed up , done lots of amazing arts and crafts and even decorated cakes and biscuits for a cake sale. 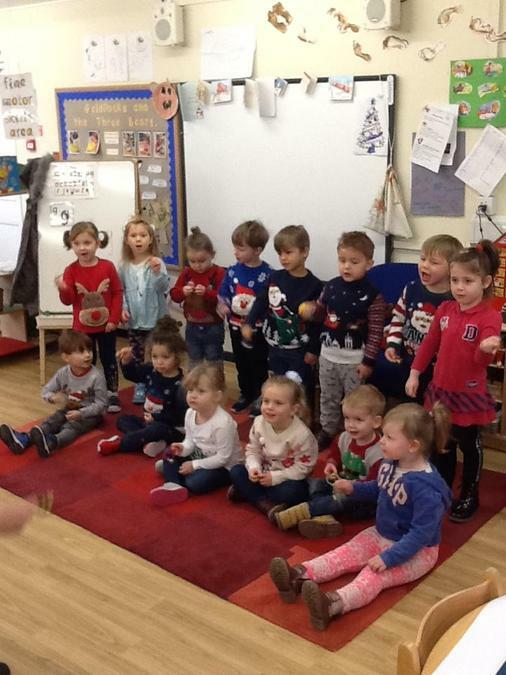 We would like to thank all of you for your kinds donations and will put a sign up next week to say how much the children raised. 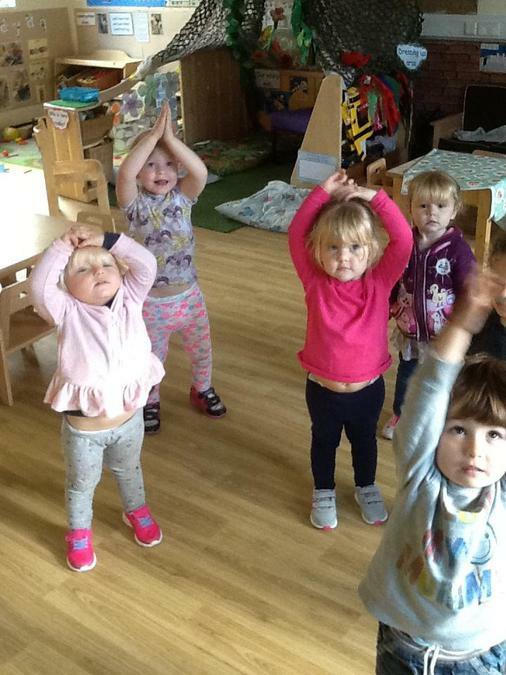 The children are all becoming very good at yoga, they are all quite focused through are daily sessions and are moving and stretching their bodies to hold the poses. 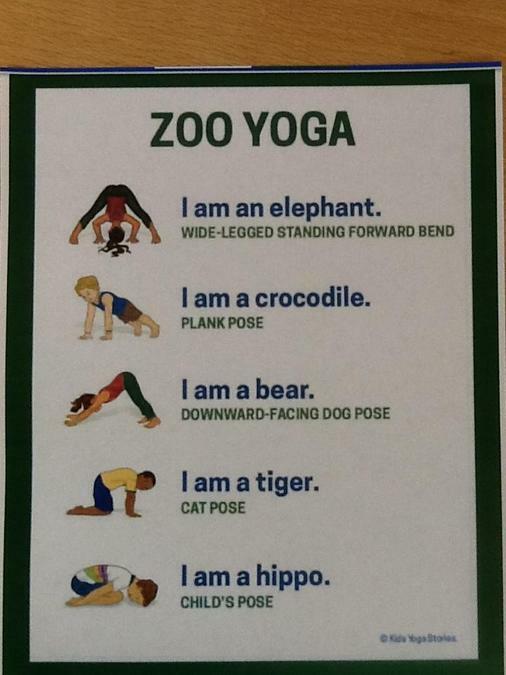 We have introduced some animal yoga poses to the children this week which they thoroughly enjoyed. 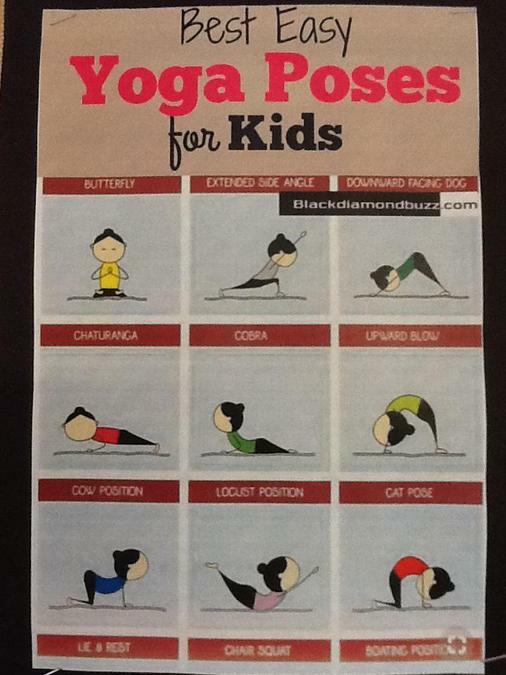 We are in the process of creating a home yoga book for the children to bring home so the whole family can enjoy and take part, I'm sure you will all look forward to sharing this experience that can be a lot of fun. 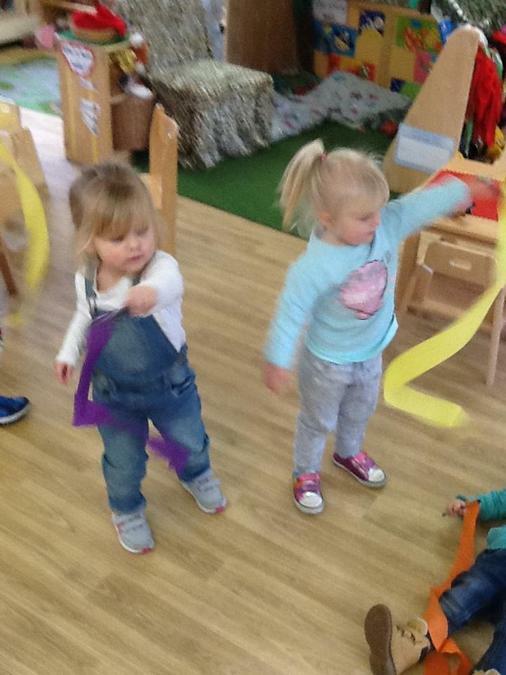 We made some dancing ribbons today to allow the children to create movement to music. 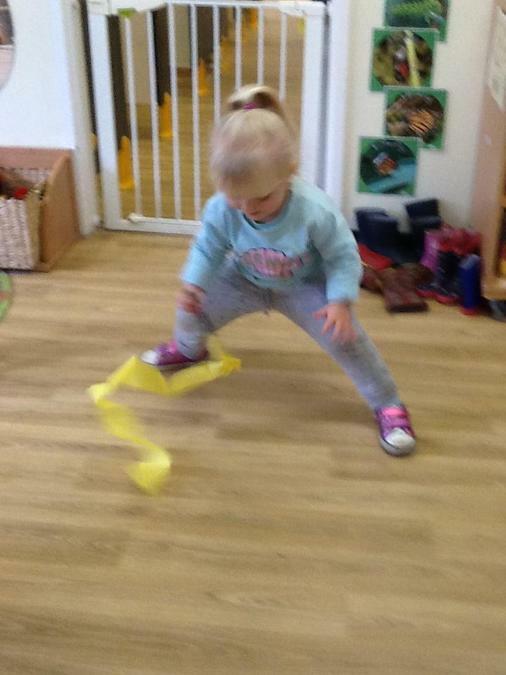 We used language such as high, low, fast, slow, up, down, in front, behind to give the children some instruction and to encourage their movement of the ribbons. 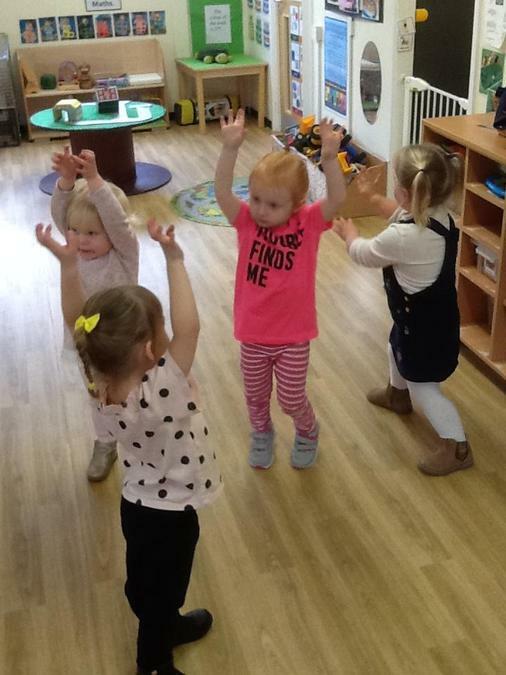 The children even experimented making up their own different movements for the rest of the group to copy, we really had such a fantastic time sharing our ideas. 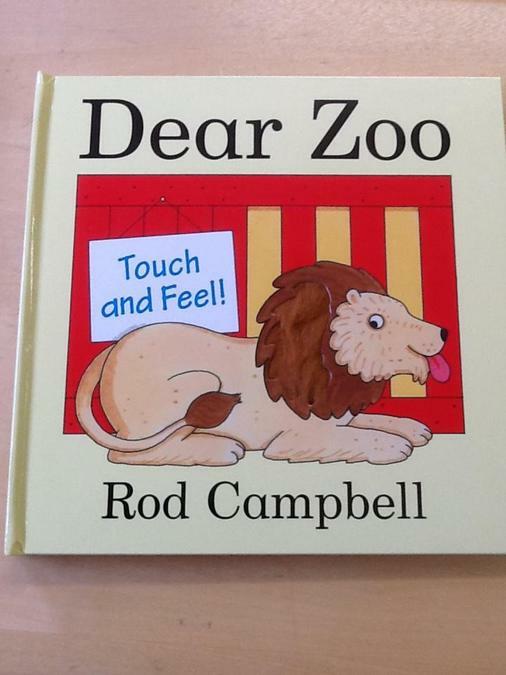 The children this week have been introduced to the story of 'Dear Zoo. 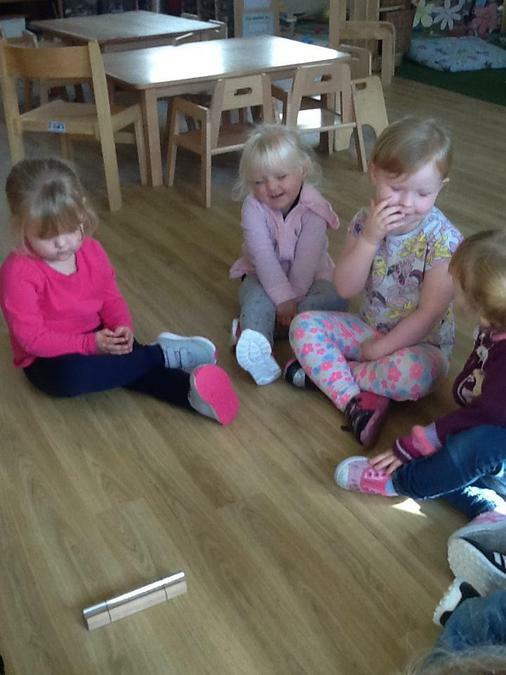 'They have really enjoyed getting to know the story well and can now all help with some words and phrases as we read it together. 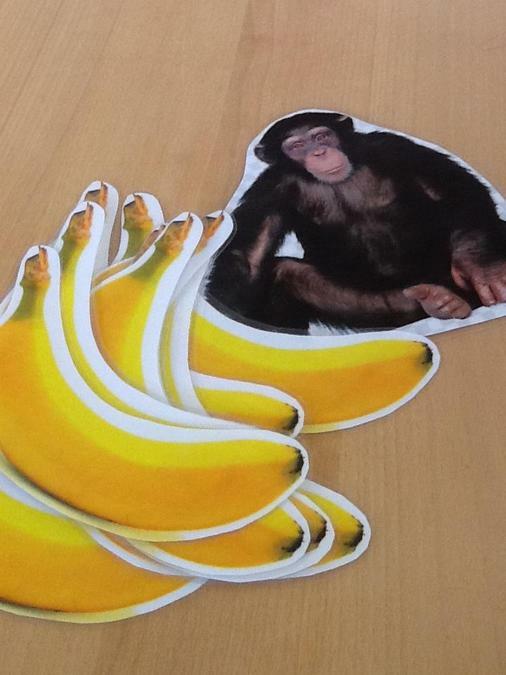 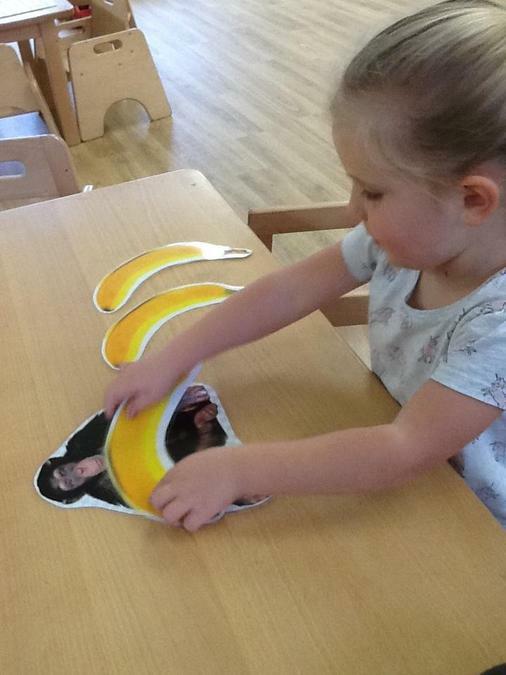 Alongside this we have set up many activities that are to to with the story, these range from making frog hats to giving any given number of bananas to a monkey. 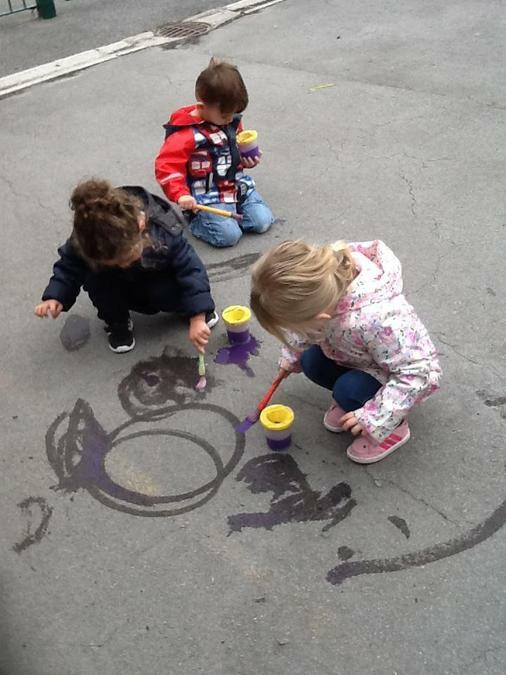 We will continue with this theme next week as the children are still so engaged with it. 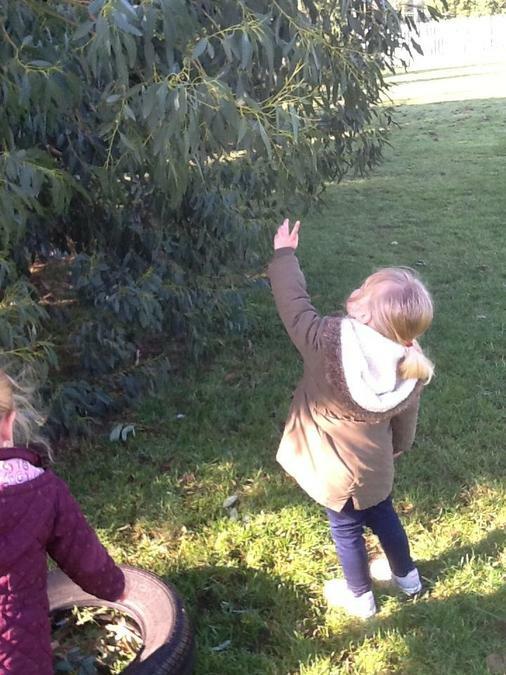 If you have any photos from an outing to the Zoo you may have gone on as a family then please look through them with your child and discuss what you saw. 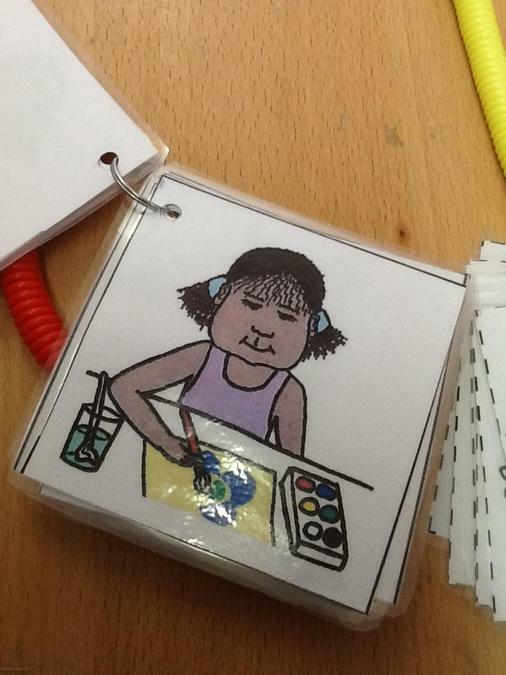 Don't forget you can also add photos and comments to your child's interactive learning diary. 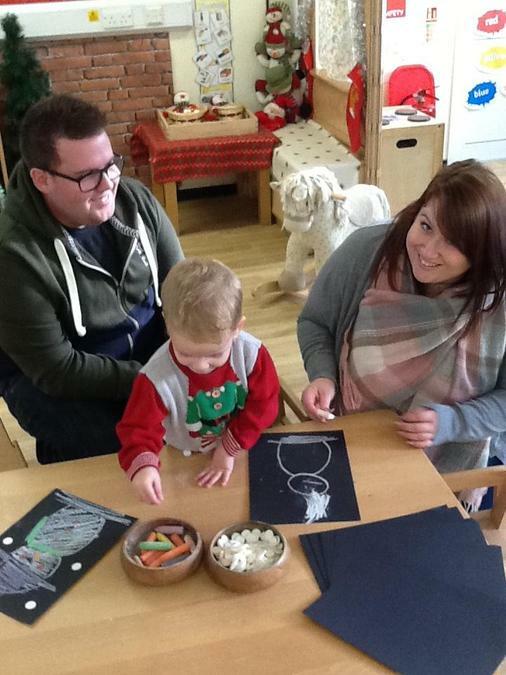 We would love to see this outing or any other home learning your child does with you. 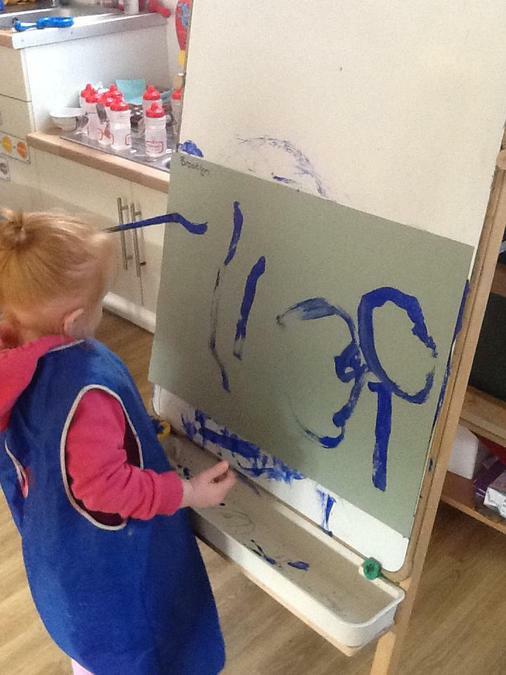 If you need any support on how to do this then please pop in and speak to either Lisa or Kirsty for support. 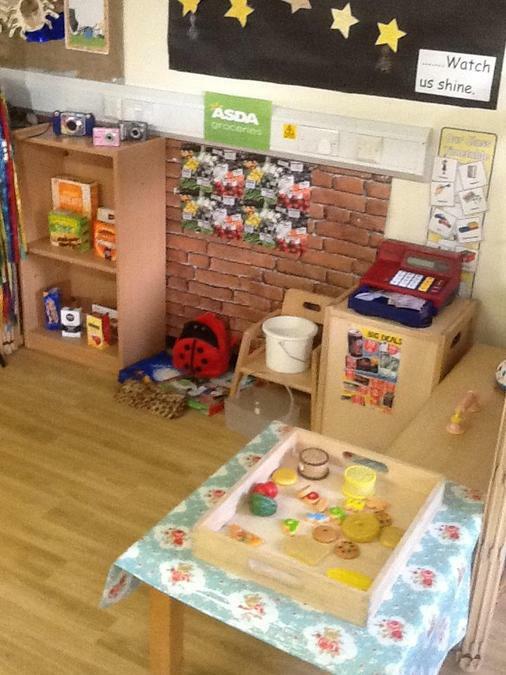 Following on from the children's interests this week we have now changed our home corner into a shop. 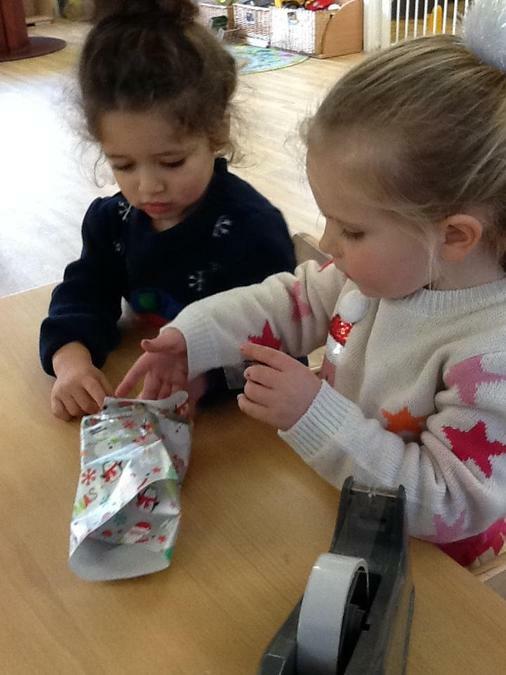 The children have been off shopping with each other and have showed good sharing skills with the money and baskets. 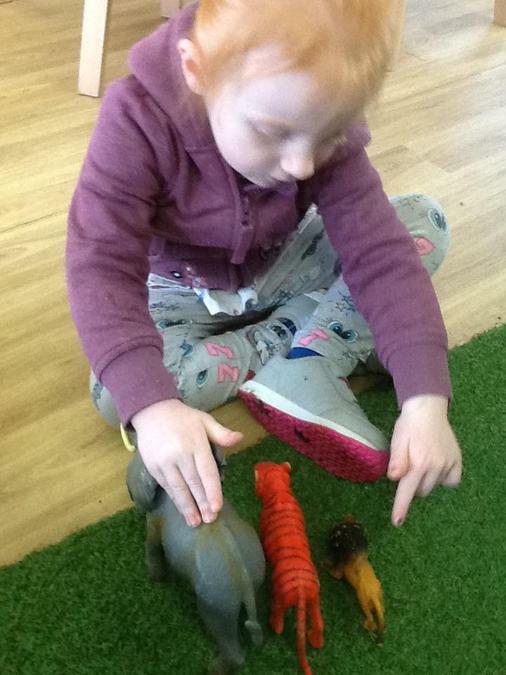 We play alongside the children so that we can introduce them to new language, to interact with others and to extend their play. 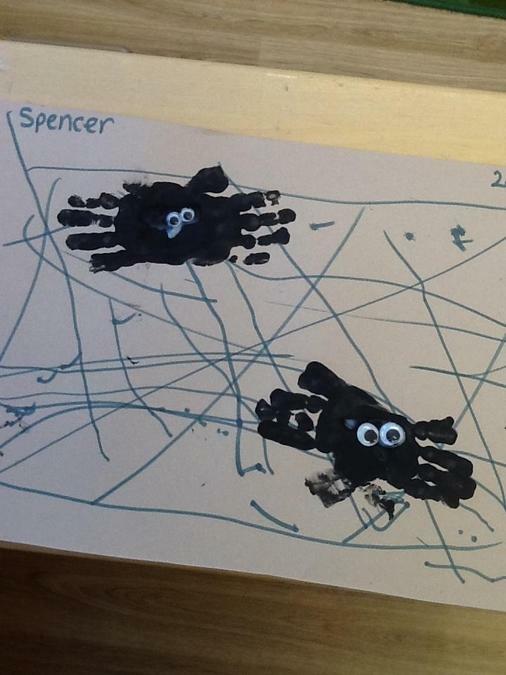 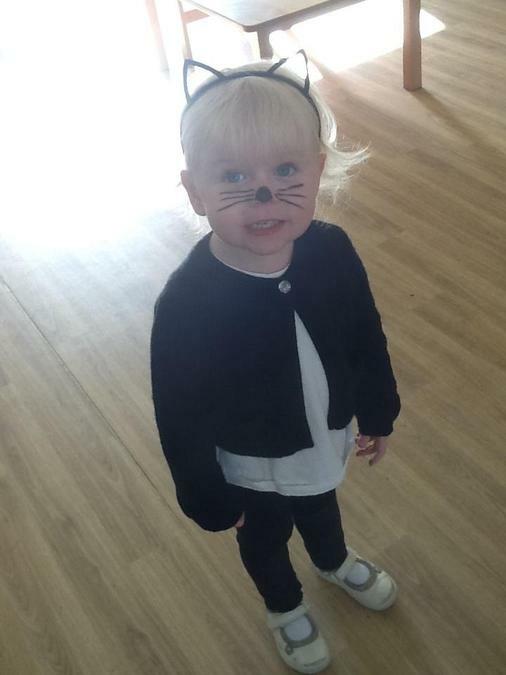 This week we have done lots of activities around the theme of Halloween. 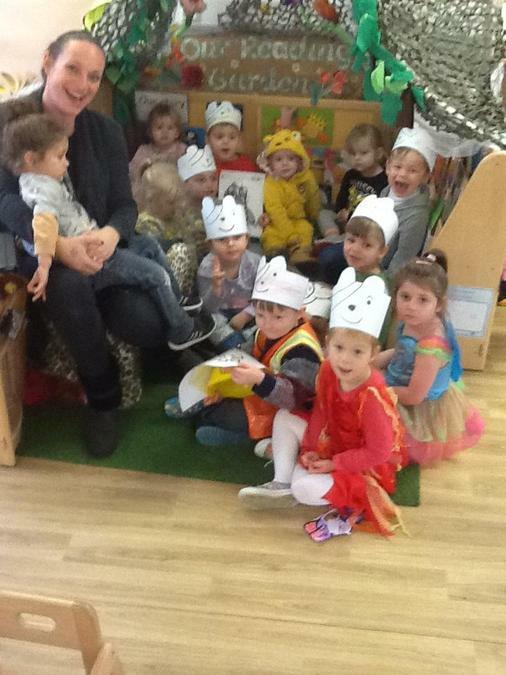 The children have enjoyed many stories, they especially like the Meg and Mog adventures. 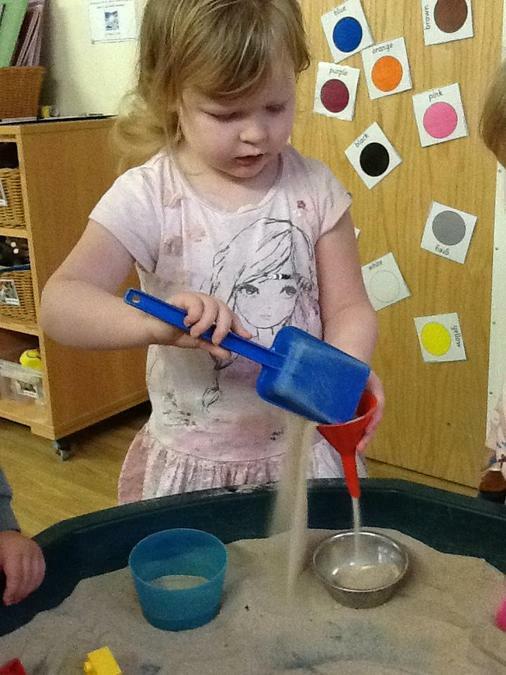 All children developed their pouring skills whilst they made potions in the witches water station and were using language of quantities and size. 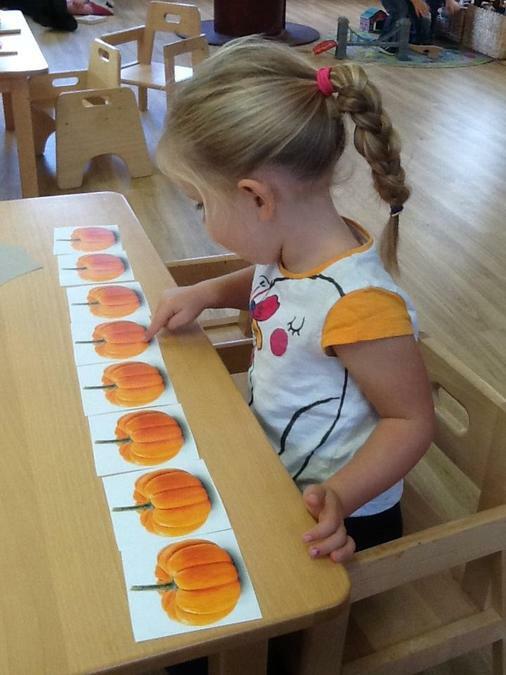 We modelled to the children how to count pumpkins and we left them out to see if anyone went back to count them again. 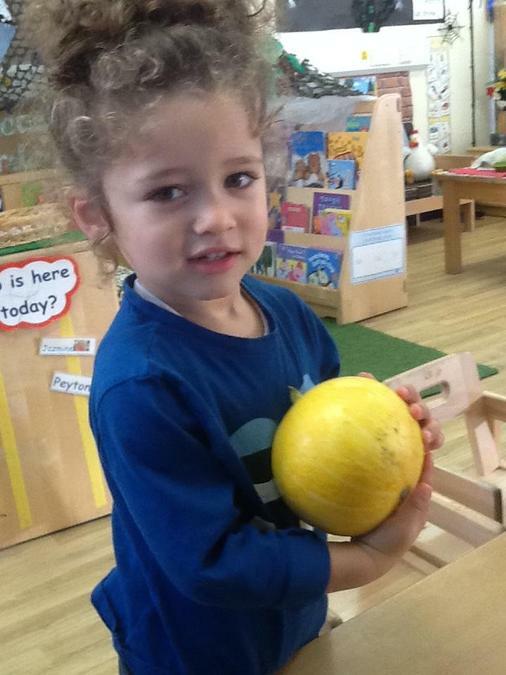 We were pleased with how well they did and we even had one of our children bring in a pumpkin that they had grown at home. 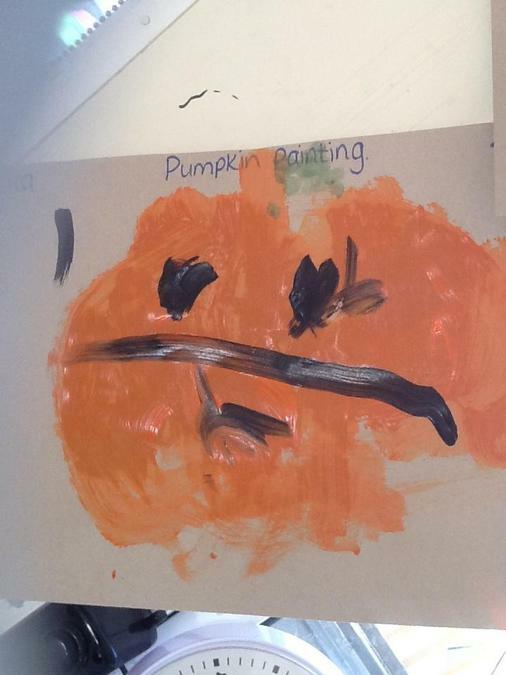 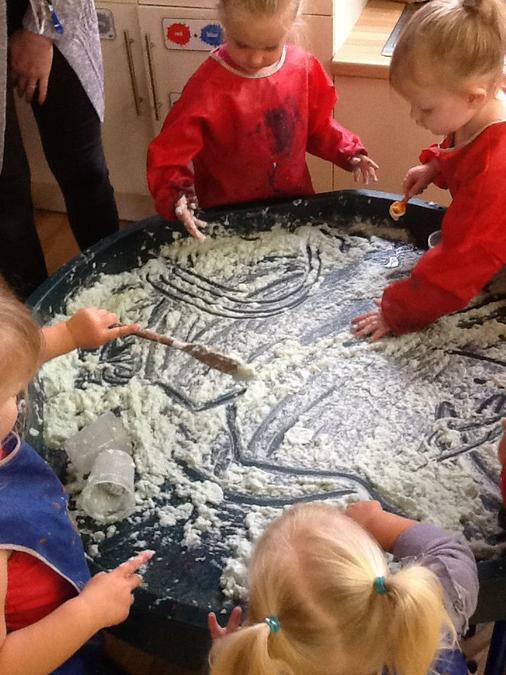 They loved having this in the role-play kitchen area and pretended to make pumpkin soup for the babies. 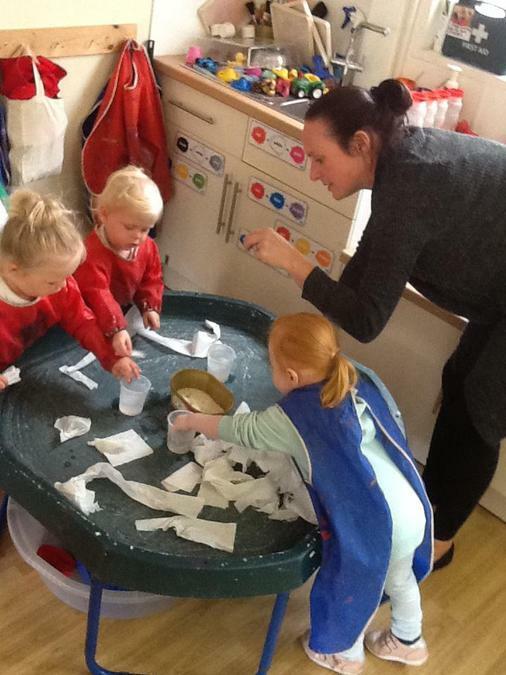 So many creative and sensory activities have taken place this week the children have been completely engrossed and focused. 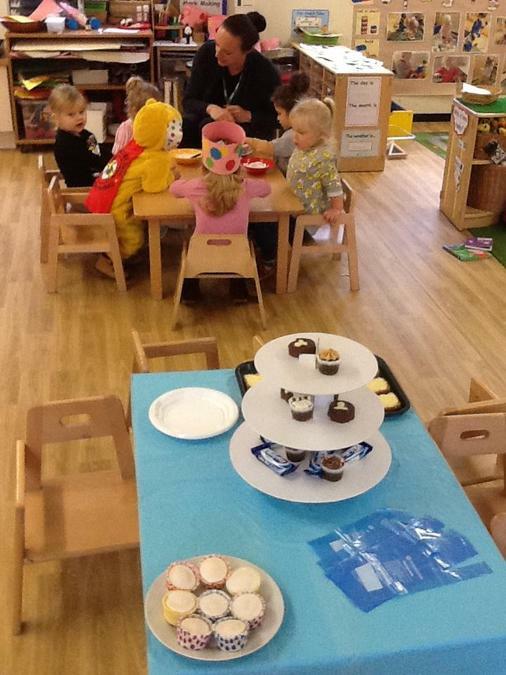 We ended the week with a Halloween party. 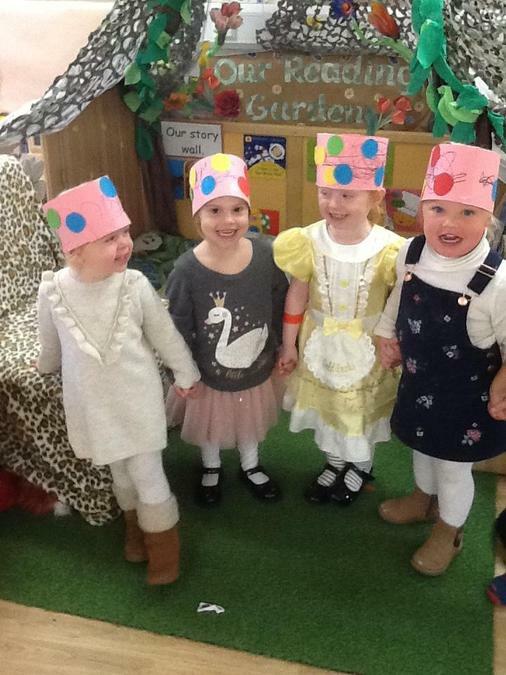 The children came in dressed up and we played games and danced till we were worn out. 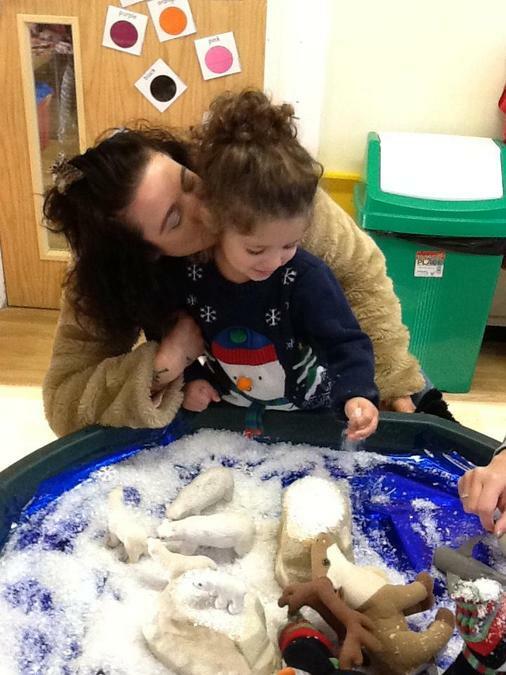 Thank you for to all our families this term for working closely with us to help your child be a confident learner and explorer. 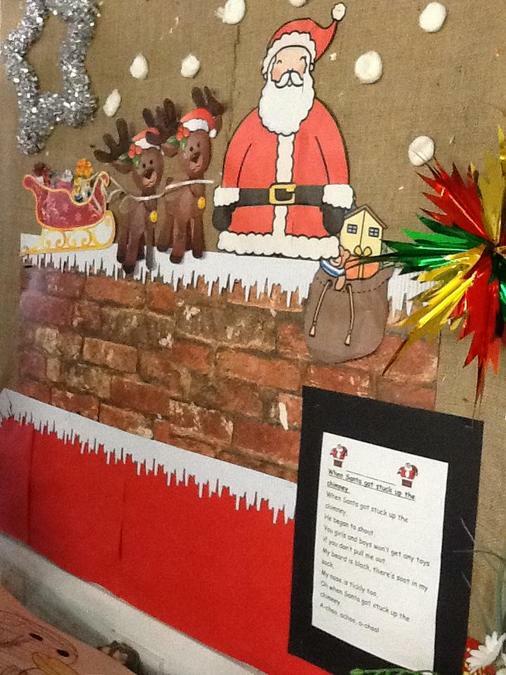 We hope you have a lovely break and we will see you all when we come back. 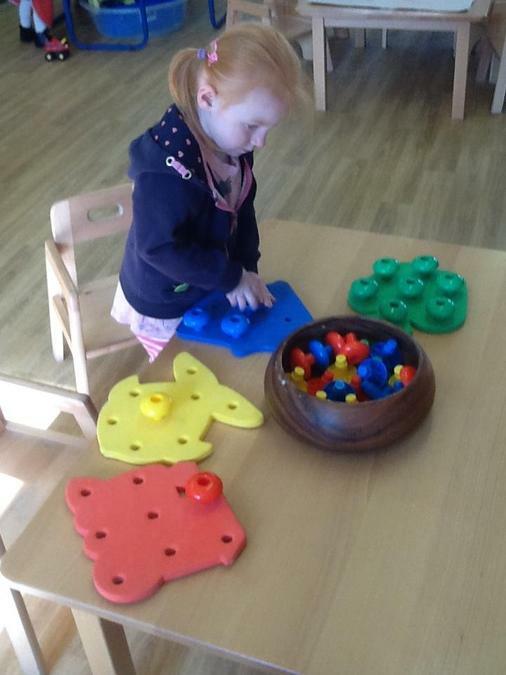 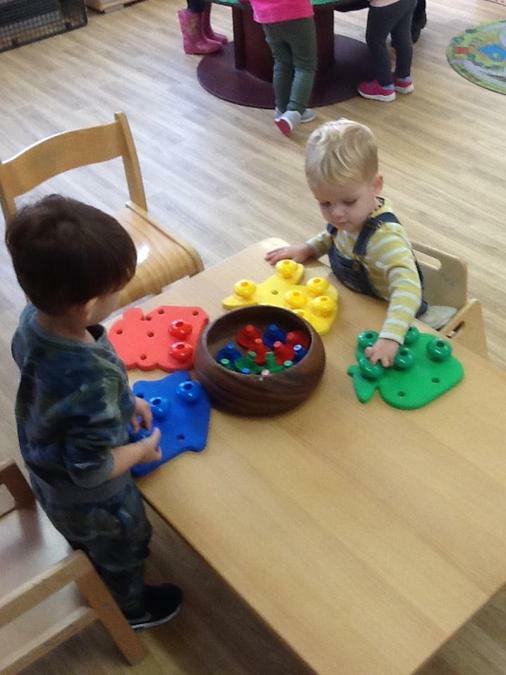 This week many of our activities have been mathematically based, we have modelled to the children how to sort objects into separate groups according to colour or size. 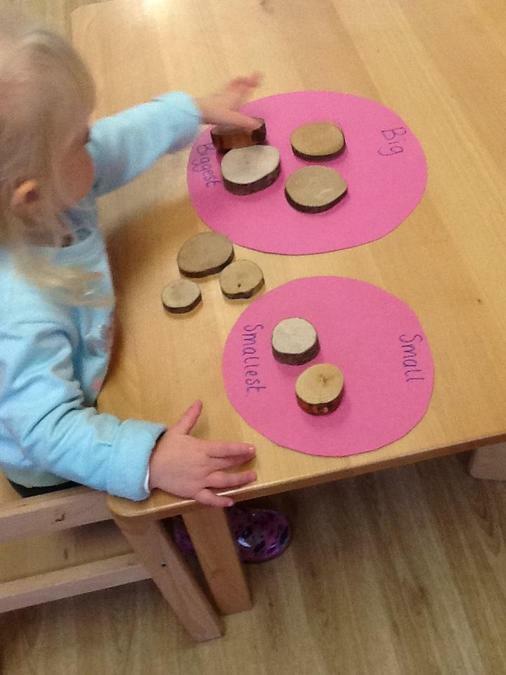 They have been introduced to new language and concepts of big and small, and making comparisons of more or less. 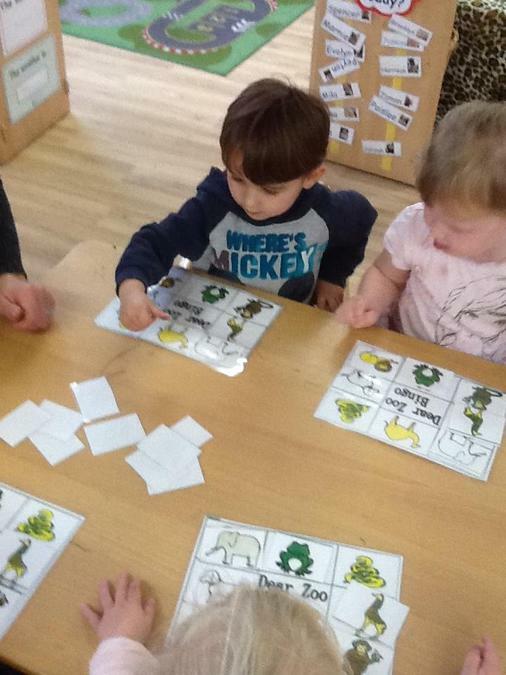 The children were all very focused and enjoyed the challenges of the set activities to sort themselves. 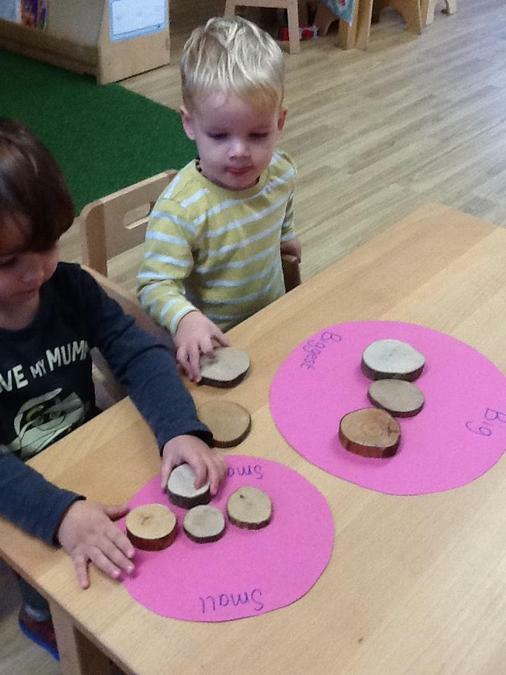 We also encouraged counting of objects to develop reciting some number names in sequence and to give them the knowledge that numbers identify how many objects in a group. 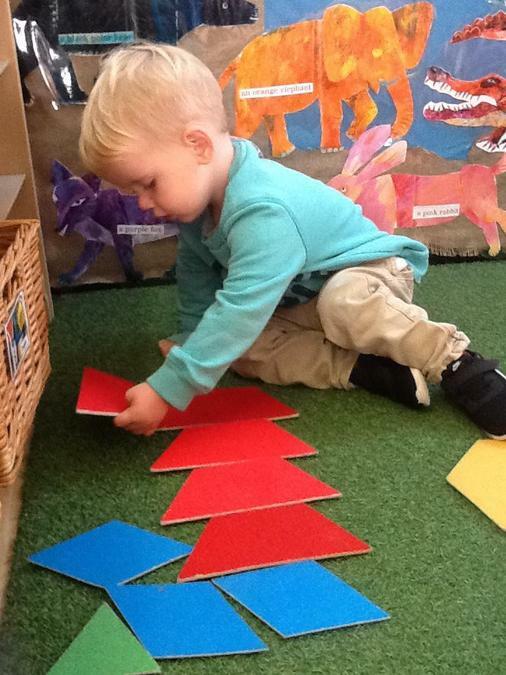 We have been using the flash cards to begin learning some 2d shapes, some children are already able to recognise some and for those that weren't sure they repeated the shape name after us. 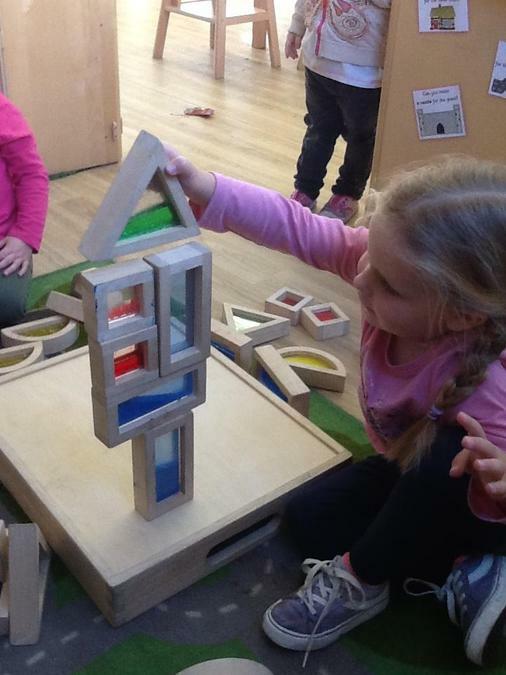 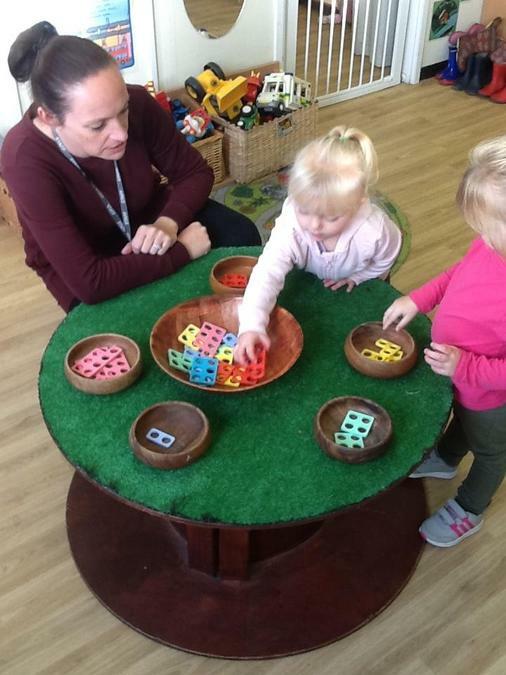 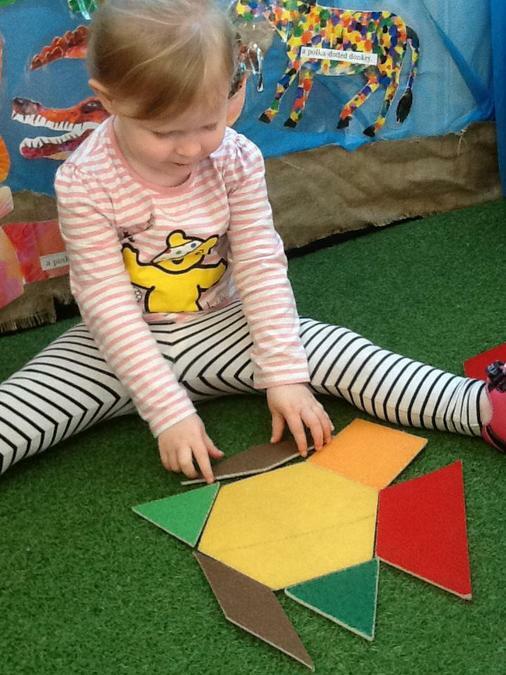 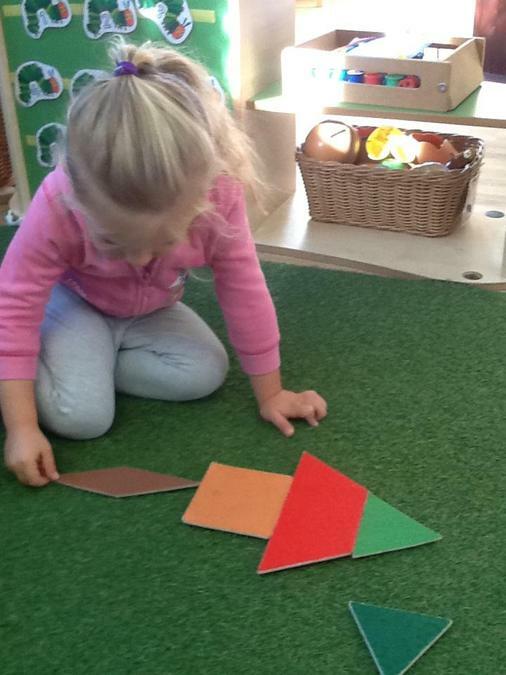 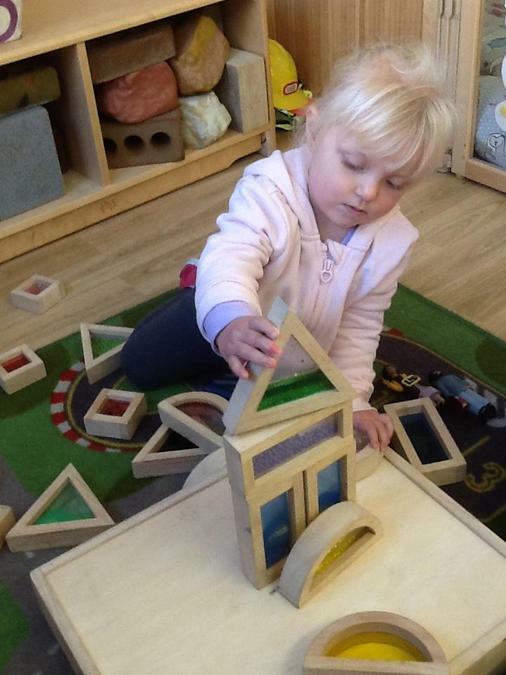 To extend the activity we have been using the sensory shape blocks to further the children's interest in shapes to make arrangements through their play. 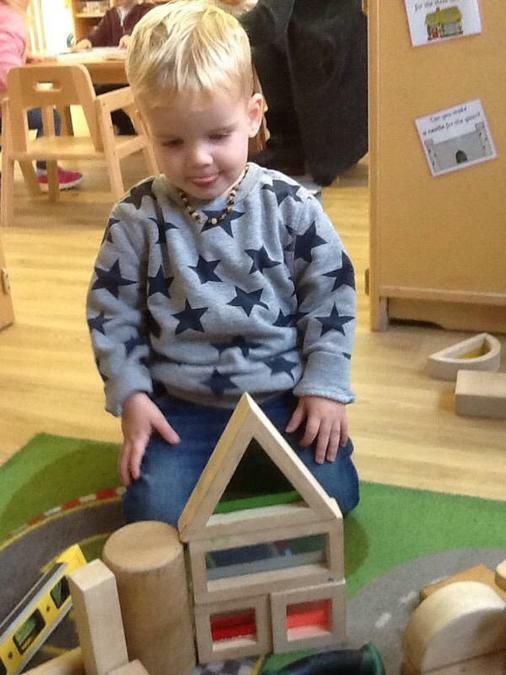 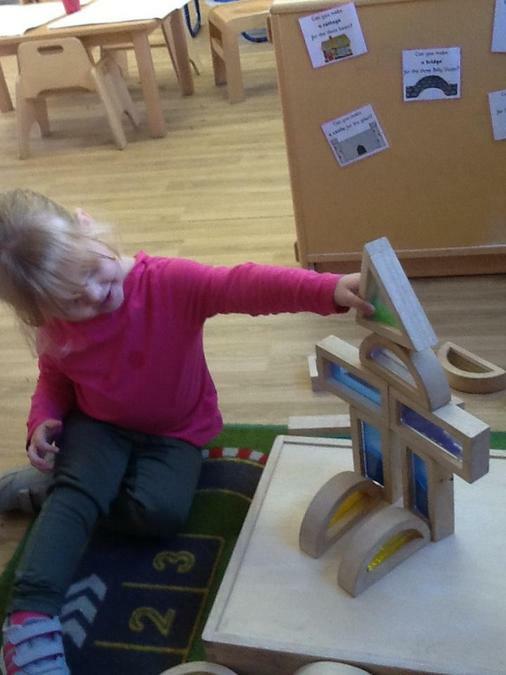 We continued naming the shapes as we built, it was lovely to see the children actually build and create, using the shapes to represent objects such as houses, castles, rockets and even a robot, just amazing. 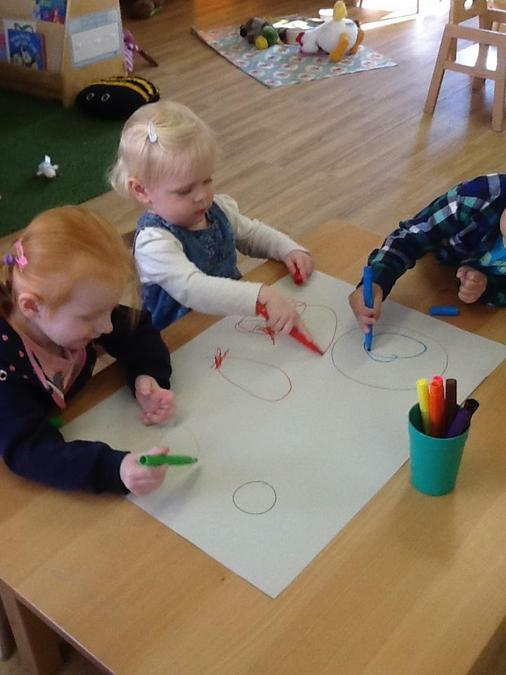 Some children also tried to draw big and little circles. 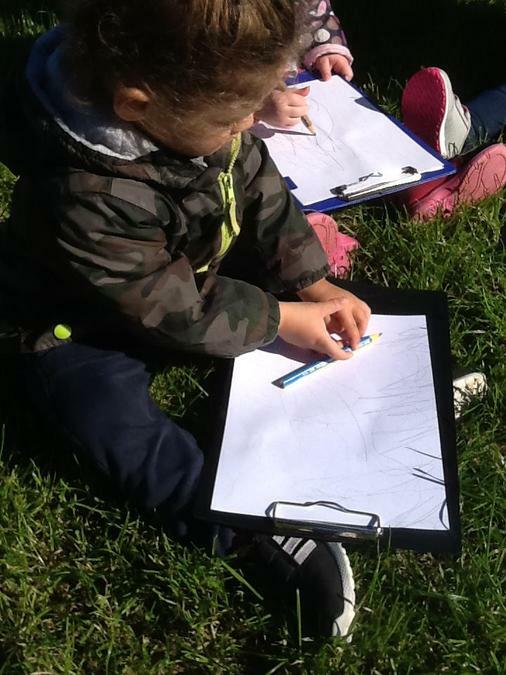 We have completely taken advantage of the sunny weather at the beginning of the week by doing a nature walk around the school grounds. 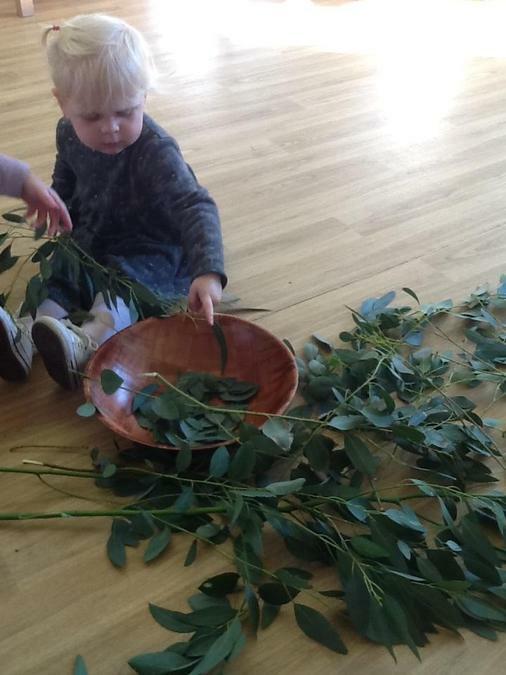 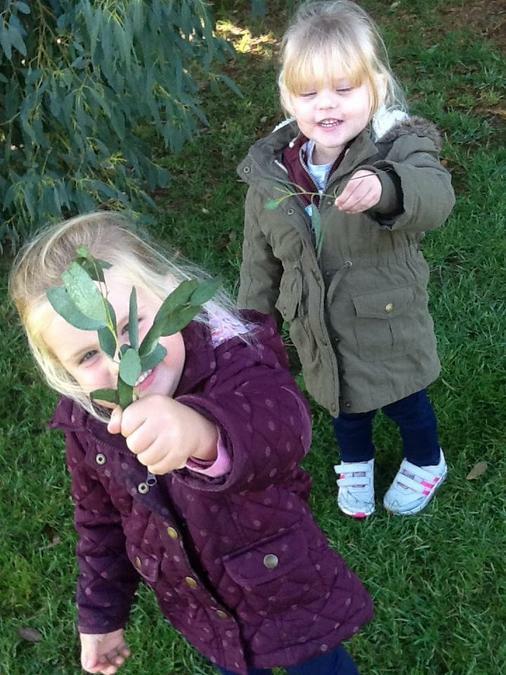 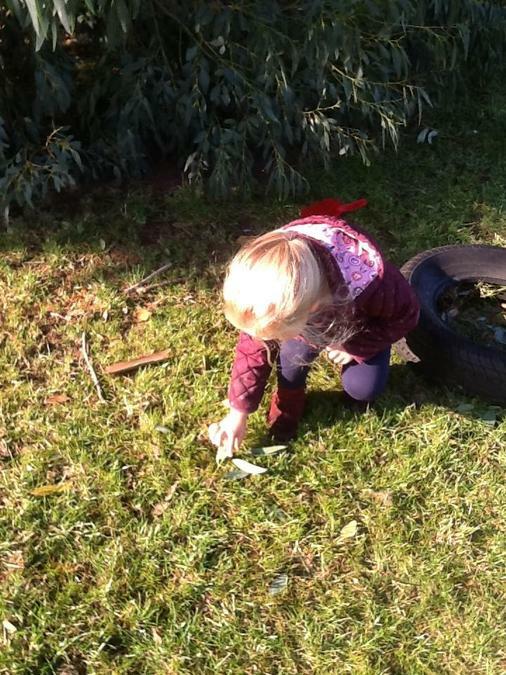 Some of the children started to naturally gather some leaves so we all collected as many as we could carry. 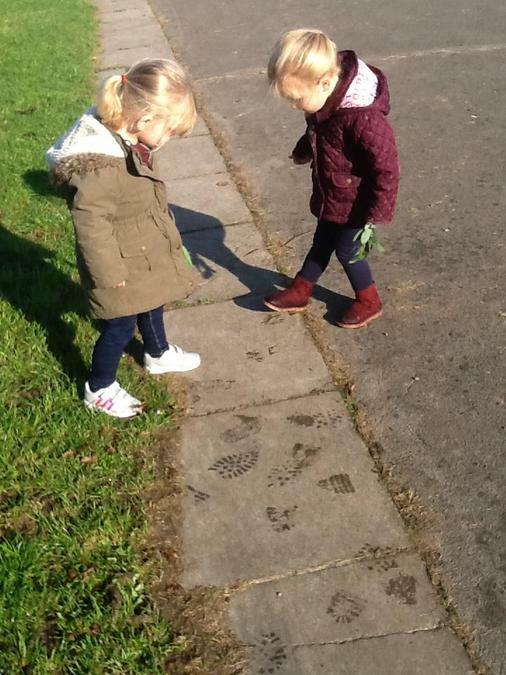 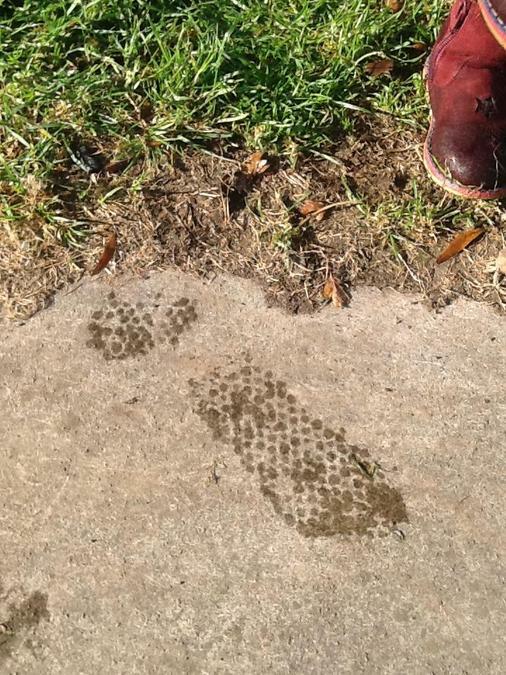 On the way back the children noticed that they were leaving footprints on the playground so we looked closely at the similarities and differences between the marks left behind. 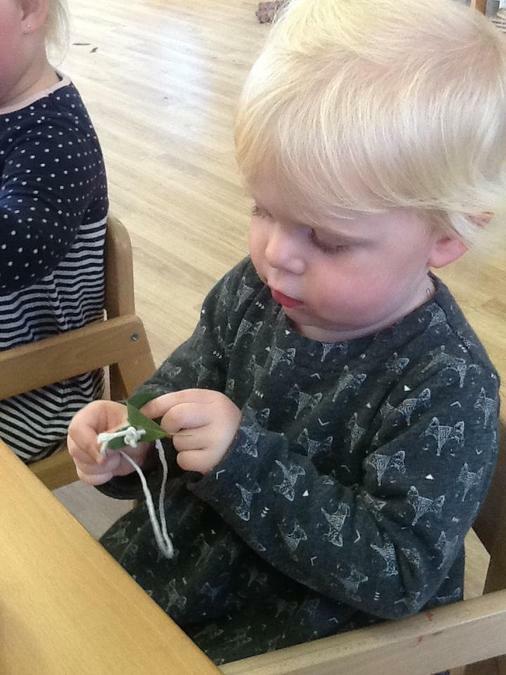 Once back inside we used a hole punch to create holes in all the leaves and the children threaded them into some string. 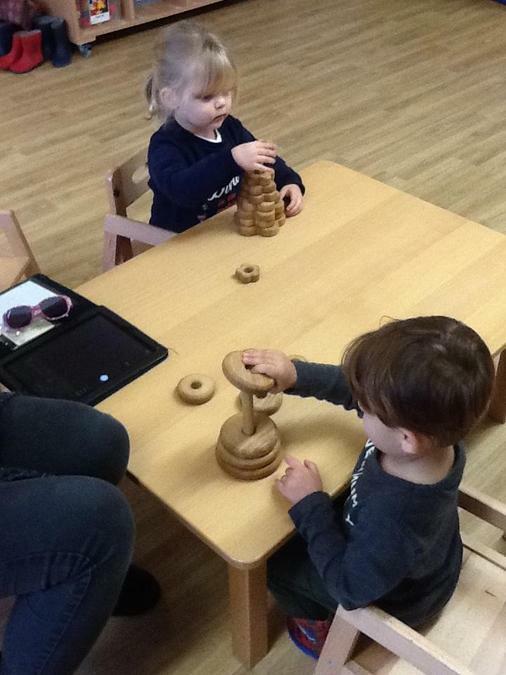 Their perseverance and the time they stayed at this activity was really good. 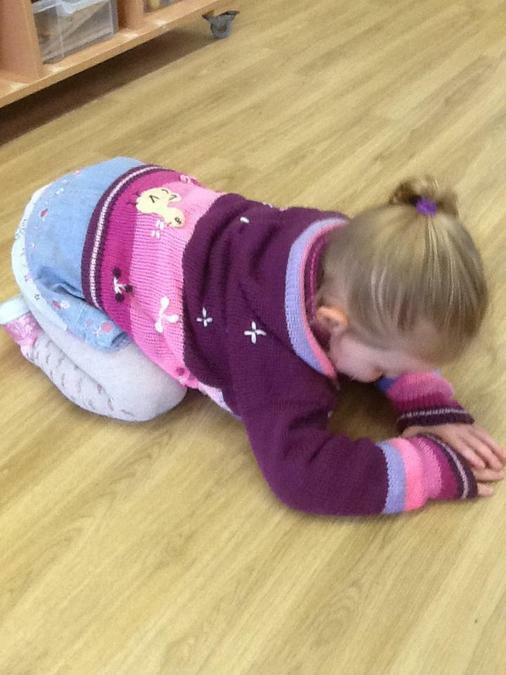 The children this week have been developing their turn taking skills. 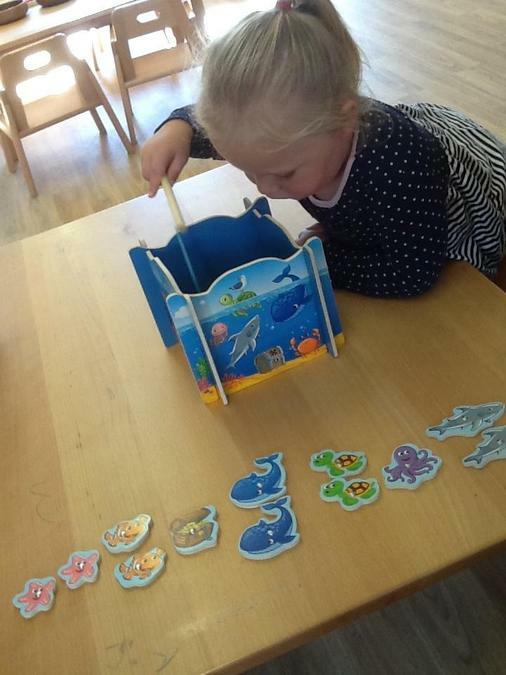 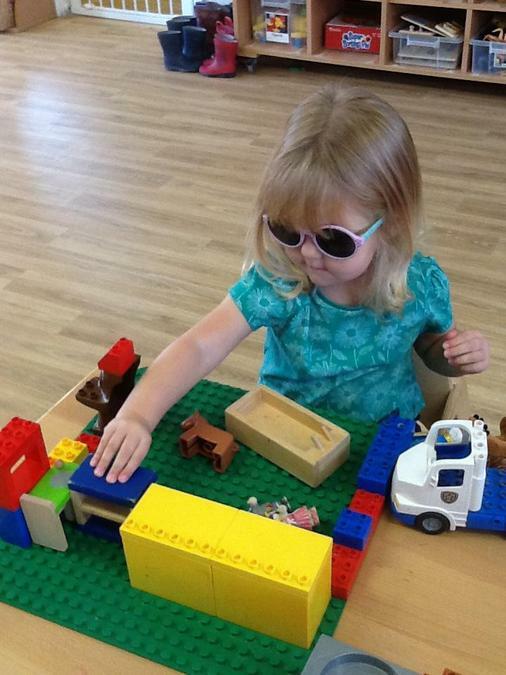 We use simple games to model and encourage this between a small group of children. 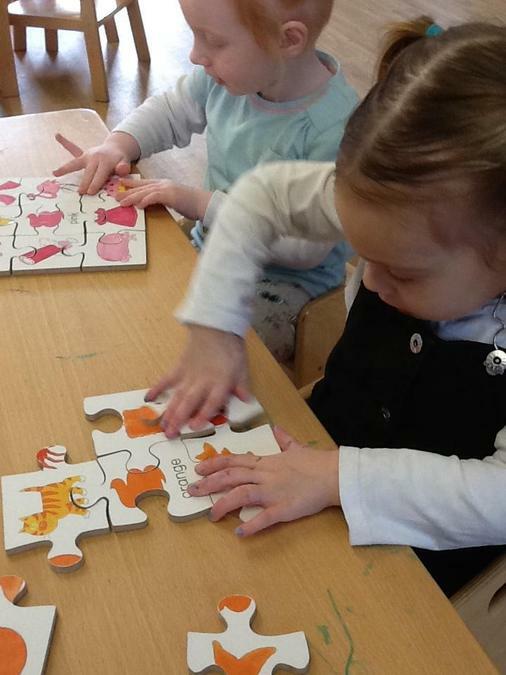 We are so impressed with how far they have come on. 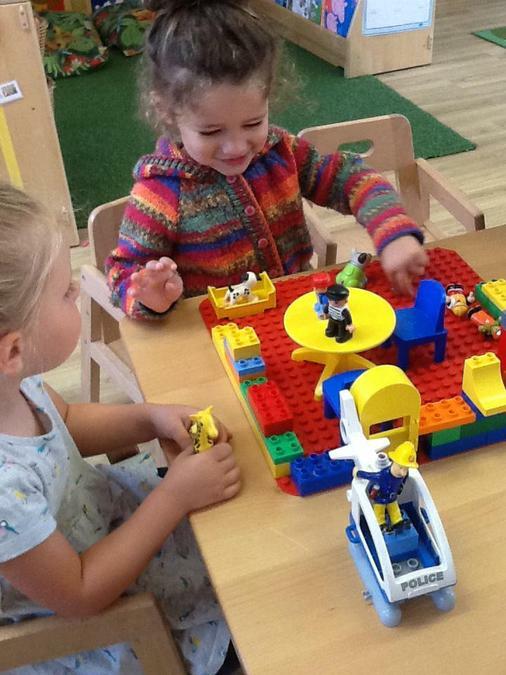 They really are enjoying themselves with their friends. 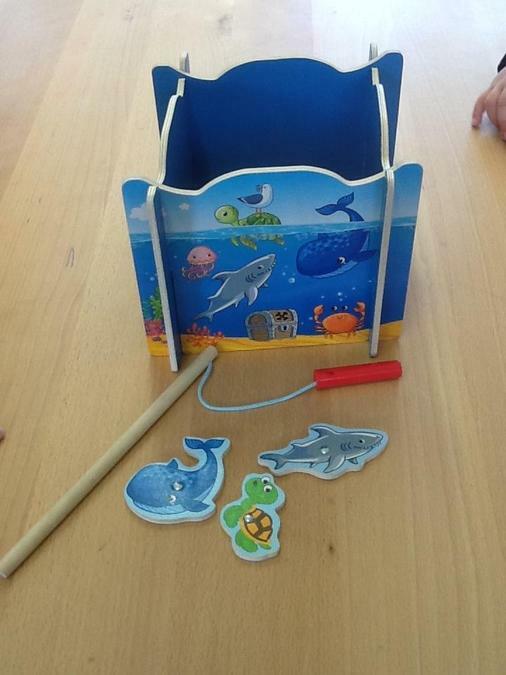 Below are pictures of some children turn taking whilst playing the fishing game. 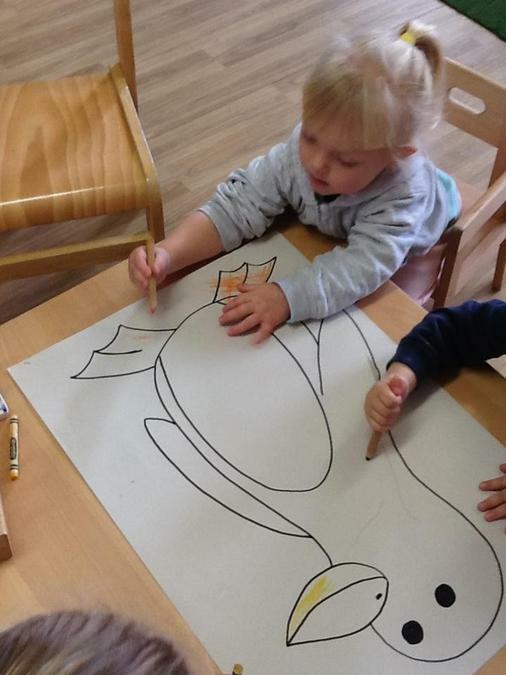 They also extended their learning by matching up their fish or sea creature to their friends. 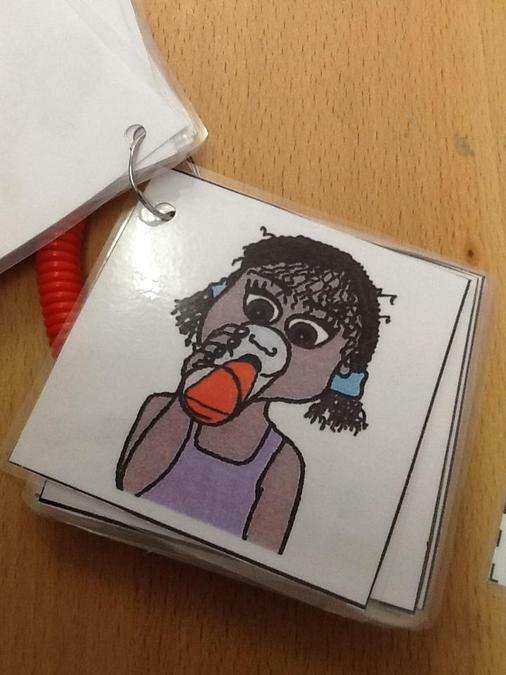 We have been focusing on verbs this week with the children. 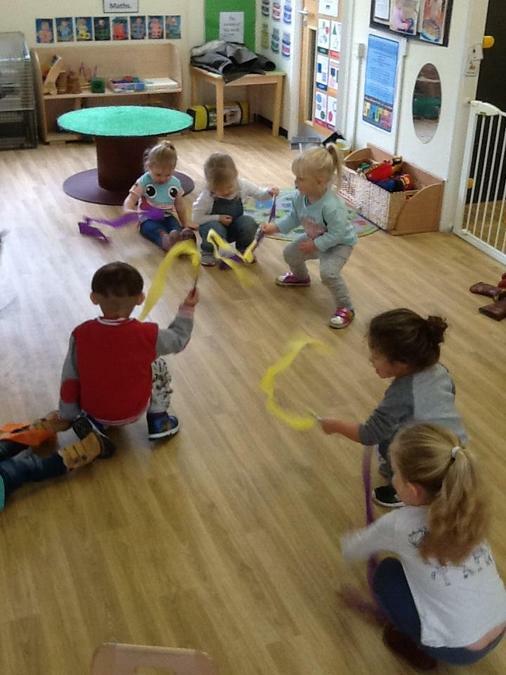 We have done many activities with them where we have introduced them to new verbs and how to extend the word into two words or a simple sentence. 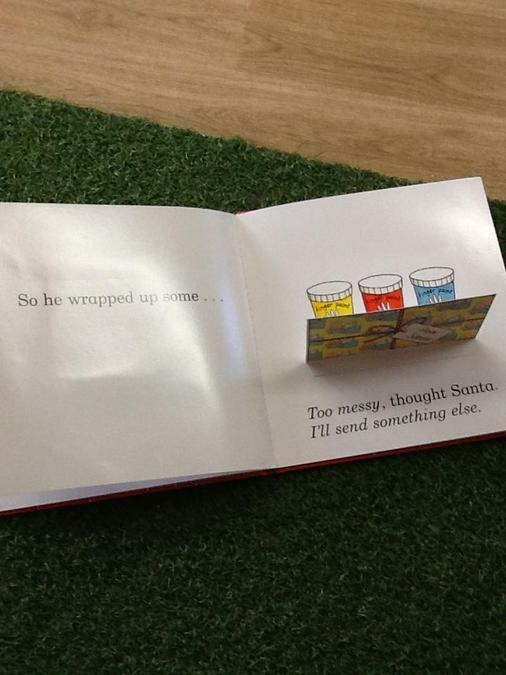 When reading stories at home with your child you can ask them simple what questions to encourage your child to say and use verbs. 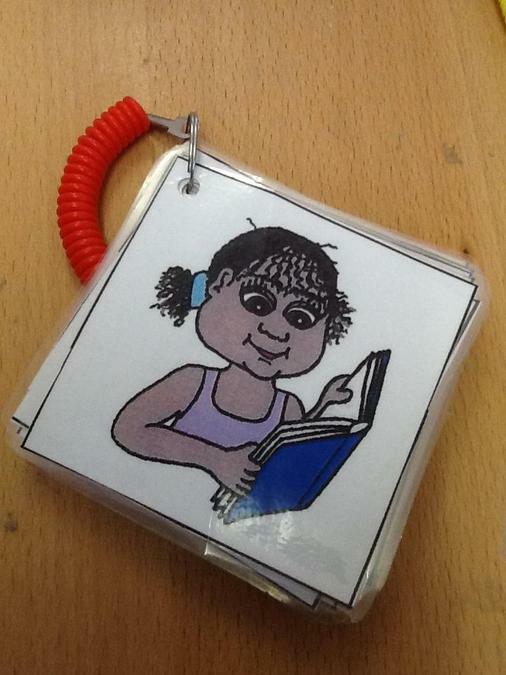 If you would like any support, further ideas or a copy of our verb flash cards then please do not hesitate to pop in and ask Lisa or Kirsty. 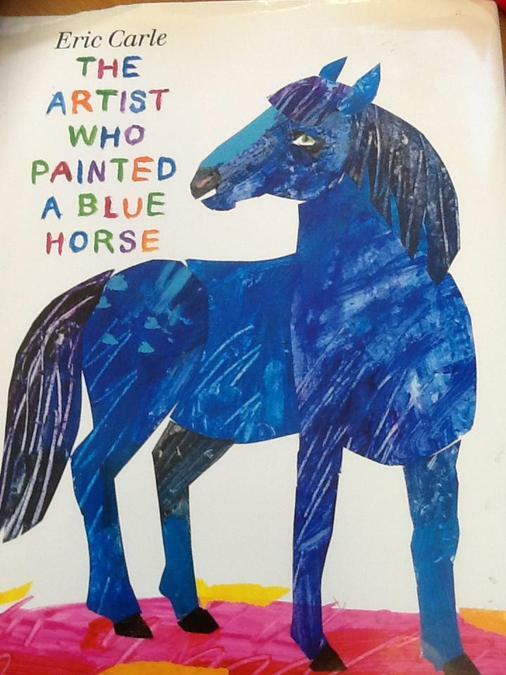 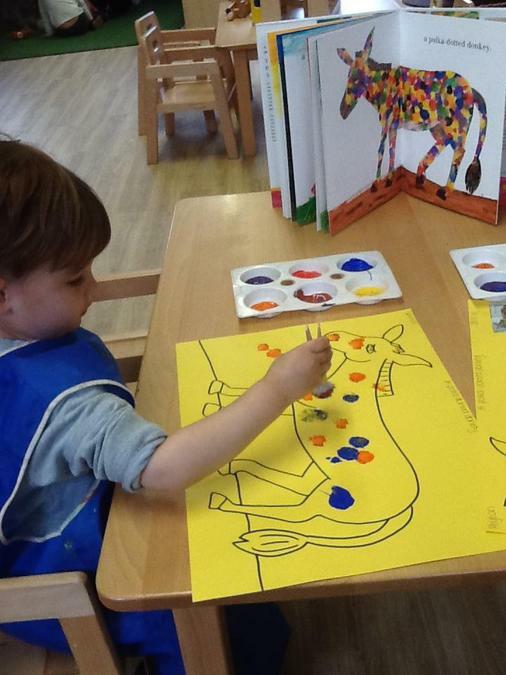 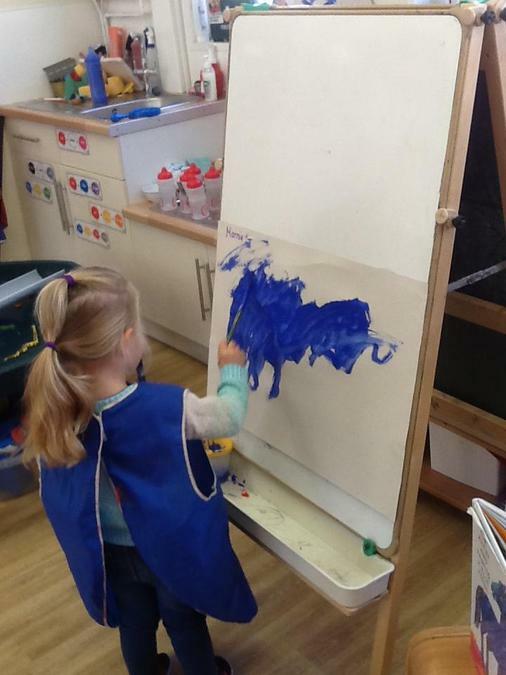 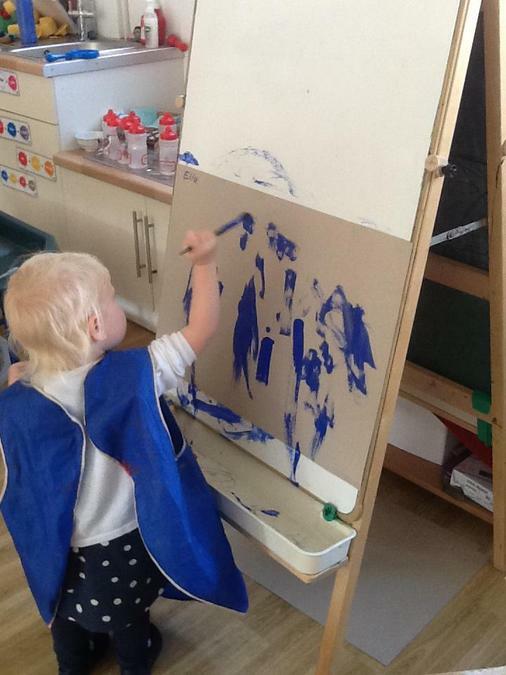 This week we started our theme that is from the story 'The artist who painted a blue horse.' 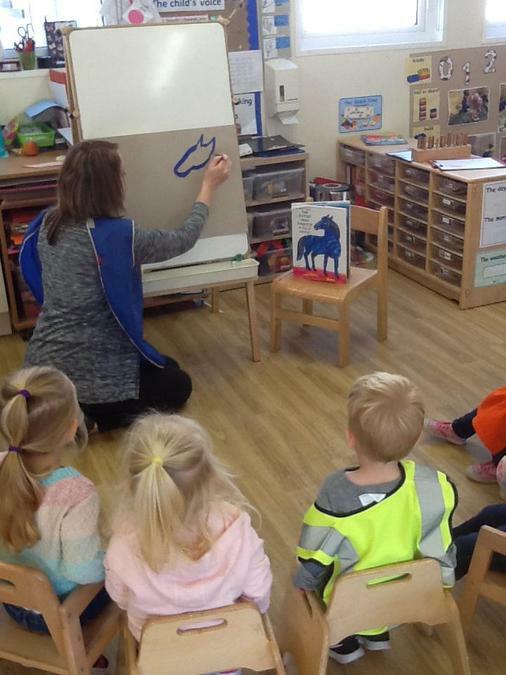 We introduced the story to the children by reading it to them in a group and encouraged them to help name the colours and names of each animal. 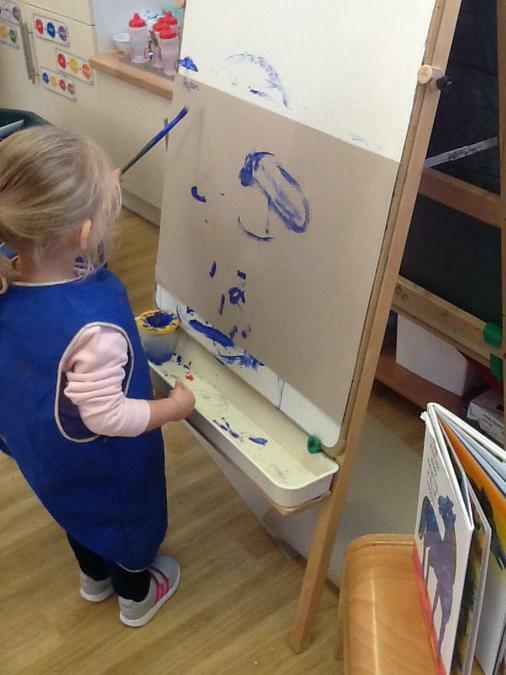 We introduced the children to what an artist is and what they do. 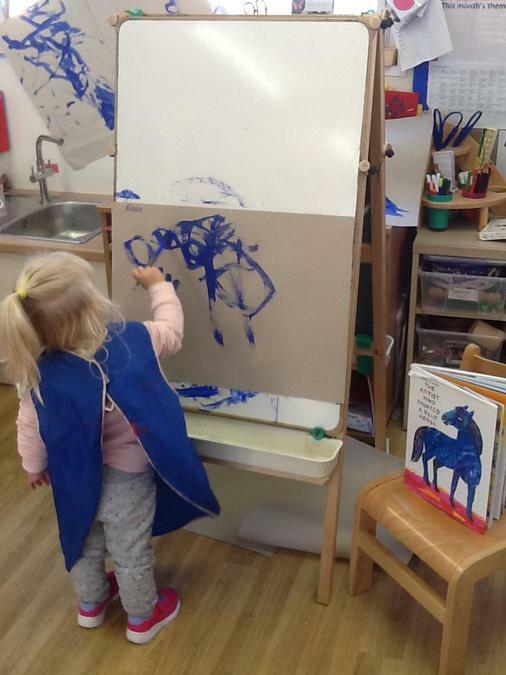 Setting up the easel in our room we modelled to the children how to be an artist and paint a blue horse from the story. 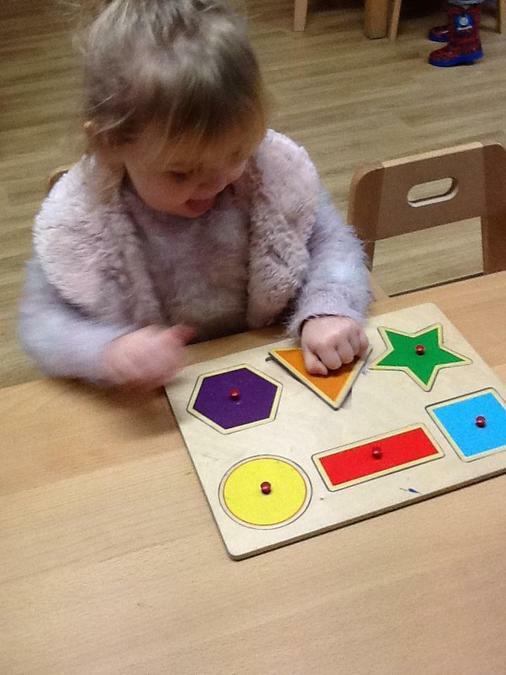 Everyone had a go and we were amazed at how they all showed a good level of focus, excitement and creative ability. 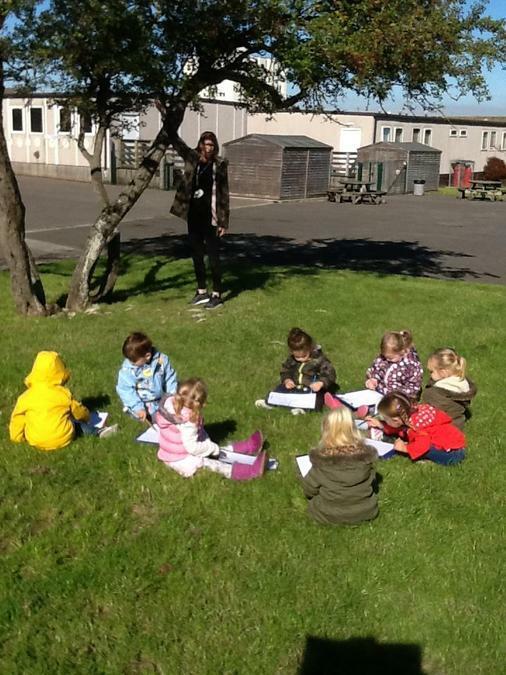 We decided to be artists outside and took our clipboards and pencils with us and sat together to draw a tree. 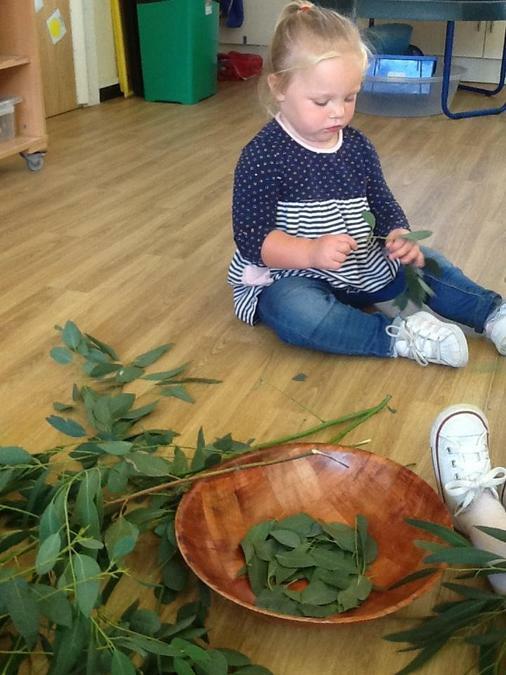 We used lines to create the trunks of the tree and some children used circles for the leaves. 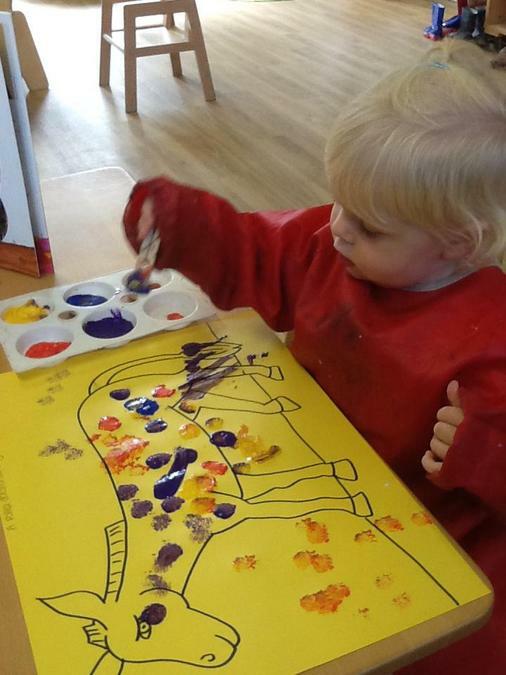 We have done lots of creative activities linking in with the story so far. 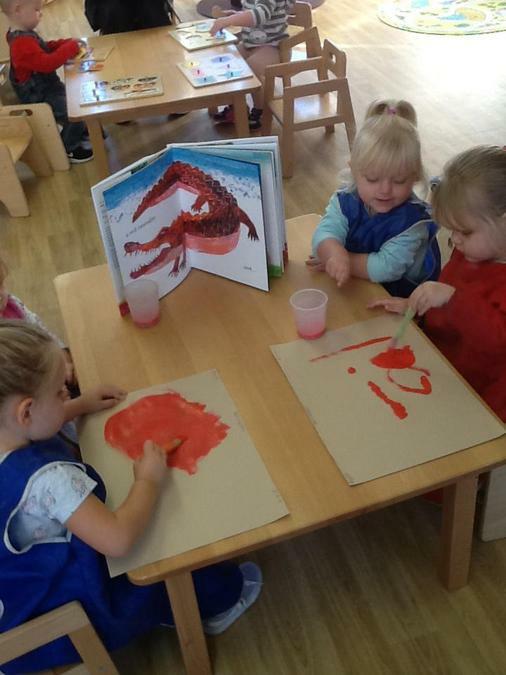 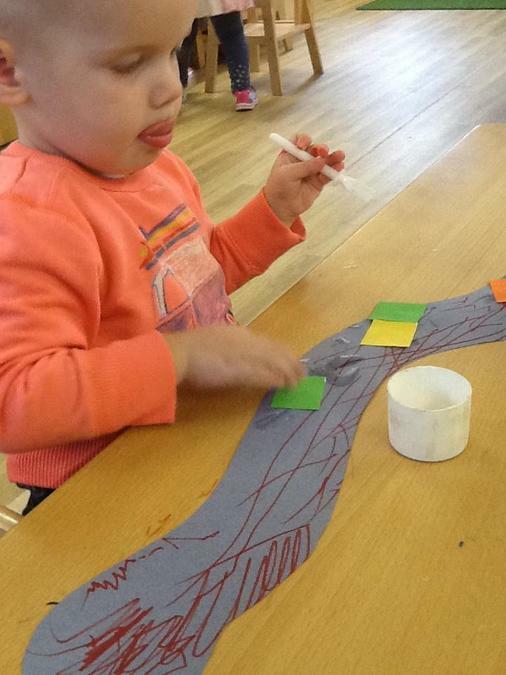 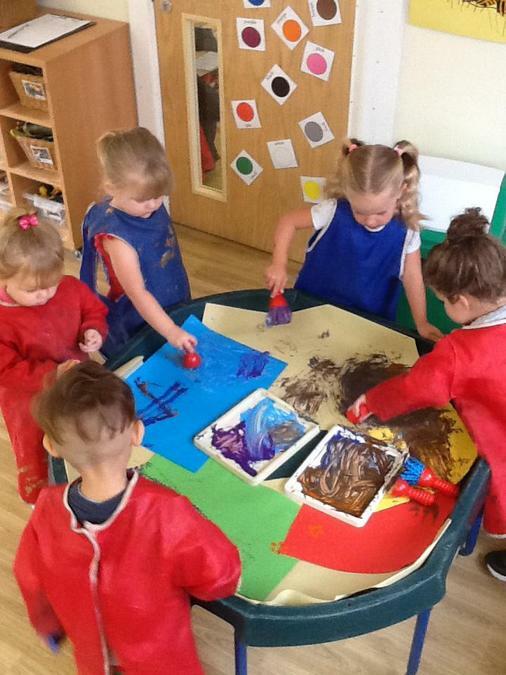 Below you can see the children creating wavy lines on their painted crocodiles by using a lollipop stick. 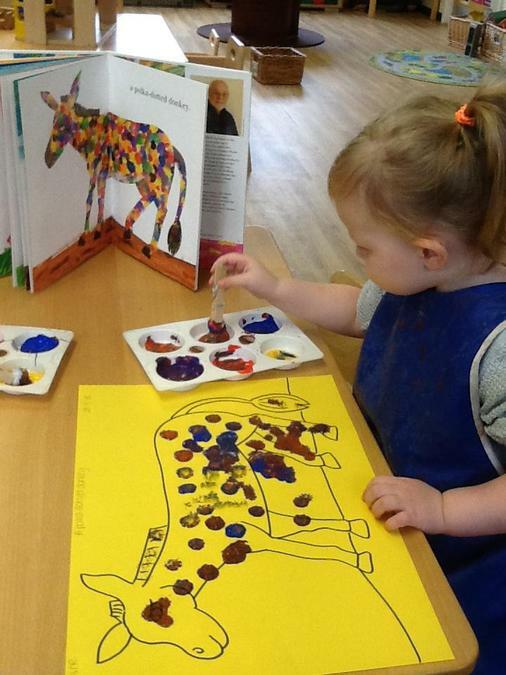 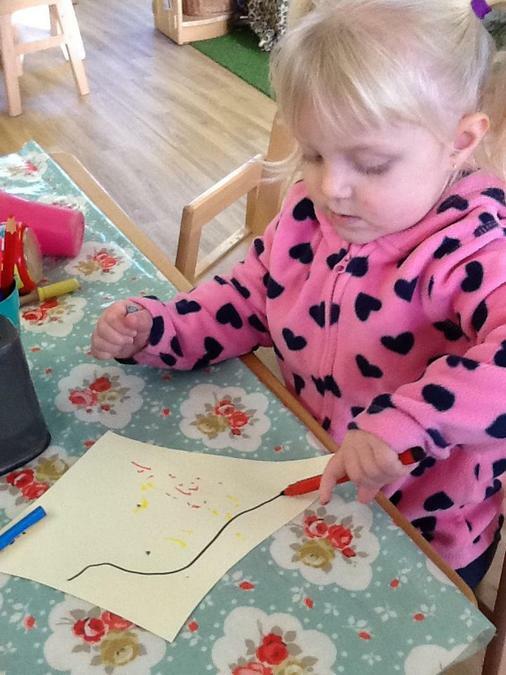 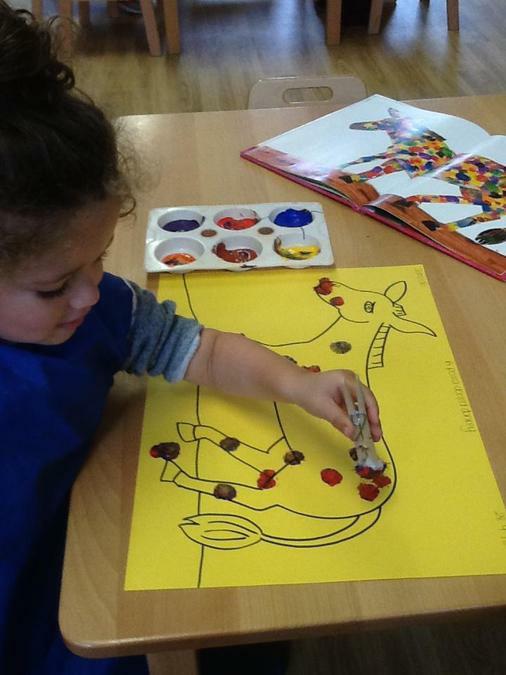 The children also used Pom poms to create the polka dotted donkey. 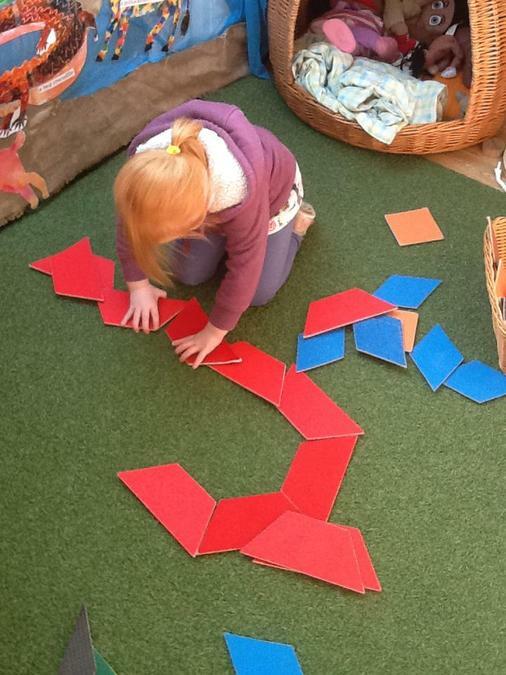 The children have shown an interest this week in the shape tiles. 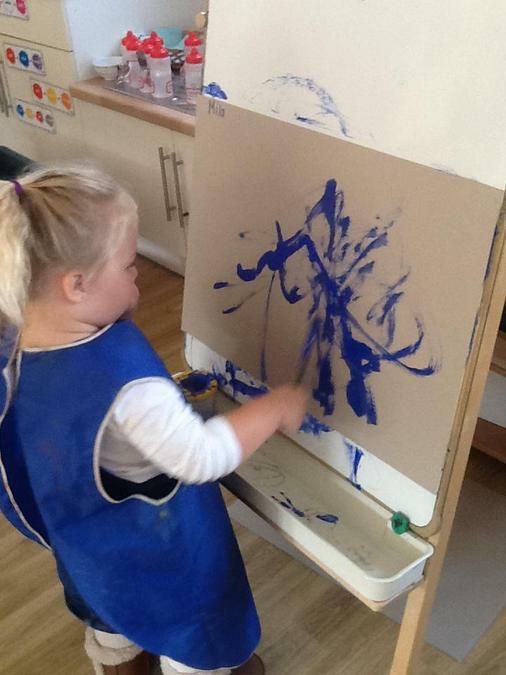 They have been very creative in what they have made. 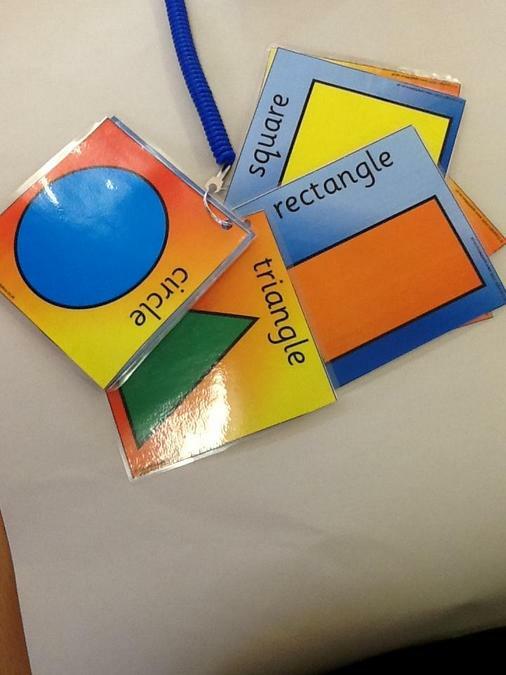 Some children said some of the shapes names. 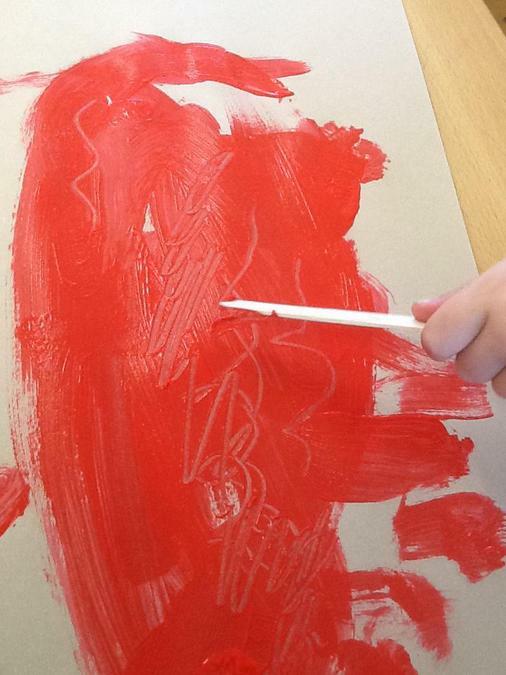 We played alongside them and modelled the rest of the names and colours of each one. 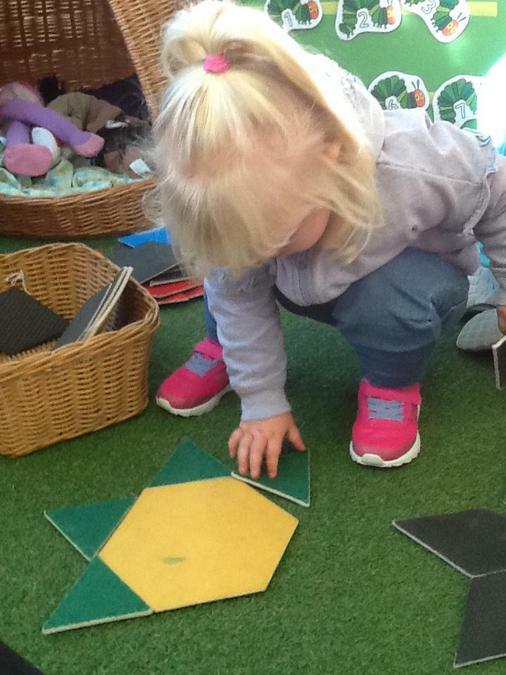 Some of the children were able to tell us what they had made using the tiles. 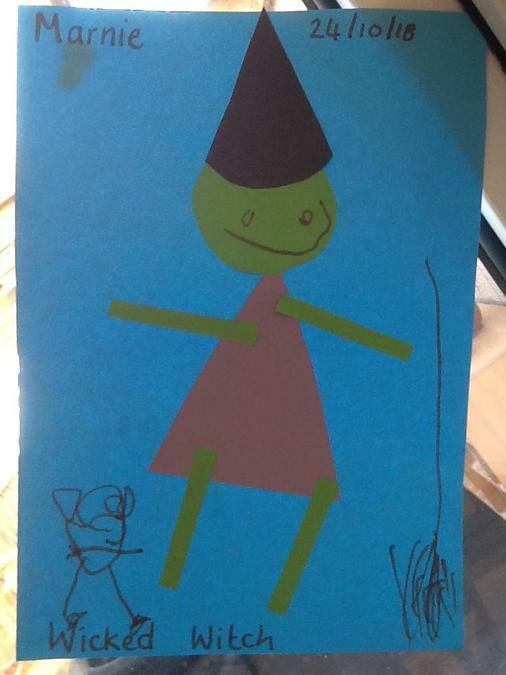 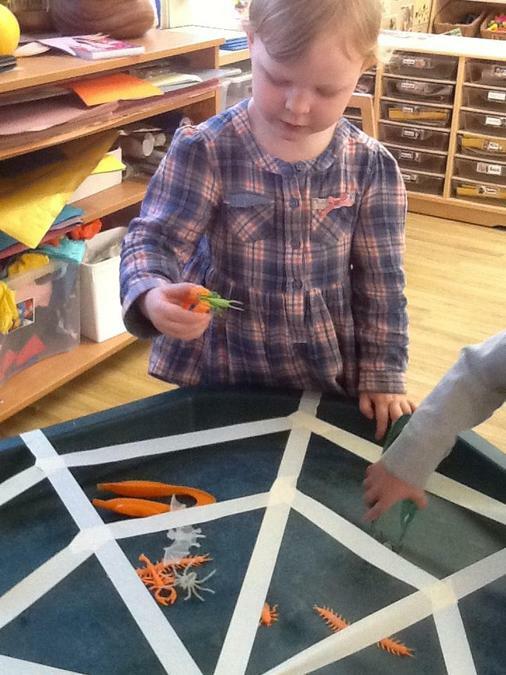 This included a rocket, house, flower and a sunshine. 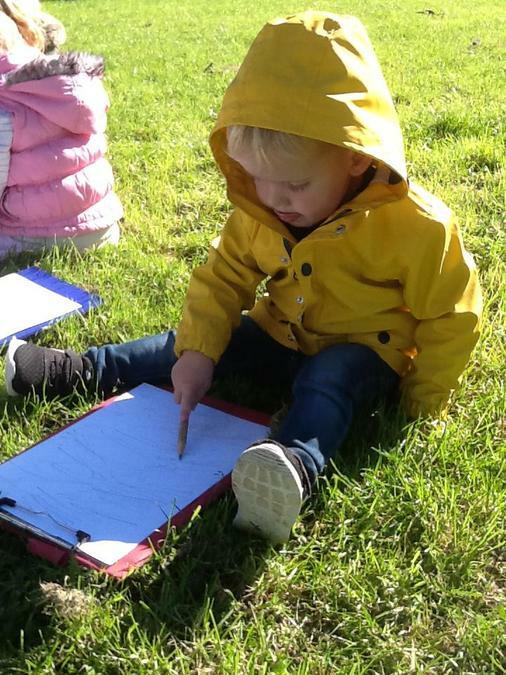 We hope you enjoy looking at the pictures as much as what we did exploring with your child. 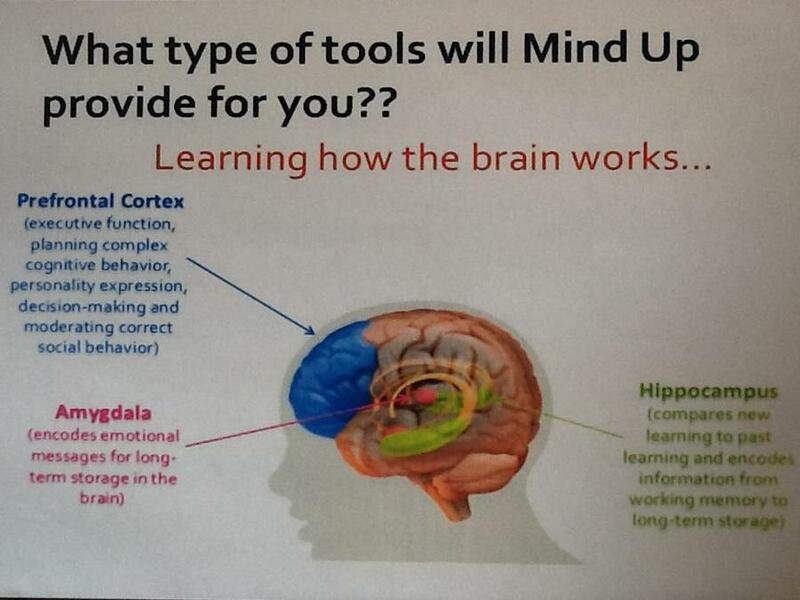 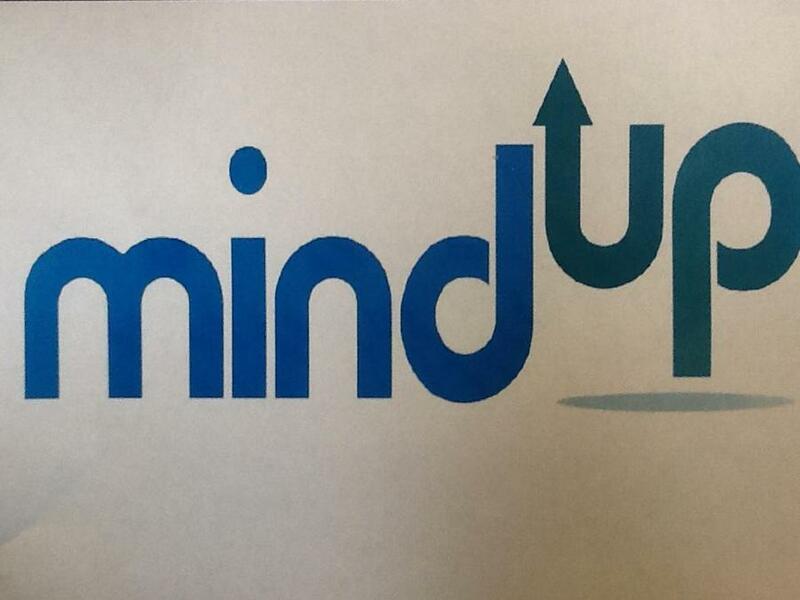 Through school training we have been learning about this new education programme called Mind up. 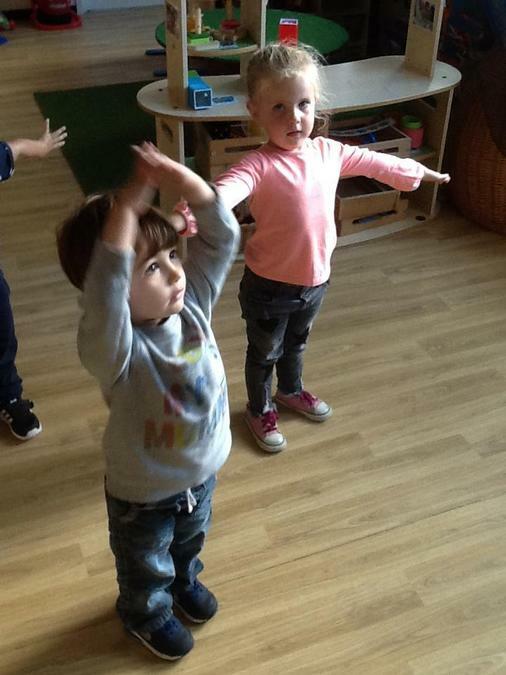 The programme focuses on children's meditations and mindfulness practices that help children to be more focused, calm and relaxed which helps towards their learning. 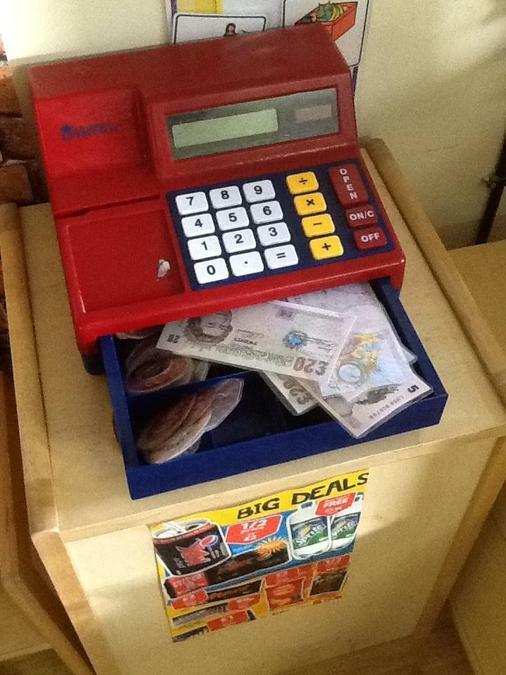 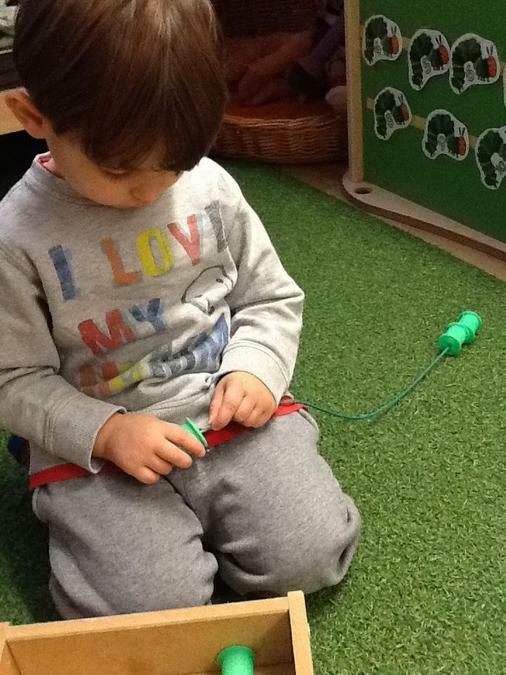 Within Nursery we have introduced this in a simple way to the children. 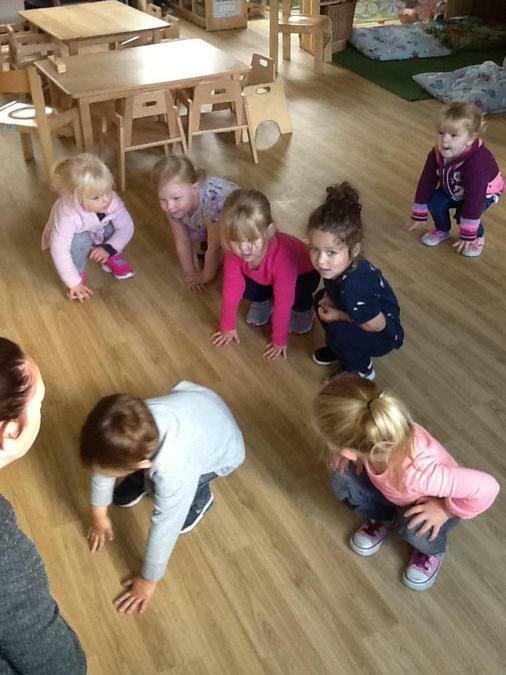 Each session the children participate in a group yoga activity, where all are encouraged to join in and try new ways of moving in a slow controlled manner. 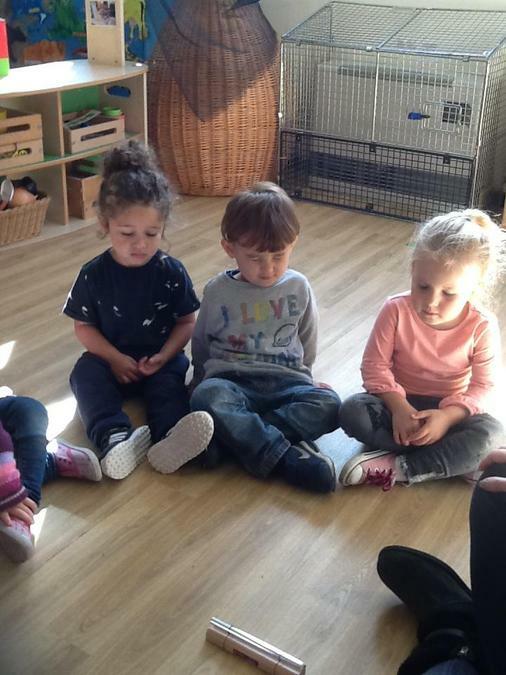 We follow our yoga session with a short meditation activity that we have named 'chime time', during this part we sit in a circle and the children are encouraged to breath in and out slowly to stay calm. 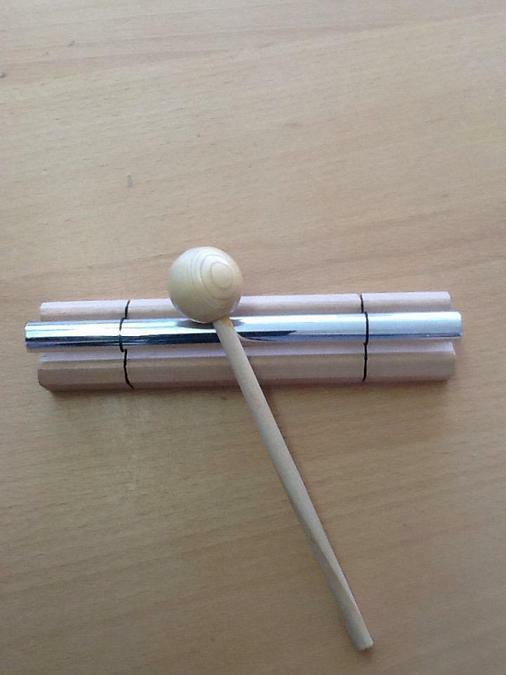 We then close our eyes whilst the chime is struck to focus and listen to the sound, when the sound is no longer heard we open our eyes. 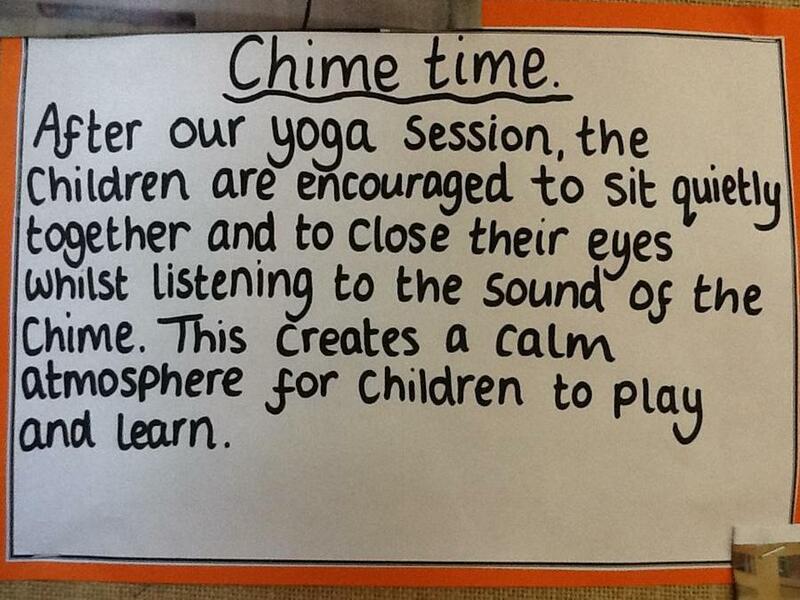 The children have all responded to these short activities of calmness which we have added to our daily routine. 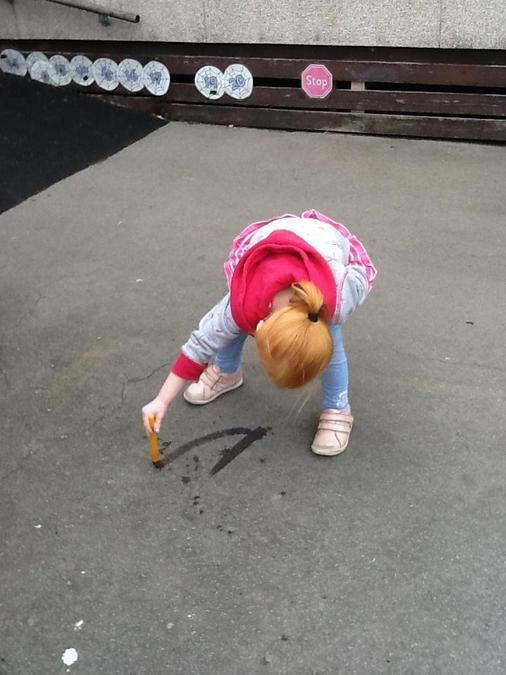 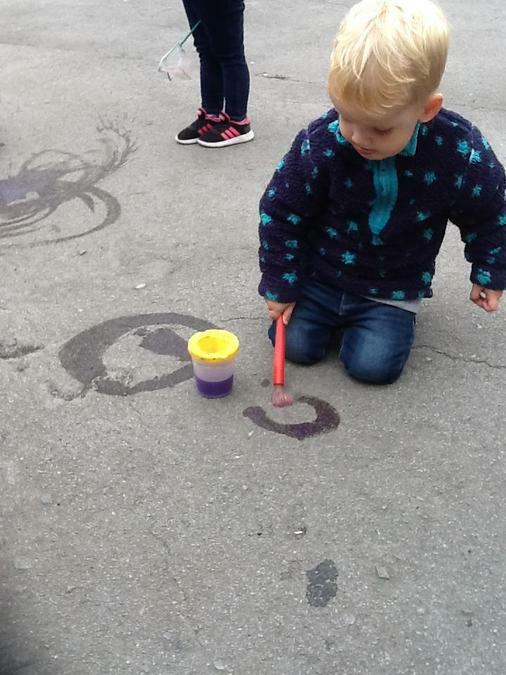 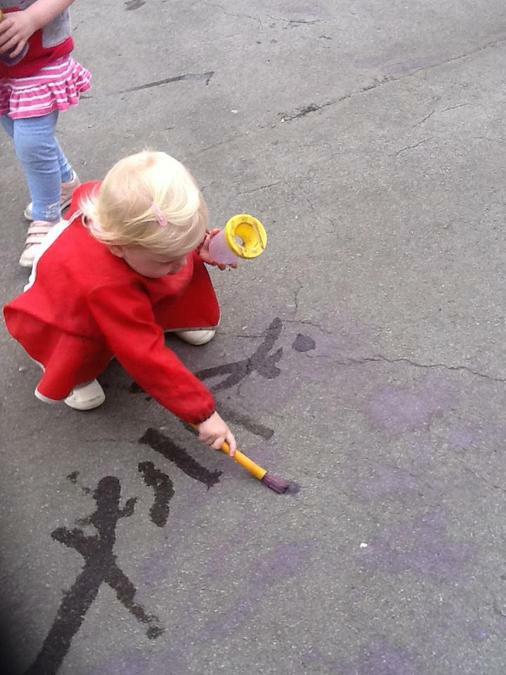 We have taken our mark making out onto the playground to help keep the children interested by exploring ways to create marks in different ways using watered down paint. 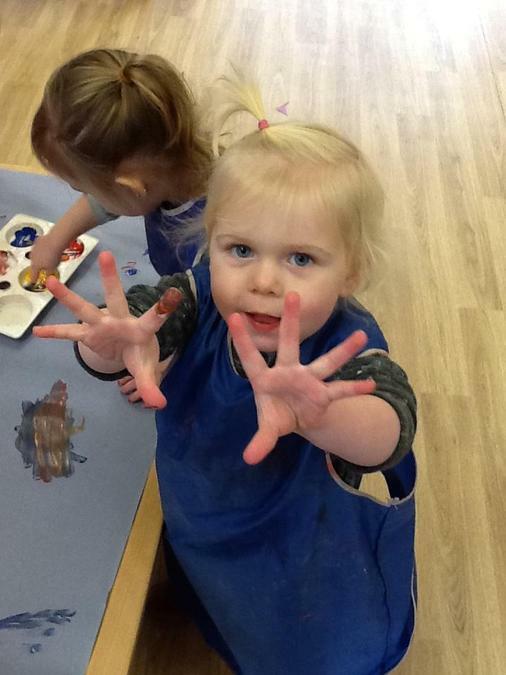 We encouraged the children to paint circles and lines to help them to develop the skills to control the paintbrush, many chose to use a whole hand grasp to hold the paint brush and showed good coordination. 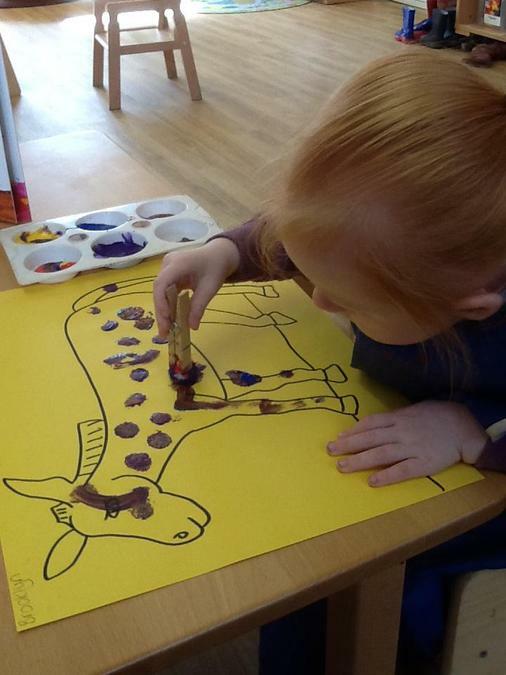 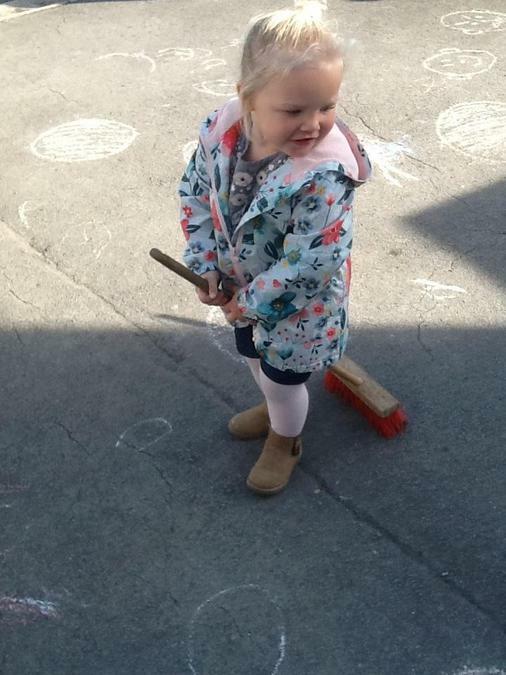 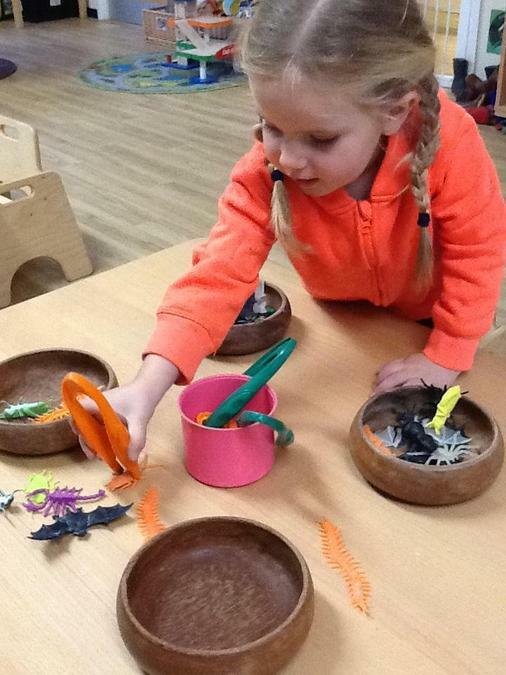 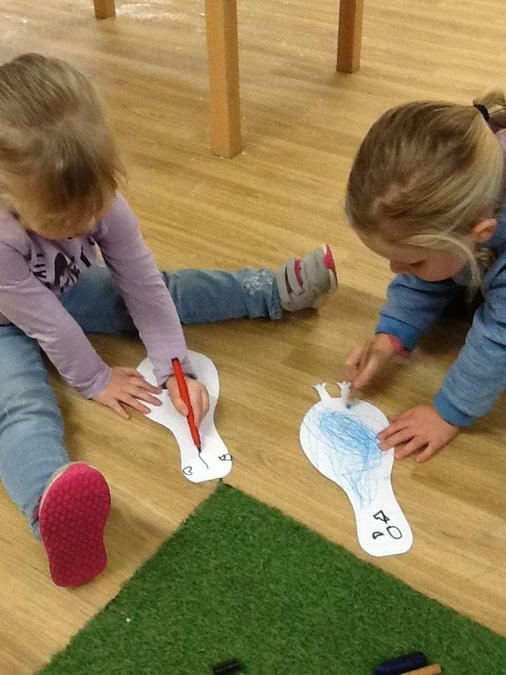 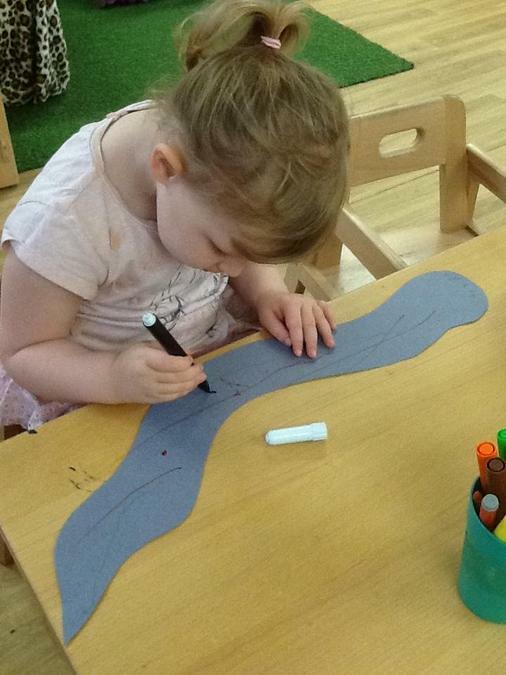 Simple activities like this are very important for the children to develop gross motor and fine motor skills which helps towards their writing skills in Preschool and Reception. 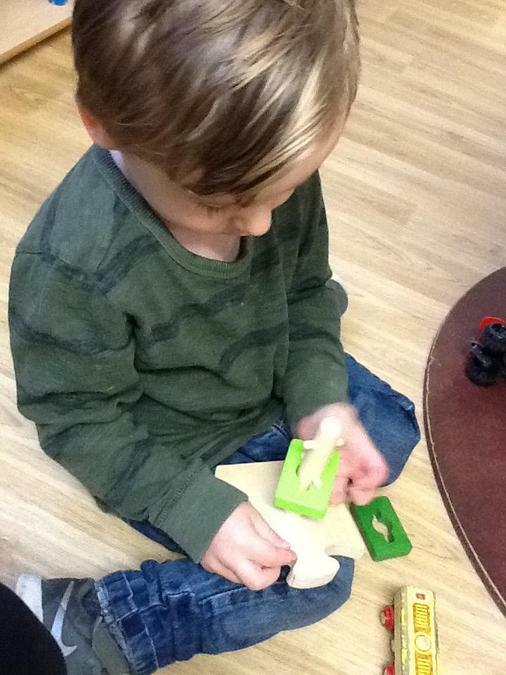 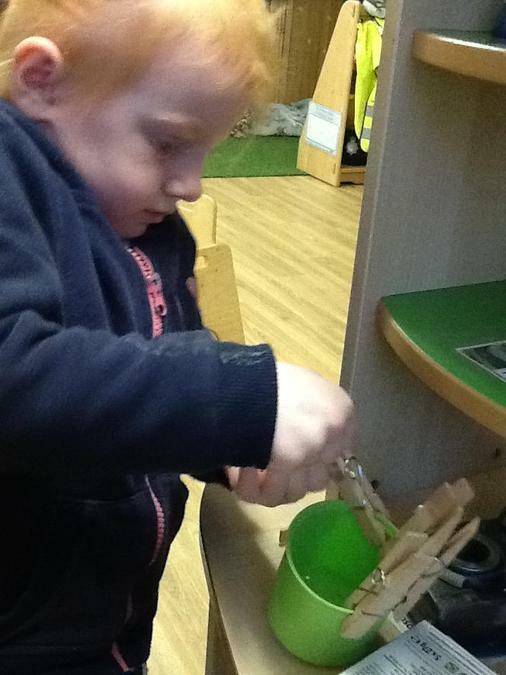 We have been practising using one handed tools this week and the children are improving every day! 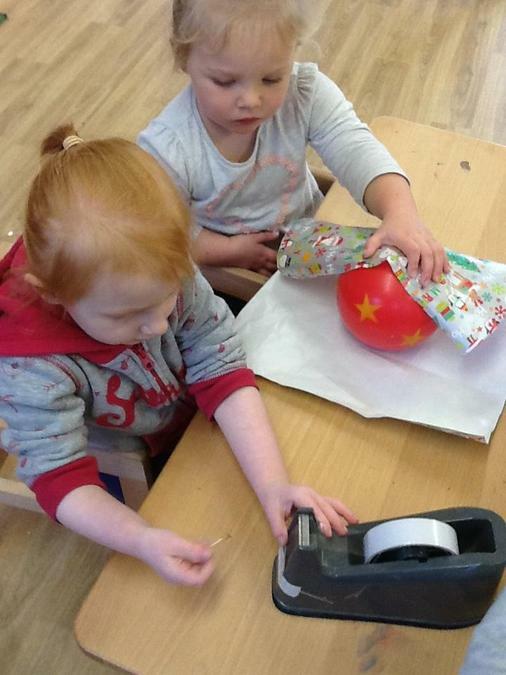 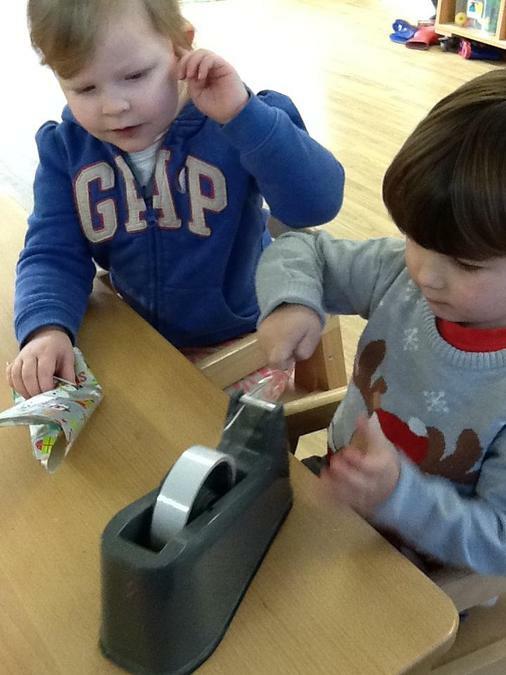 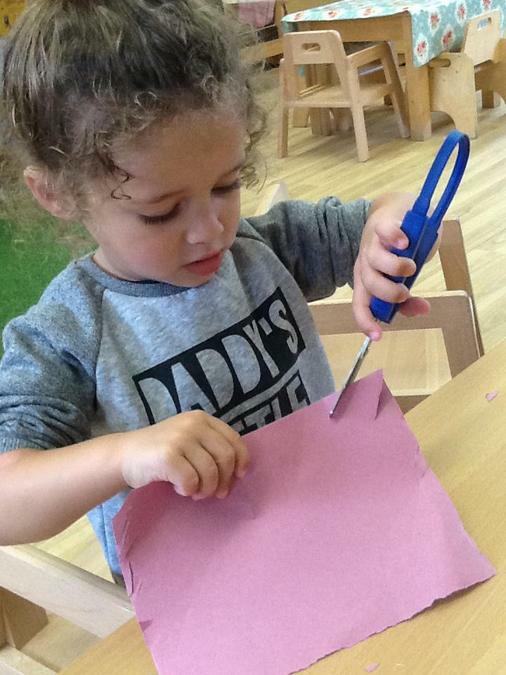 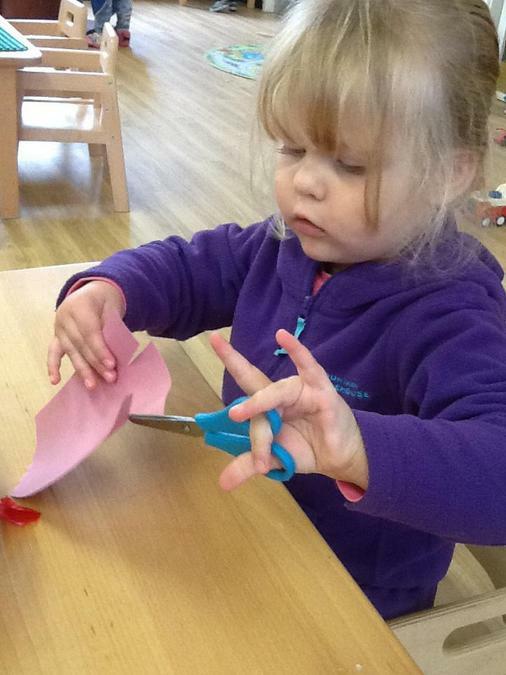 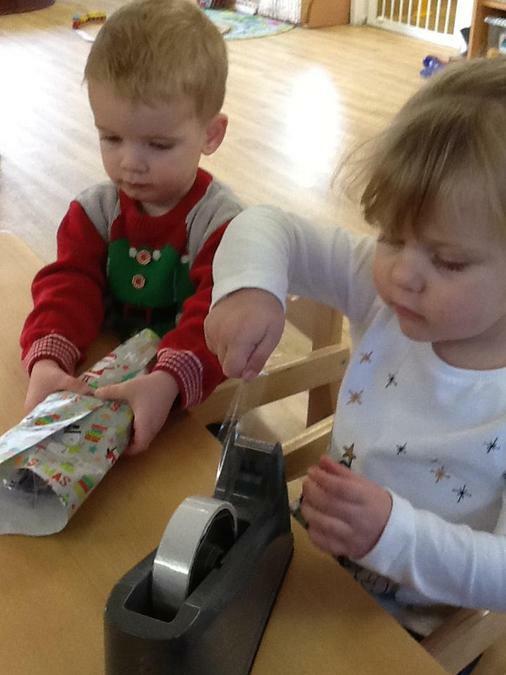 They are becoming more confident and stronger in their grasp as they hold the regular scissors or Palm scissors to create small cuts along the edge of the paper. 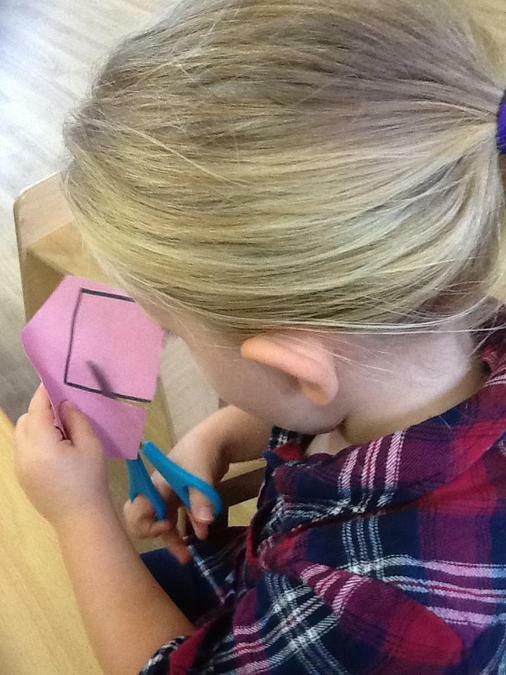 We are also focusing on learning how to continuously cut across a whole page. 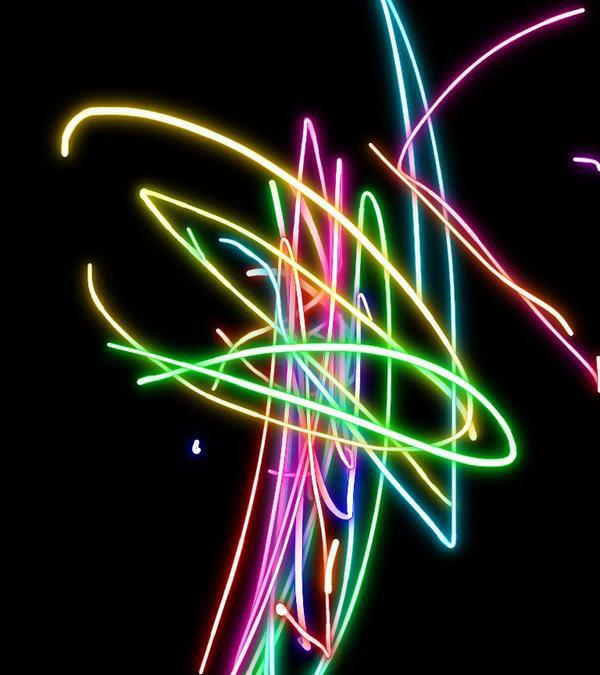 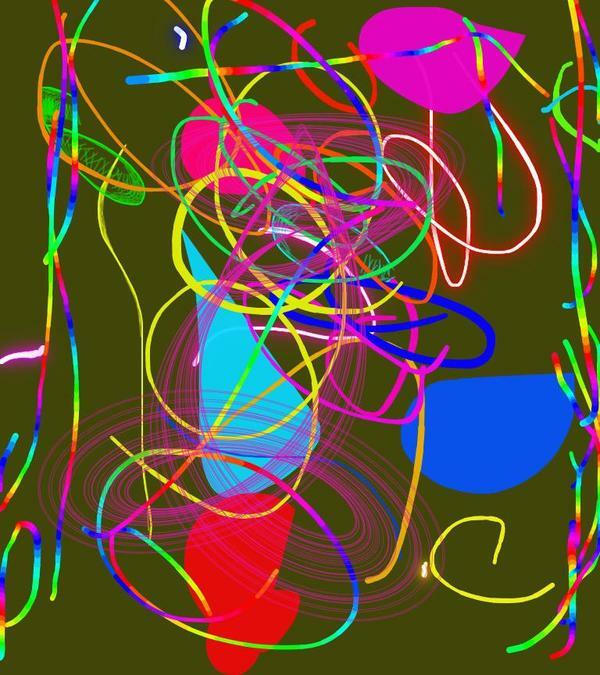 Here are some of the children's ICT pictures they created using the app on our IPads. 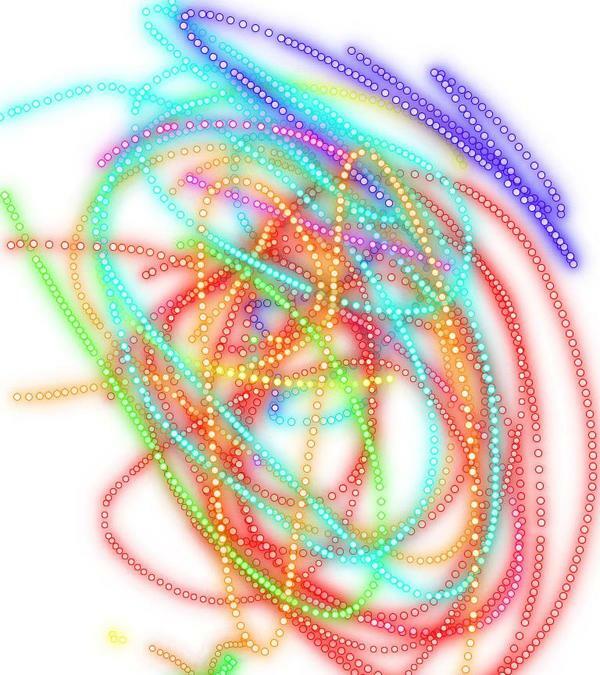 The children have learnt how to use the app, being able to touch the icons on the screen to change the pen so that it creates a variety of marks. 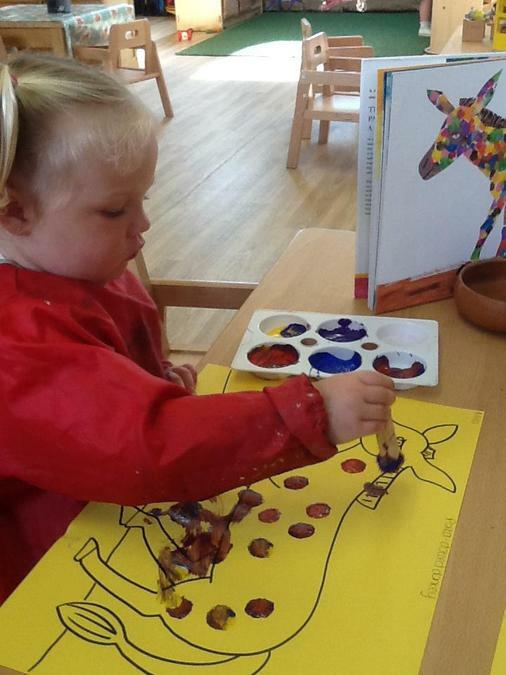 They have been extremely proud of their finished pictures so we thought we would share them with you. 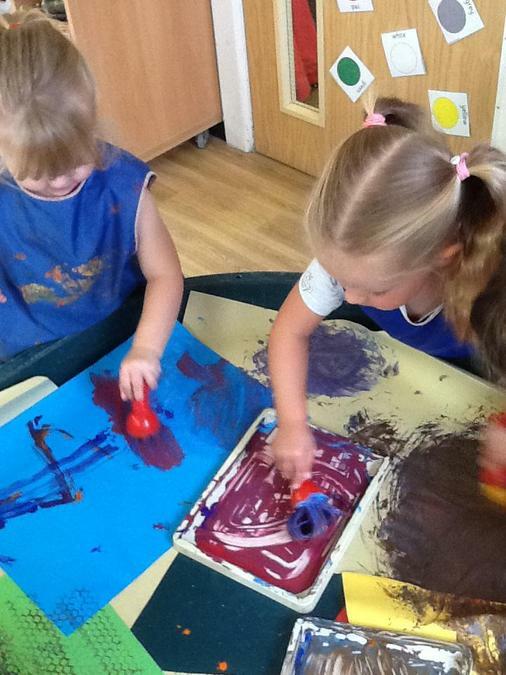 We also modelled and introduced the children to the colour names that they were using. 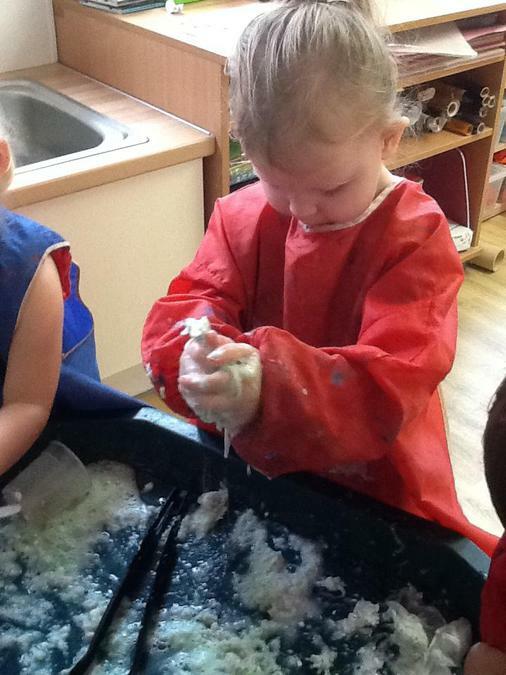 The children enjoyed a messy sensory activity of making mud dough this week. 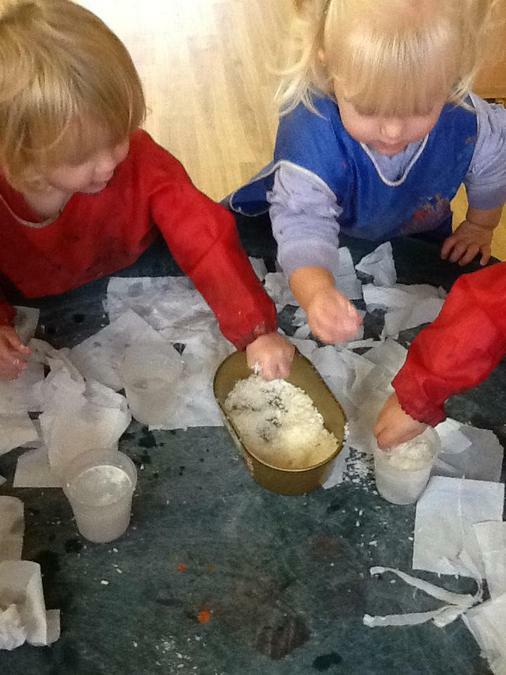 The ingredients are tissue paper, water, and grated soap. 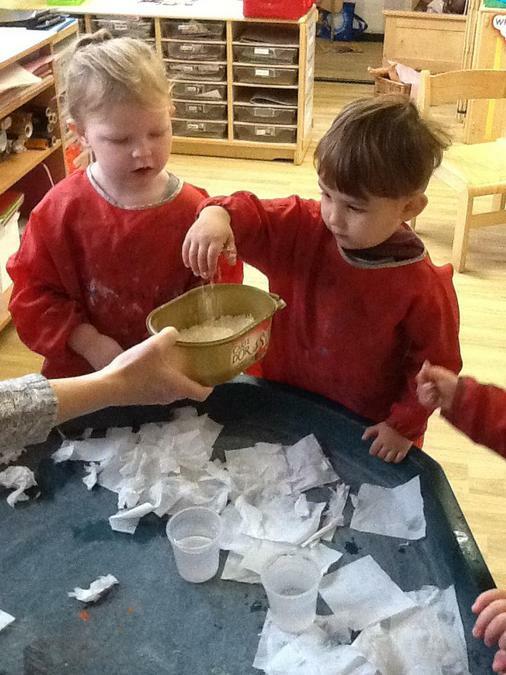 The children had fun exploring all the ingredients by using all their senses by smelling, touching and listening. 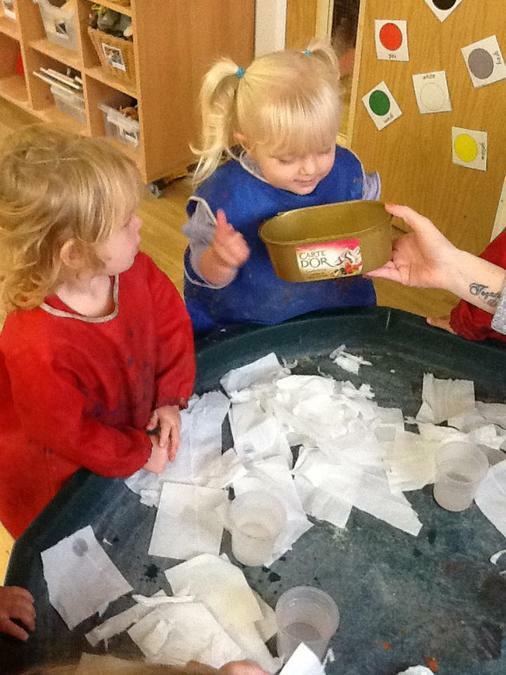 We smelt the tissue paper and soap. 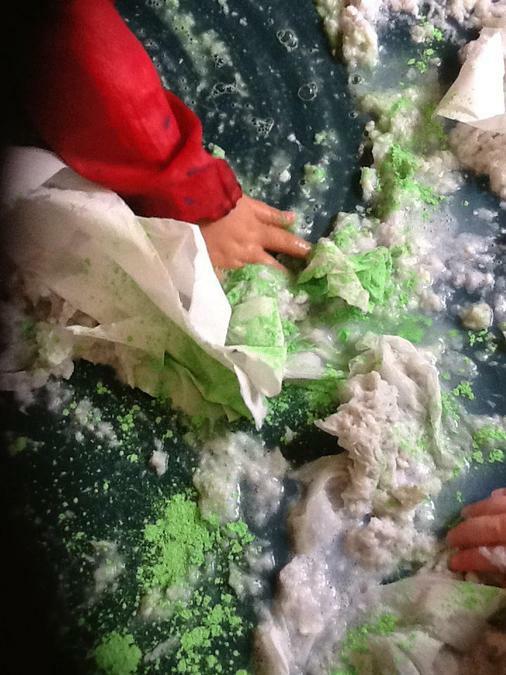 We experienced the textures of each one and used new language such as soft, wet, dry, hard. 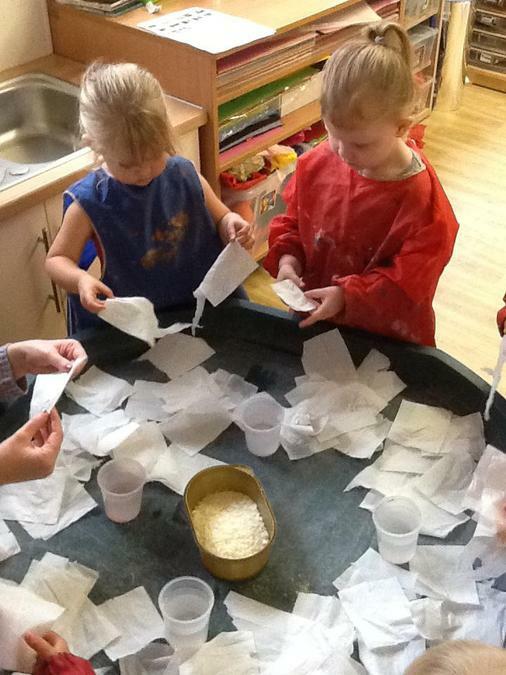 We then modelled how to listen to the paper tearing, the soap sprinkling and the water dripping. 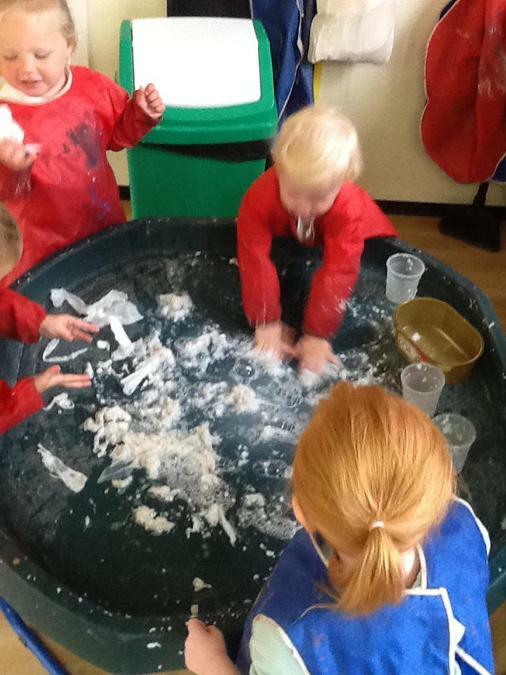 Last of all the children got stuck in and mixed the ingredients around until it created the mud dough. 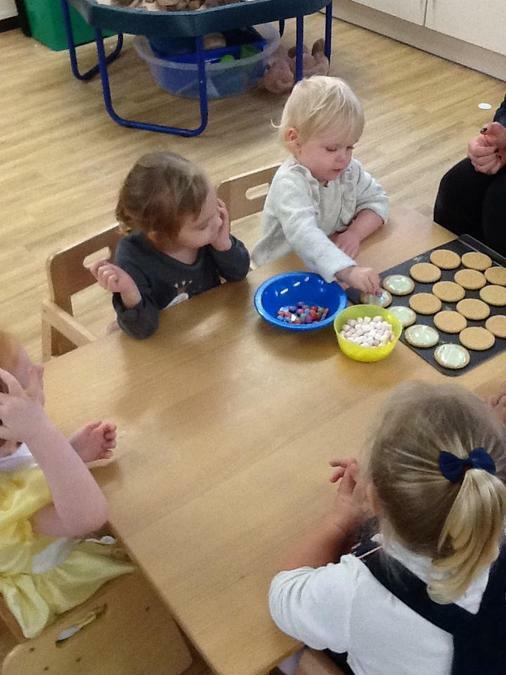 Some of the children noticed they were able to make marks in the dough and created circles, lines and rainbow arch shapes. 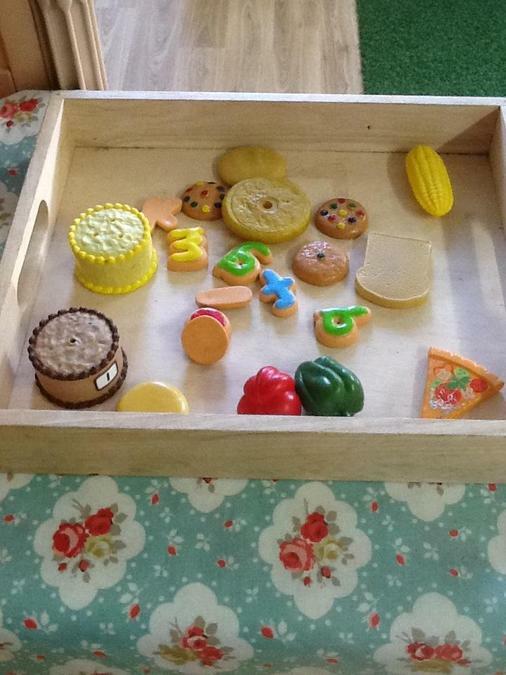 We kept the dough for several days and added different thing to it to extend the child's play and interest. 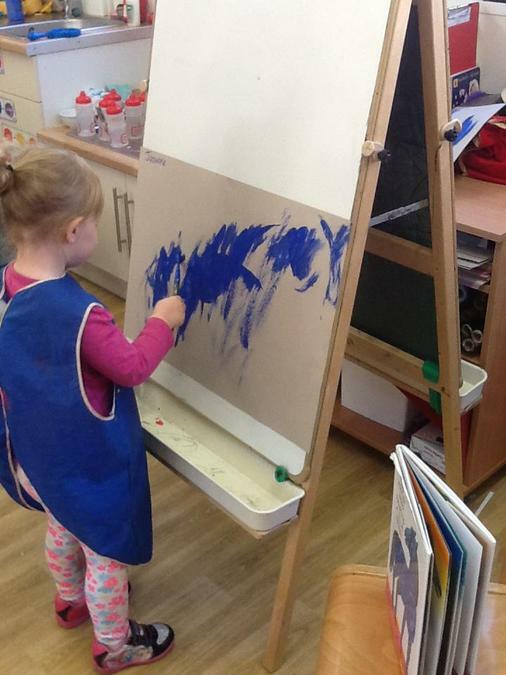 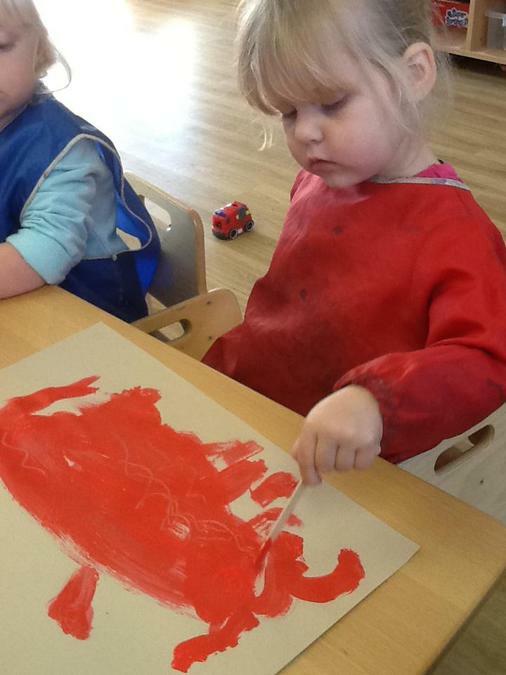 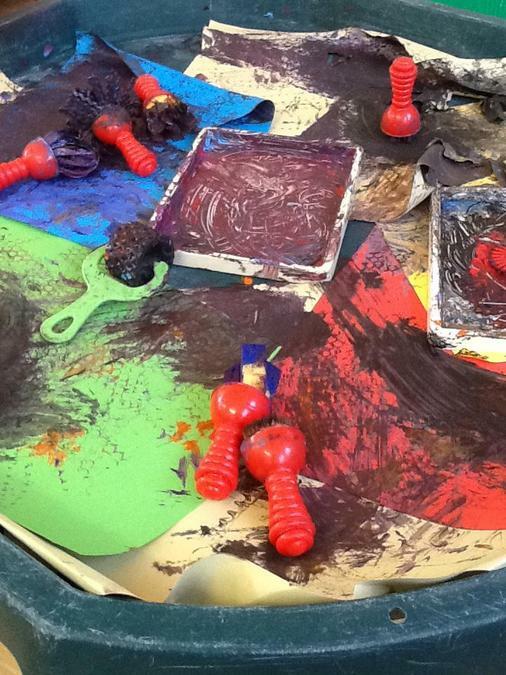 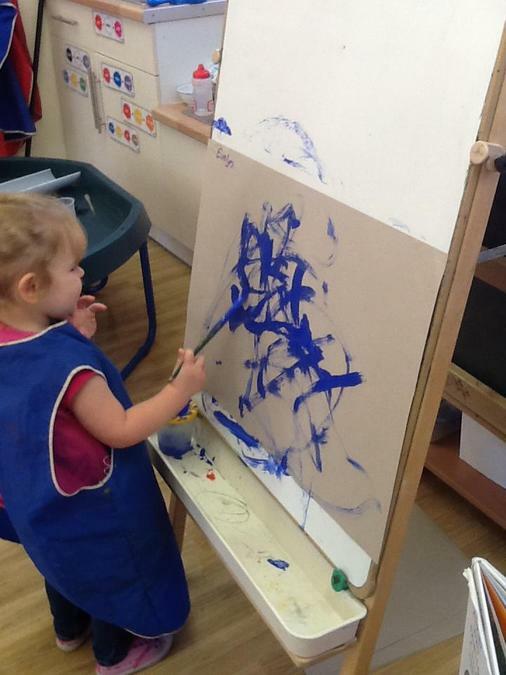 We have been busy mark making with the paint and new mark making tools as soon as we came back this week. 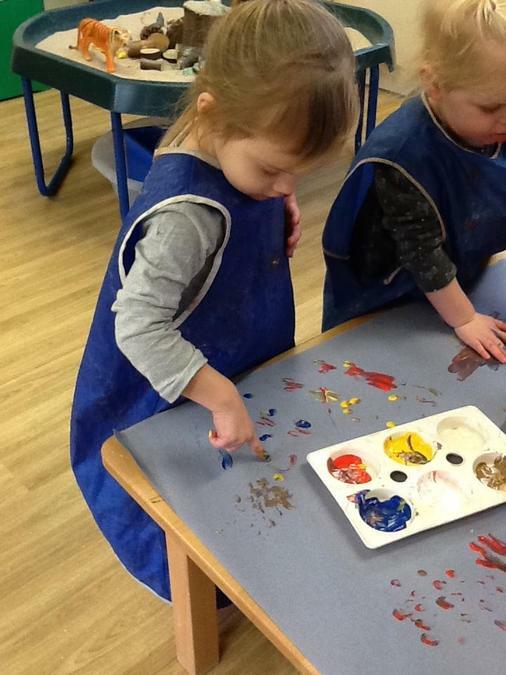 The children got stuck in and involved immediately, showing high levels on interest and fascination as they mixed the colours together. 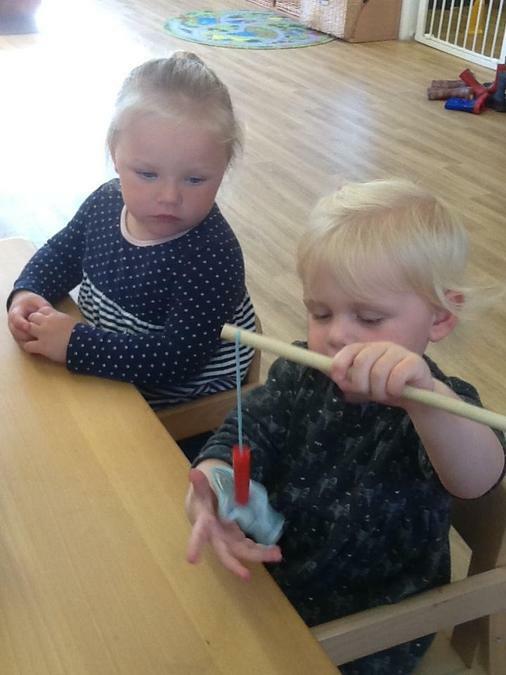 The children are developing their control whilst holding the tools and beginning to decide which hand is the more dominant hand to use. 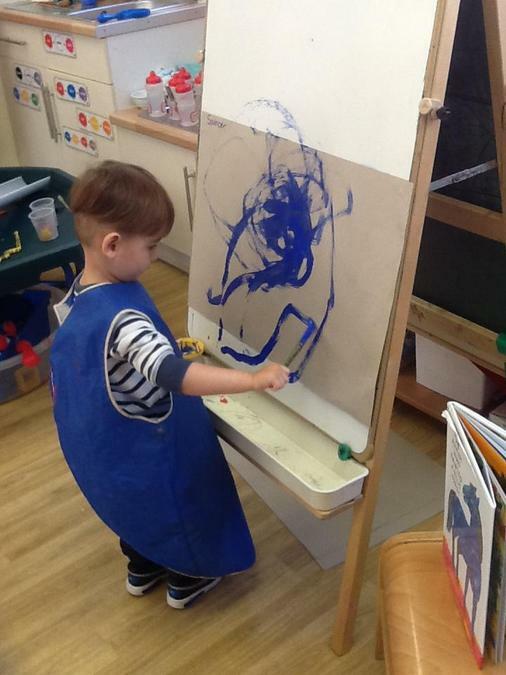 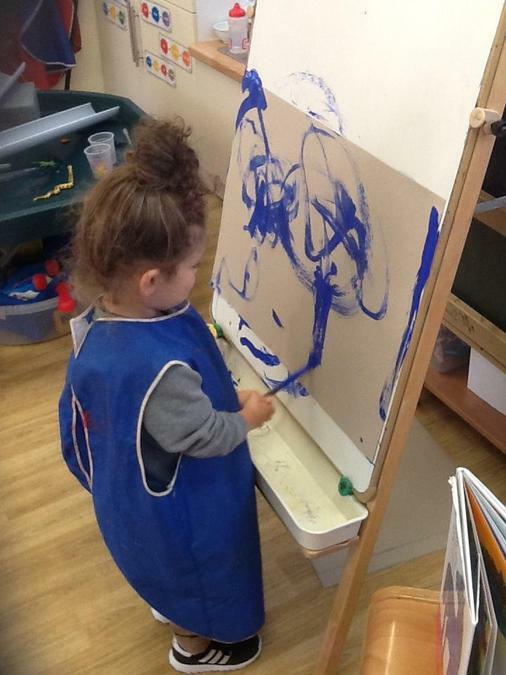 We will change and adapt our painting activities so that it is coming from the child's interest/fascination. 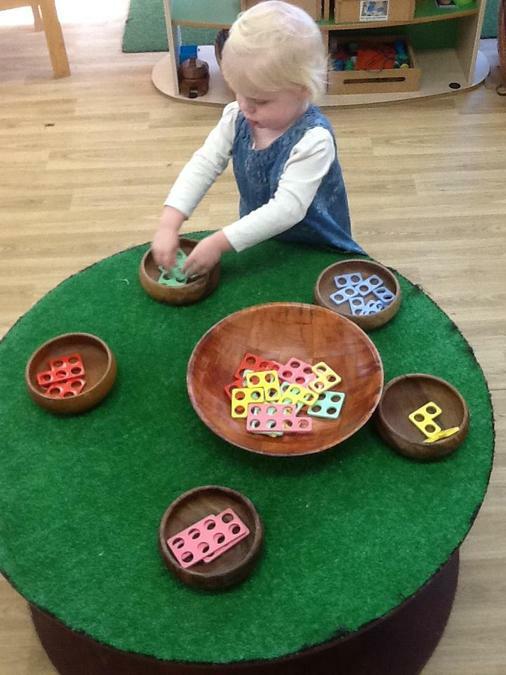 This will keep the children engaged and interested for longer periods of time. 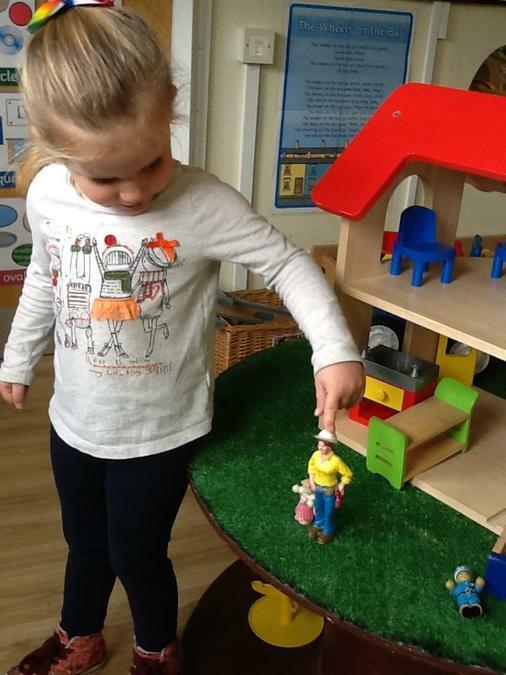 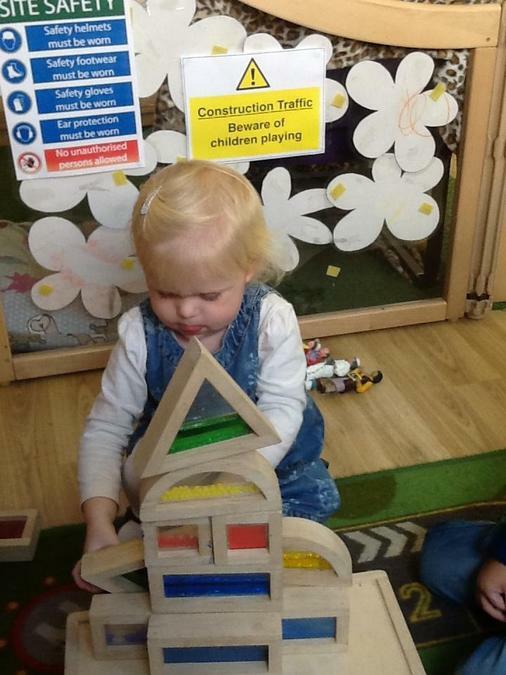 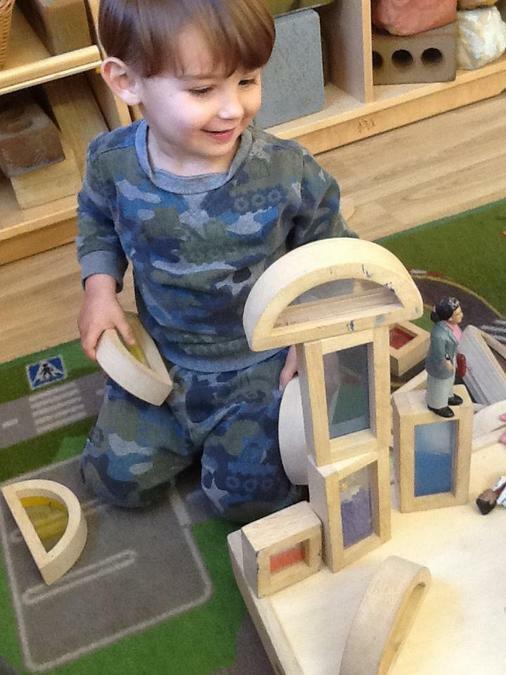 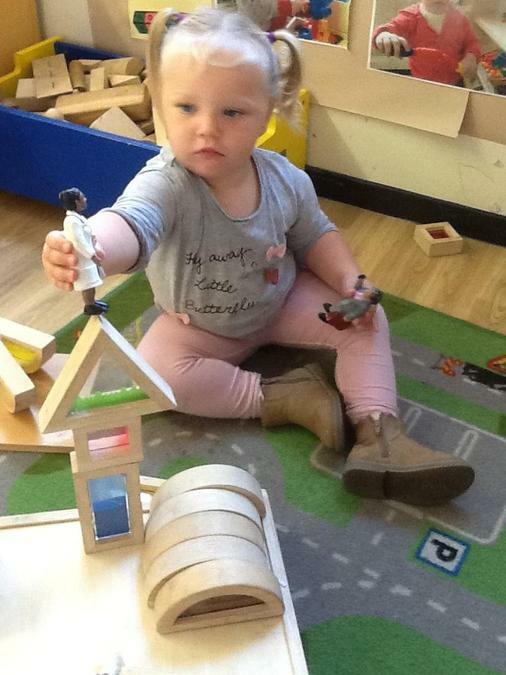 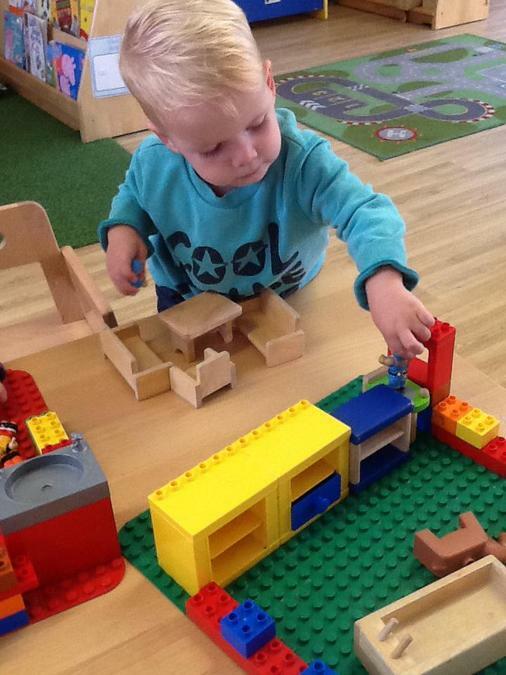 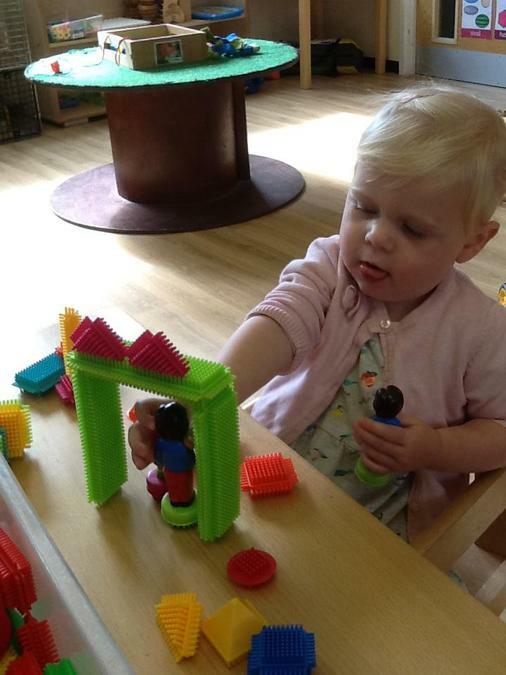 Lots of small world play has taken place this week. 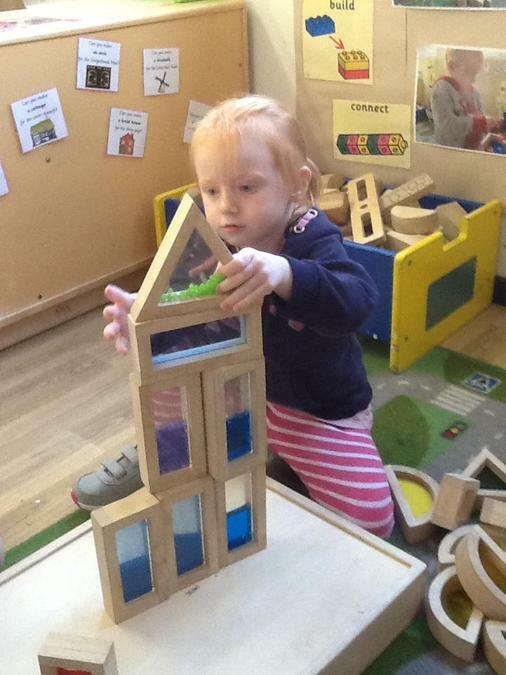 The children really are showing an interest in the small world people, creating homes for them and acting out everyday experiences. 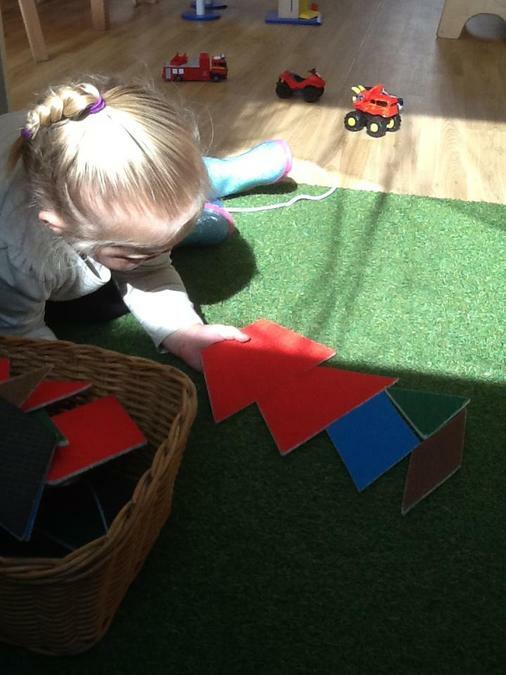 We play alongside them introducing the children to new language and scenarios extending their own knowledge and experience. 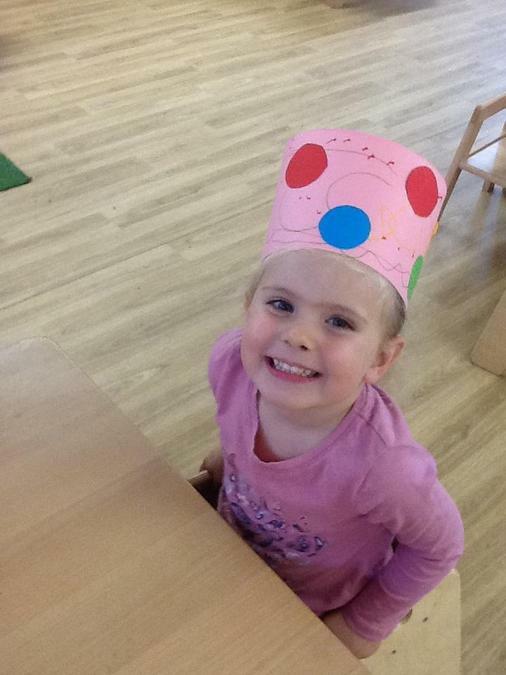 We would like to welcome you all back after the summer and hope you and your family have had a lovely time together. 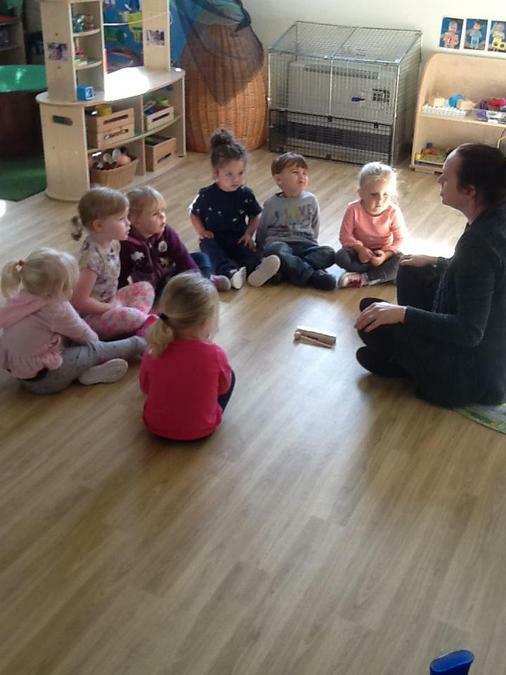 We would like to welcome all our new children that have recently started with us and we look forward to working with you and your family in the future.